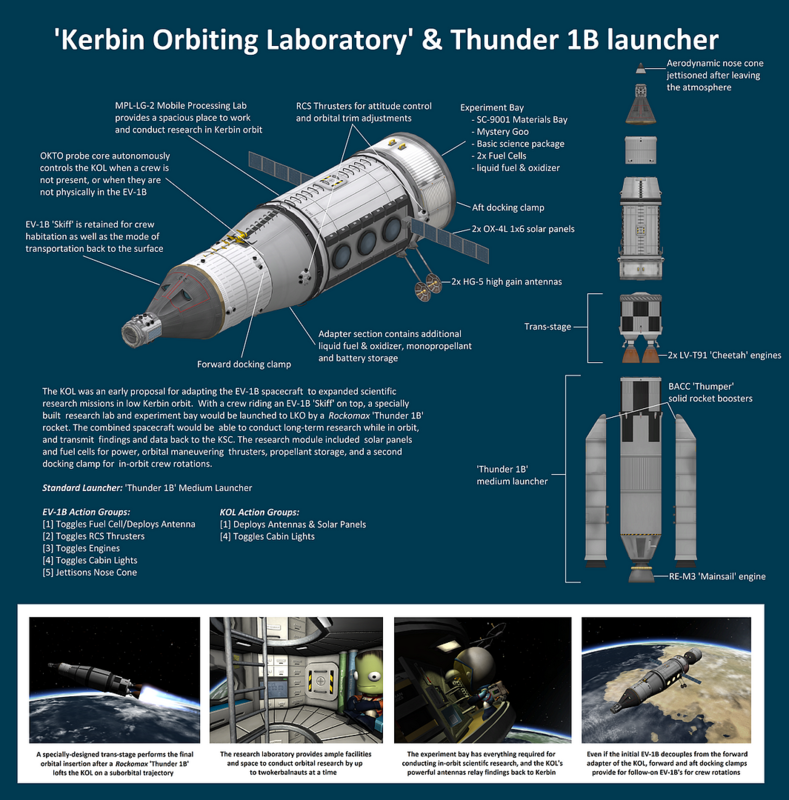 This thread is where I organize and present all the craft and subassembly files I currently offer on KerbalX for free download. First of all, I'd like to thank @katateochi for his administration and maintenance of the KerbalX website. It's a user-friendly, fan-driven site that allows community members to exchange craft files for use, modded or stock. 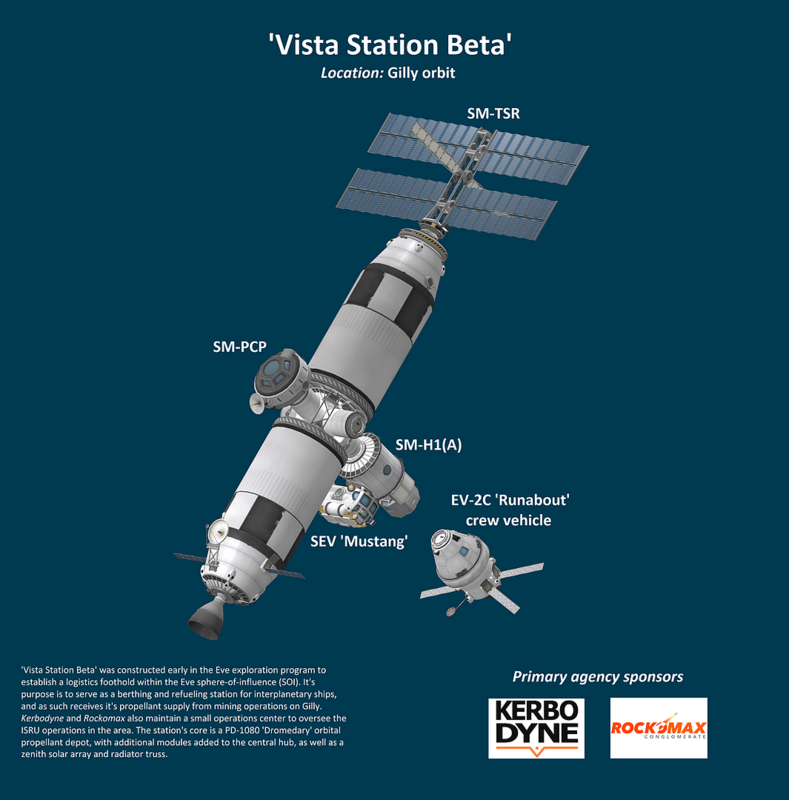 If you're an avid user of the KerbalX site, please help support it by donating via links on the main KerbalX page. 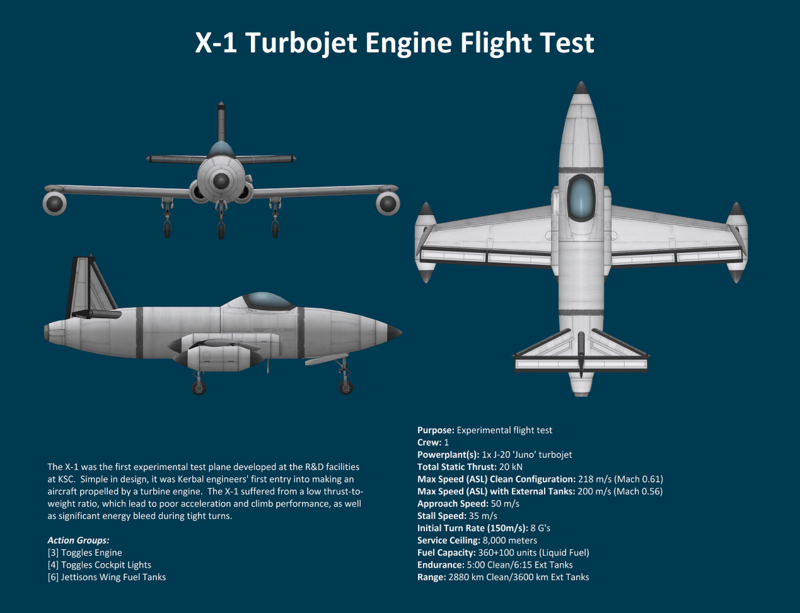 Any craft you see in this catalog has been thoroughly tested to perform as intended, and is accompanied by a graphical image to show other players how to use the craft. These graphics are meant to shed light into what went into the design, how the action groups are programmed, and other important tidbits. Additionally, if necessary, "Engineer's Notes" have been included next to each download link for critical information that may not be included in the respective graphic, or may not be readily apparent. 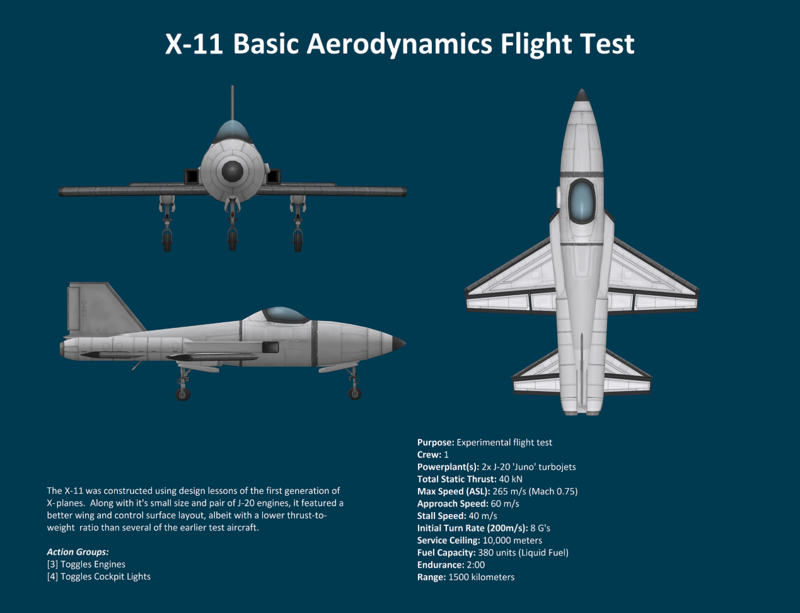 Although I have been playing KSP since v0.13, I am not perfect. Whenever I (or other players) find issues or defects with my craft, I update and republish. 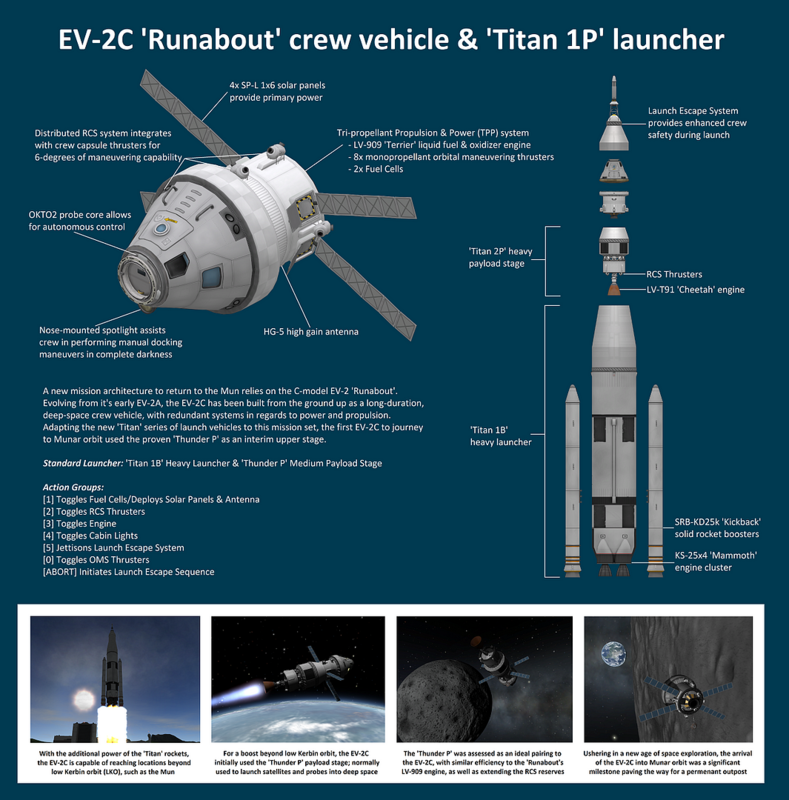 Some of these designs have been around for several years, and have continued to evolve along with KSP and my personal build style and skills. 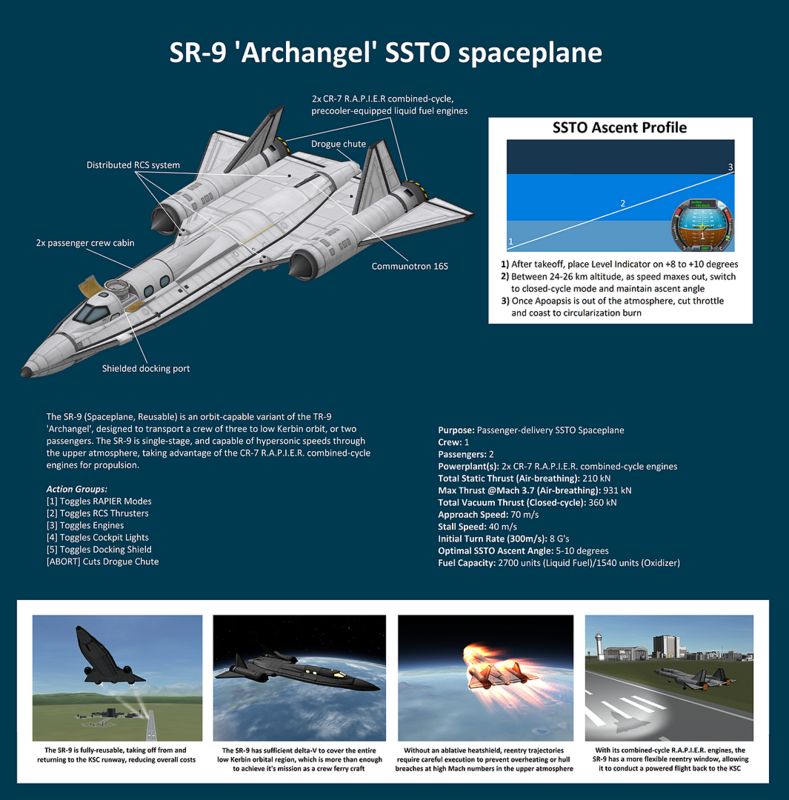 All of the craft available for download are built using 100% stock parts and are designed/tested within the stock aero model. 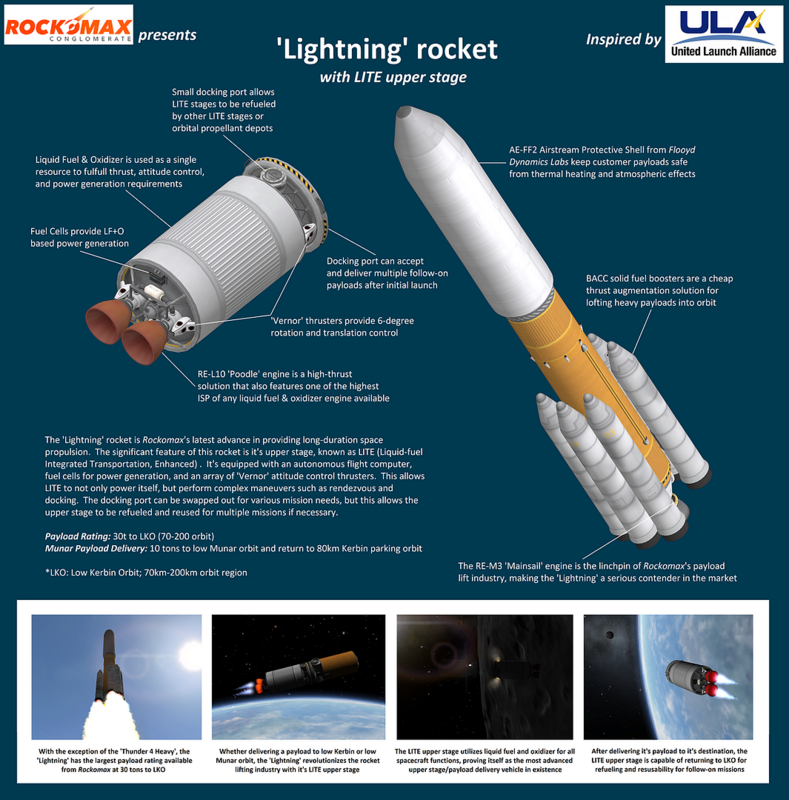 A lot of the craft are inspired by real-life designs or concepts, but they are not intended to be replicas. 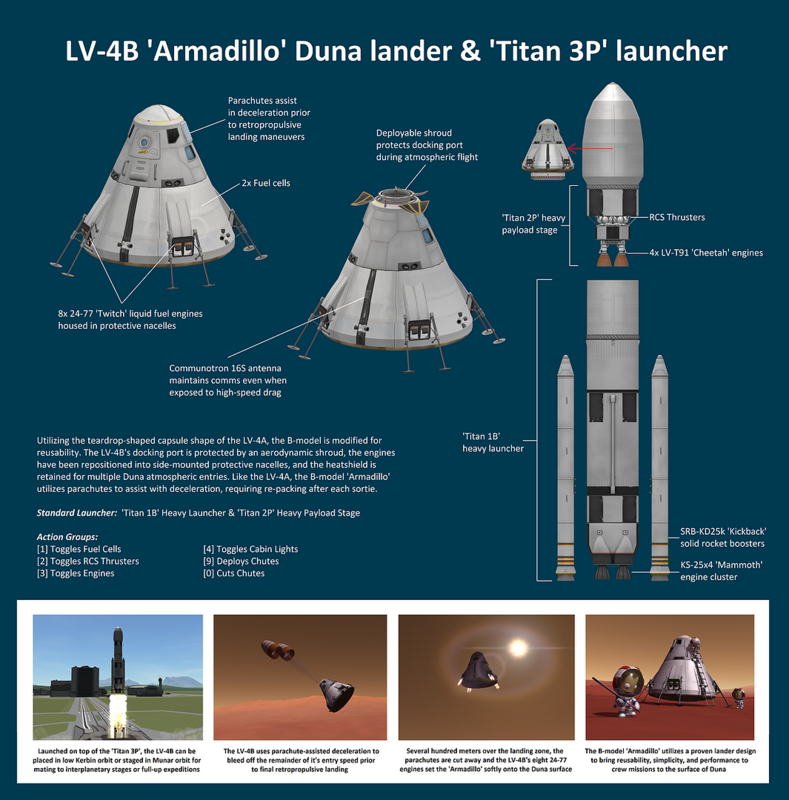 Rather, they are my personal analogues within the "Kerbalverse", just as Kerbin is the analog to Earth, or Duna is the analogue to Mars. My design philosophy emphasizes function balanced with aesthetics. 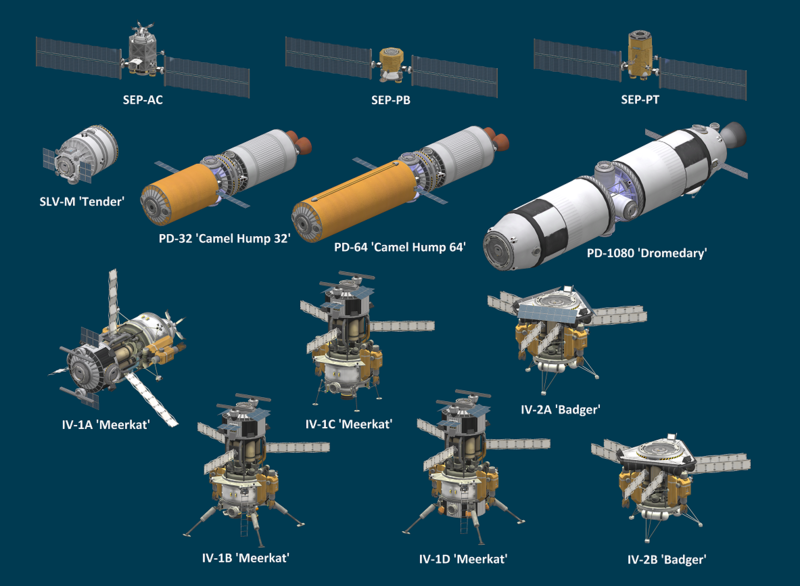 Further, all of these craft/subassemblies I have personally used or continue to use in my own KSP career. In essence, they are in a constant state of testing. To browse for a craft file, expand the primary spoiler drop-downs (SPH, VAB, or Subassemblies) and then continue to work your way through the "catalog tree" until you find something you'd like. Then click the hyperlink below that craft file image and it will redirect you to the appropriate KerbalX page to download that craft. 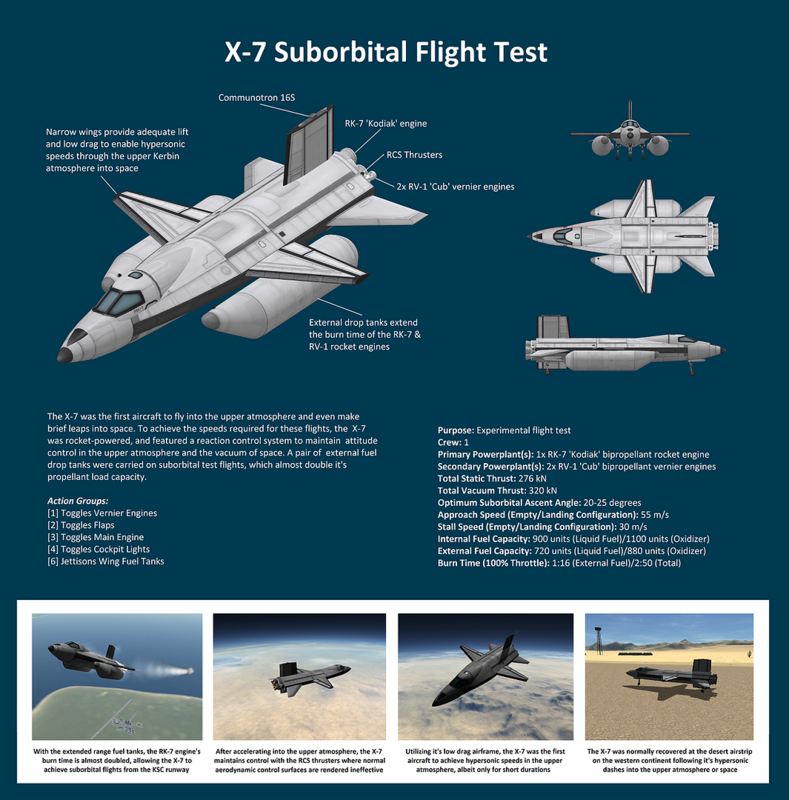 To keen observers, some obvious missing craft files in the X-Plane line-up is the X-10, X-20, and X-21. 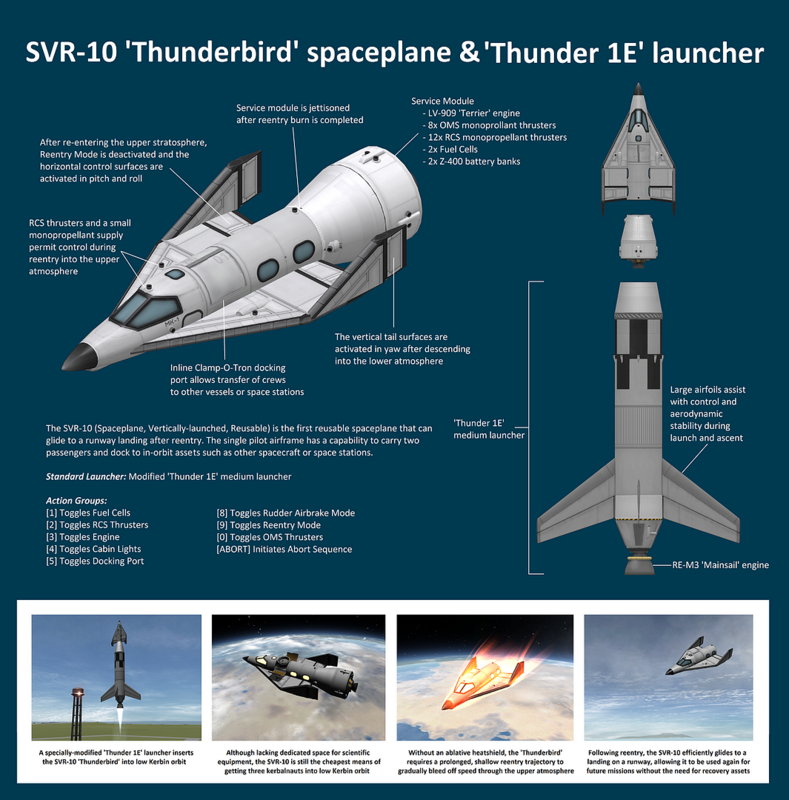 In the case of the X-10 and X-20 these were simply prototypes of the SVR-10 and SVR-20 I used for glide tests. 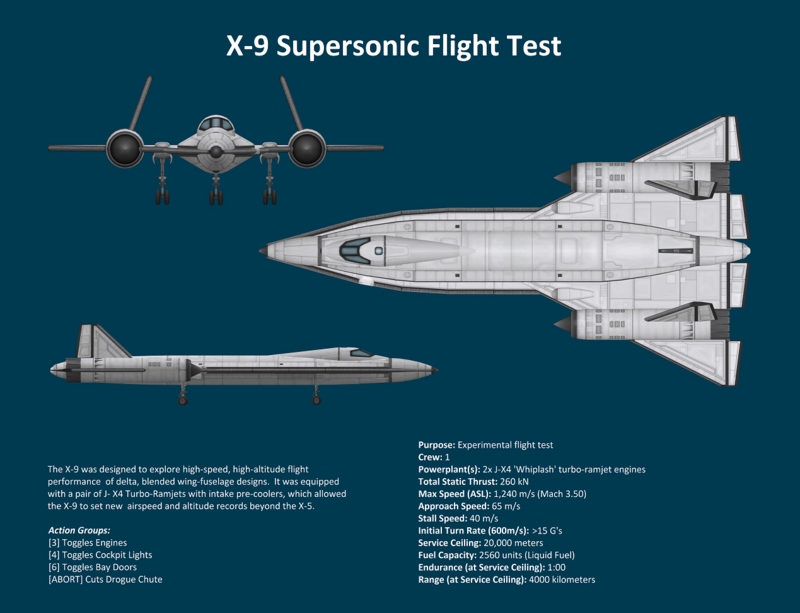 The X-21 was almost exactly the same as the mission-capable SR-21 SSTO spaceplane. 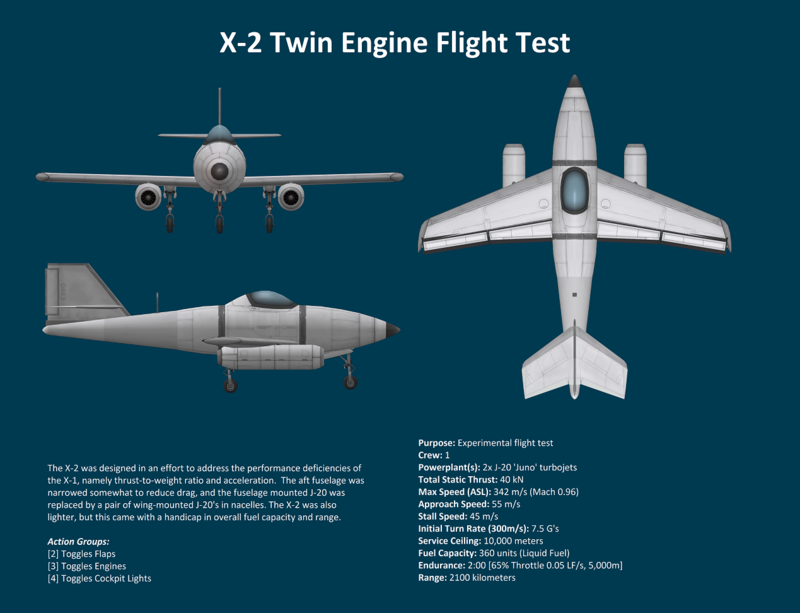 For these reasons, I didn't feel it was necessary to publish additional KerbalX craft files for such similar designs. 1) I purposely avoided mounting any parts to the yellow-highlighted areas of this craft. This allows very quick part swaps for different payloads or engine/fuel tank combinations. 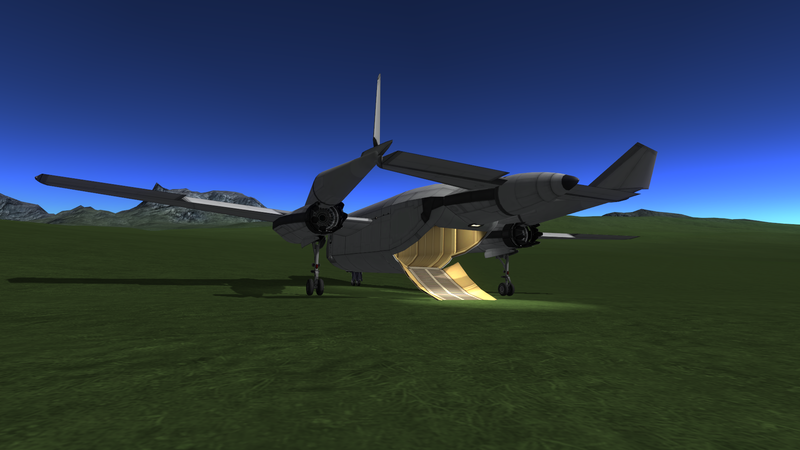 When changing out components, be mindful of where the Center-of-Mass is in relation to the main landing gear. You may need to slide the main landing gear forward or back to maintain proper relative positioning (ie, just aft of the Center-of-Mass marker). Also, if you do swap out engine/fuel tank assemblies, you should consider re-strutting the aft portion of the wings to the new fuel tanks. 1) NOTE: A joystick is recommended for better control of this aircraft. 1) WARNING: Disengaging SAS or attempting maneuvers at high speeds may result in loss of aircraft control, component damage, or in-flight airframe disintegration. Use trim or gentle control inputs to alter course...or slow down. 1) Manually deploy airbrake components in aft cargo bay to secure your ATSV in place prior to flight. 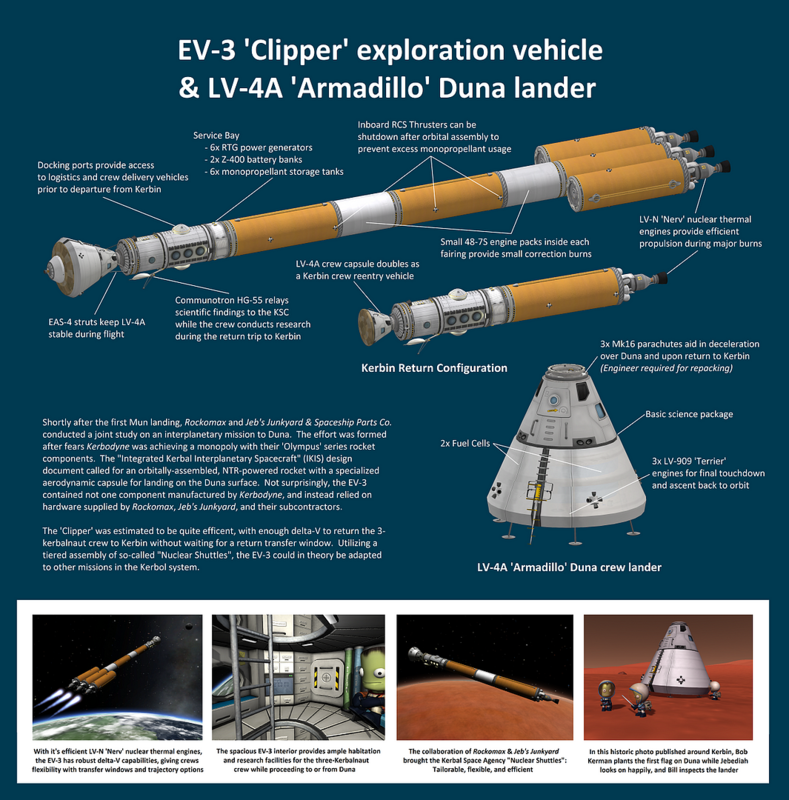 1) The service module panels are not intended to be jettisoned. Since there isn't an option to disable staging on the new service modules (yet), I moved the stage to the very end, after the parachutes. If you do manually jettison the panels, most of the RCS thrusters on the service module will float away as well. 2) The Center-of-Mass is forward of the horizontal/vertical translation thrusters, so translating in any direction except for forward/aft will incur a rotation movement. This is easily countered by turning on the SAS. 1) This rocket has a fairly poor TWR when compared to the 'Olympus 2', so pitch over on your gravity turn later and less aggressively. 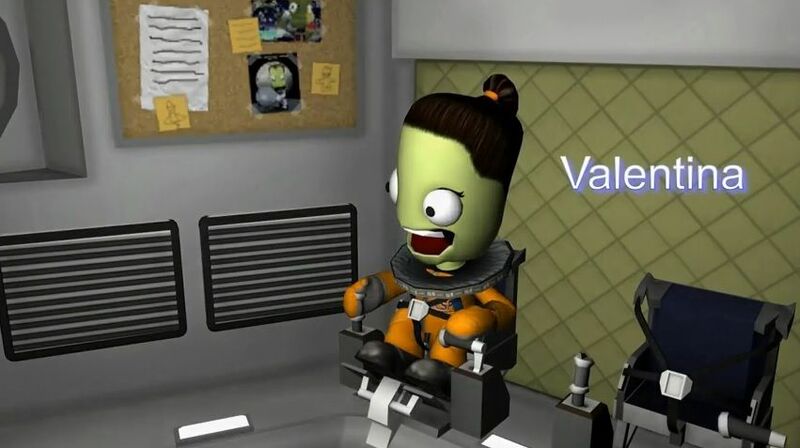 1) Always ensure your Kerbal's are in the Mk1-3 capsule seats and not in the Mk2 lander can prior to launch. 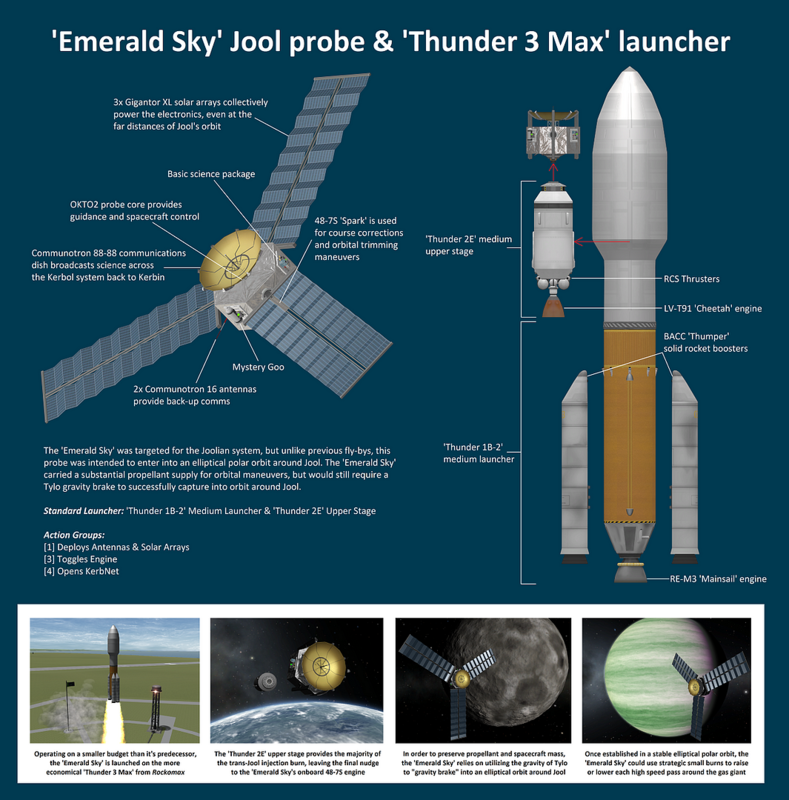 2) Prior to reentry, manual unlocking of the Mk1-3 capsule's integrated battery and monopropellant supply is required. 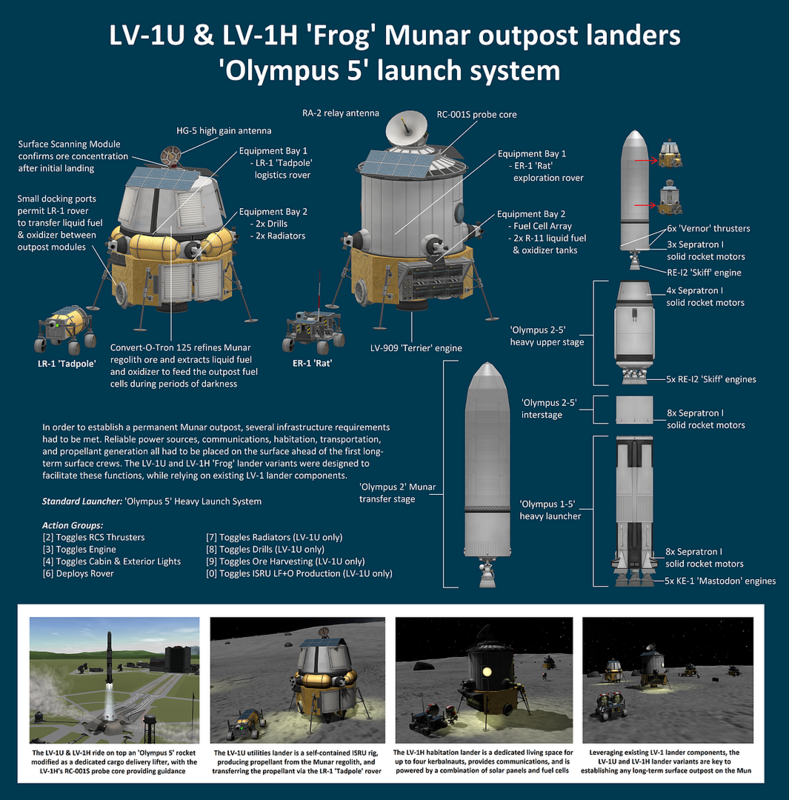 2) The LV-1B has more payload and less fuel compared to the LV-1A, but is still capable of landing from a low Munar orbit (~15km) with fuel to spare, even if from a retrograde orbit. 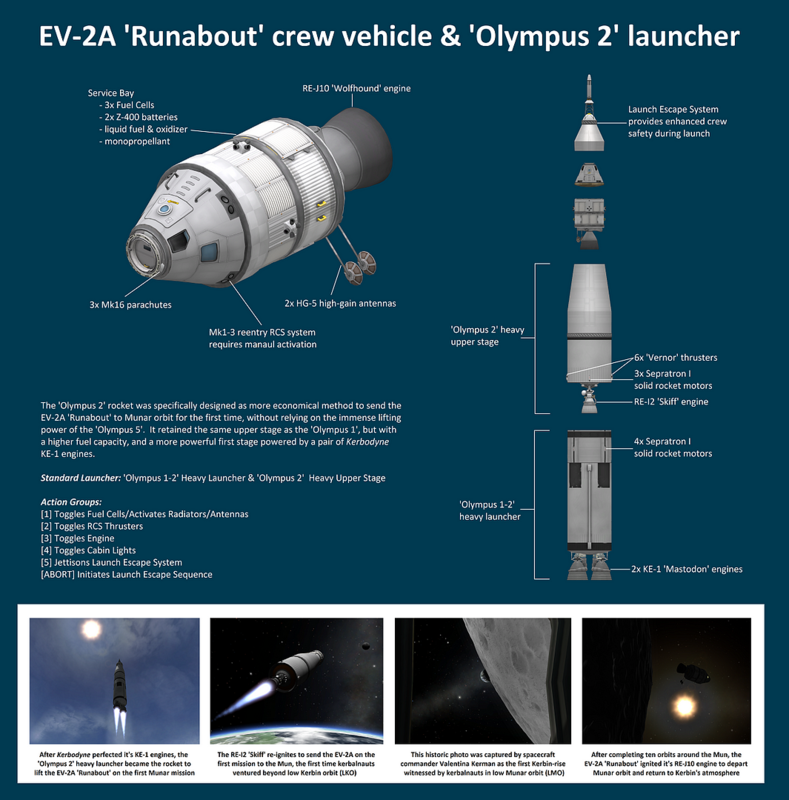 A smart descent profile should be used, and the EV-2A can also perform the initial retro-burn deceleration just prior to undocking (This was done in the real-life Apollo missions to conserve fuel for the same reason). 3) It's recommended that you land in an area with little to no slope, to ensure no complications when dropping the rover. When you drop the rover it's recommended, but not required, that you manually toggle the breaks on the BRAKE button in the UI. 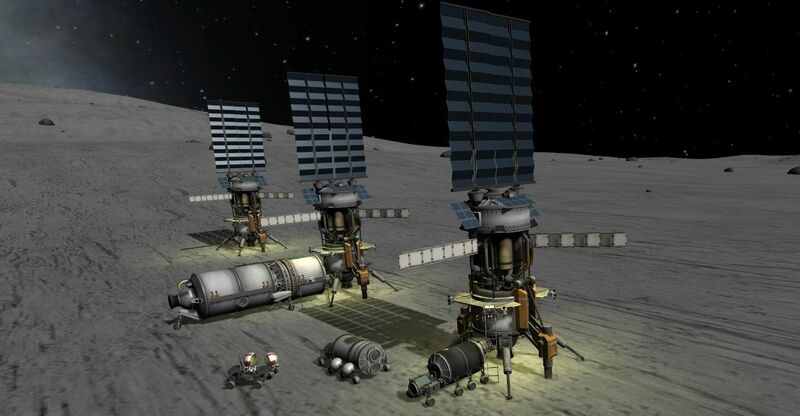 The way the rover sits in Equipment Bay 1, it shouldn't roll away, but this is KSP after all. There may also be a slight suspension bounce as the ER-1 rover is driven off it's mounting platform, so be ready for that. 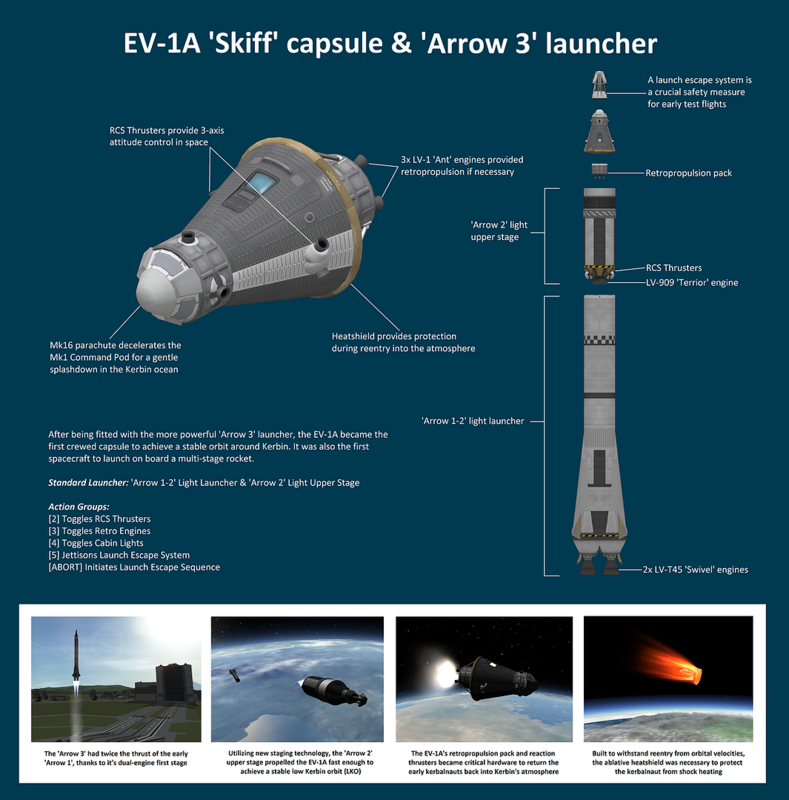 4) Prior to reentry, manual unlocking of the Mk1-3 capsule's integrated battery and monopropellant supply is required. 1) The monoprop RCS thrusters on the auxiliary service module and on the crew module are designed to work in conjunction during precision translating/docking maneuvers. These are not needed when only coarse attitude changes are needed. 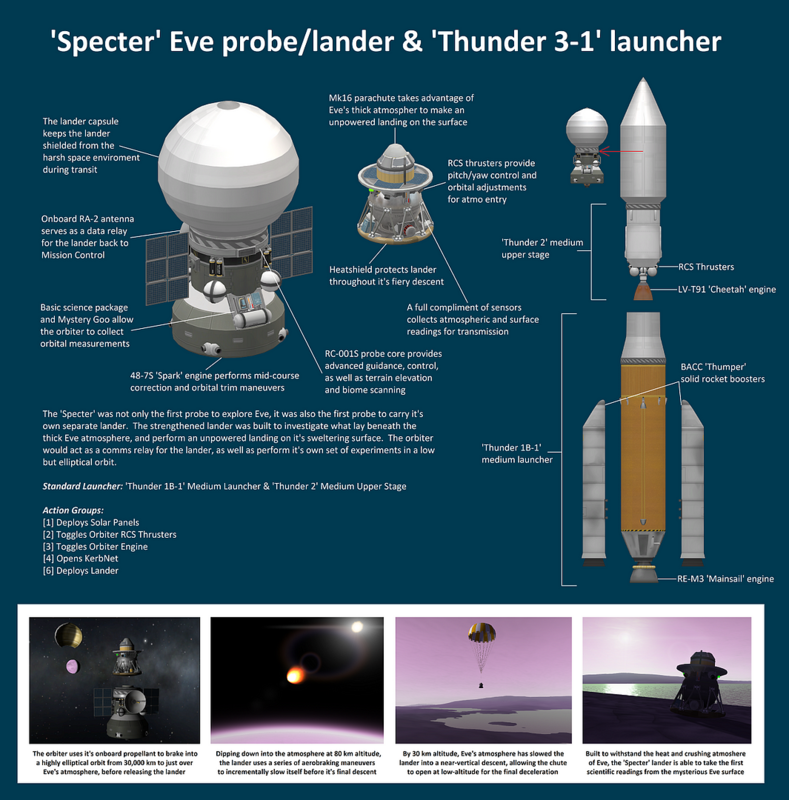 2) While the crew module is fully capable of landing on Gilly as depicted in the graphic, the SLV-M 'Tender' in the Robotics category has specifically placed crew ladders to turn the EV-2L into a lander for other very-low-gravity moons like Minmus or Pol. 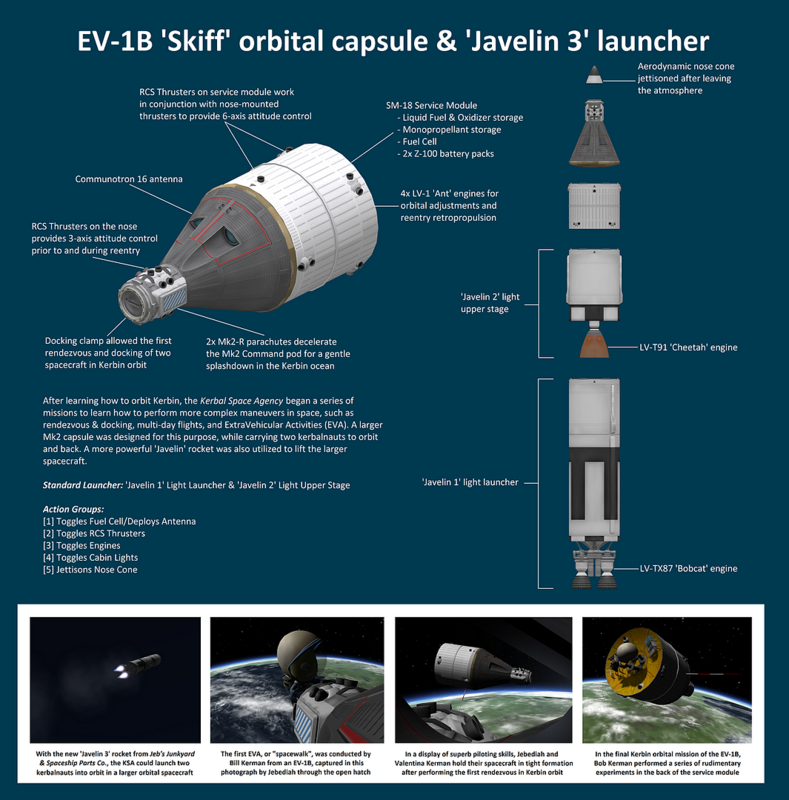 Dock the crew module to the large docking port on the front of the SLV-M to perform this configuration. 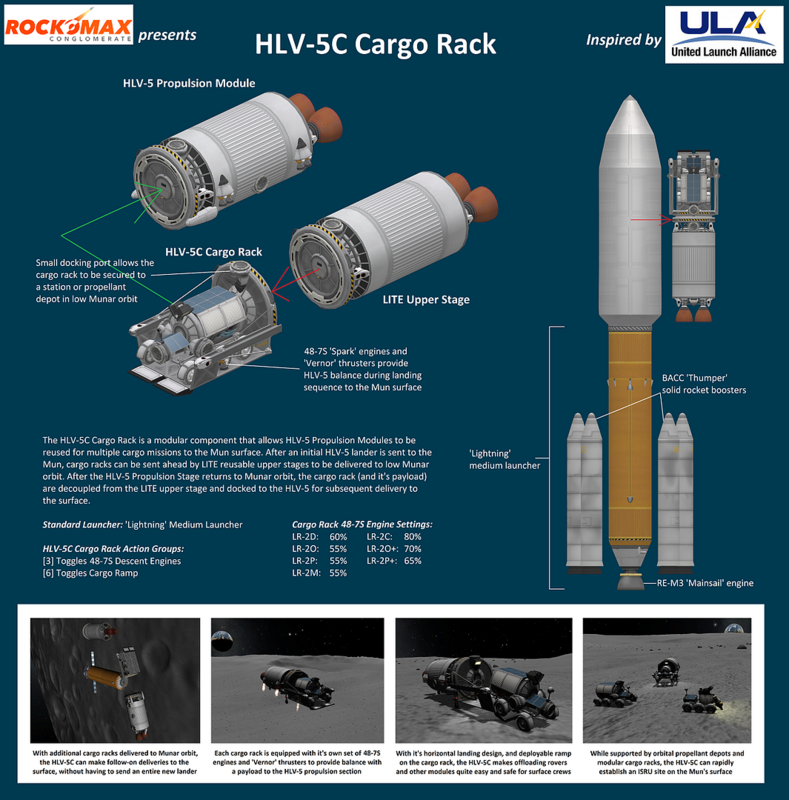 3) Since the primary service module is a standard LITE reusable upper stage, other LITE's can be swapped out for use; or conversely the EV-2L's LITE can be undocked to transport other payloads elsewhere if necessary. 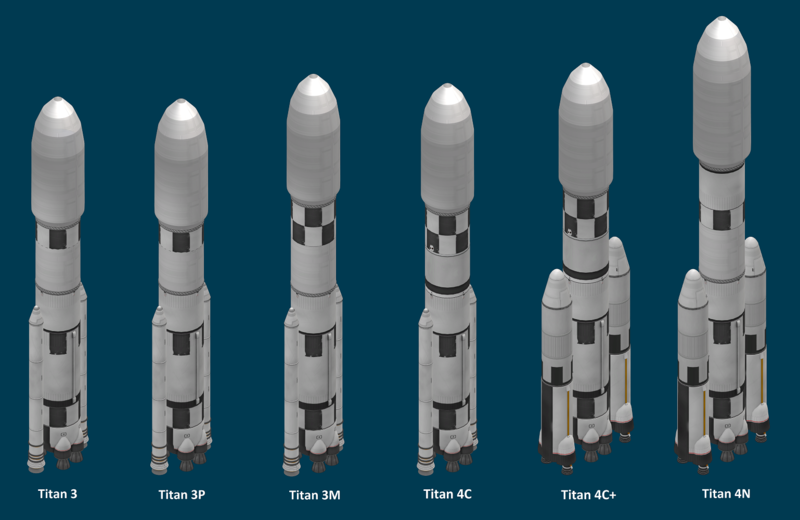 1) IMPORTANT: When docking multiple NTR Type A stages together side-by-side, make sure you jettison end caps and fairings prior to assembly. 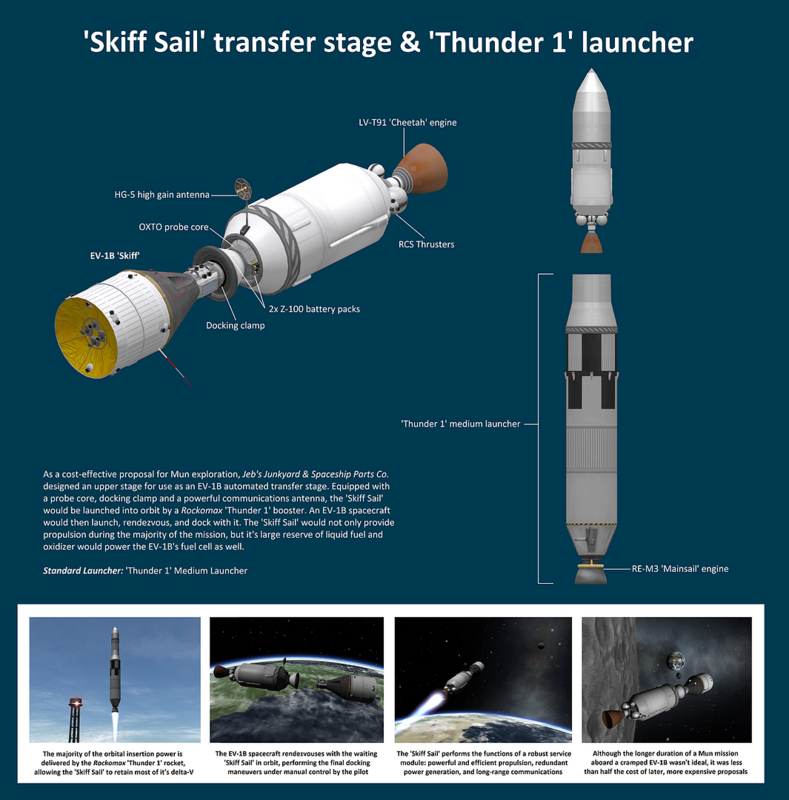 Fairing jettison with multiple NTR nacelles docked together in this manner will result in less-than-Rapid Unplanned Disassembly, but disassembly nonetheless. 2) To read more about the IMIS 1968 study, you can download the original study itself here in PDF format. 1) Before undocking the LV-4A from the EV-3, ensure the monopropellant tanks are topped off. 2) After undocking the LV-4A in Duna orbit, press  in the action groups to enable the RCS thrusters. 3) After repacking the main chutes on the ascent capsule, reset the Min Pressure to "0.4" and the Altitude setting to "800". 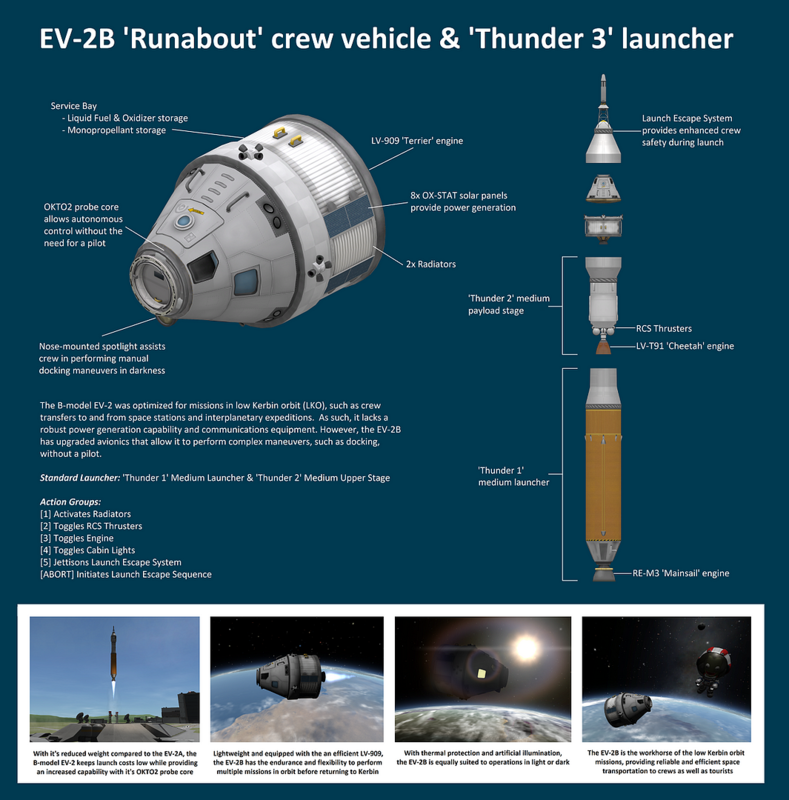 These are the settings used on the EV-2 crew capsules for Kerbin reentry and are well tested. 4) The most aggressive Kerbin atmo reentry I've ever done with the LV-4A capsule was just over 5,100m/s when passing 70km, with a 10km periapsis. 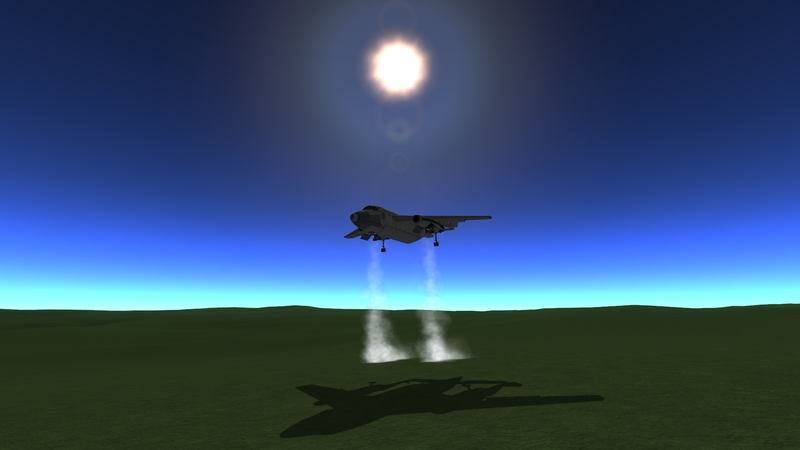 The heatshield itself almost overheated even before the ablator was half gone, but it held out long enough to burn almost all the ablator off (not to mention the Kerbals experienced a max G of 18.5 ). This is why I've limited the LV-4A capsule to 5,000m/s entry speed to provide a reasonable buffer. 2) After placing the Hab+Lab in low Kerbin orbit, launch the EV-2C to rendezvous and dock before proceeding to the final EV-4 assembly orbit. 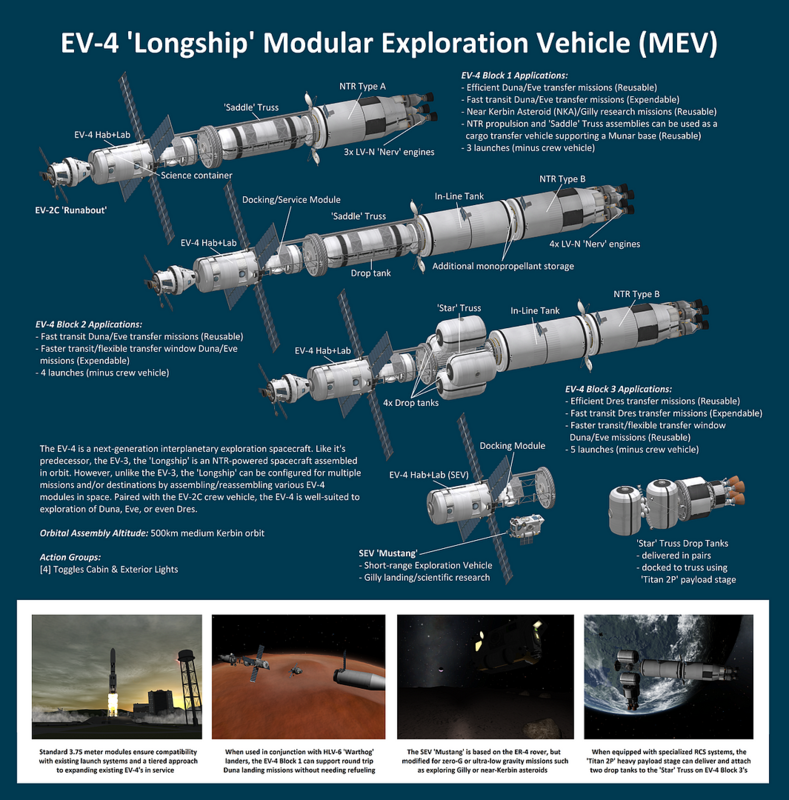 This allows the EV-2C to complete the EV-4 Hab+Lab's RCS system and provide balance during the rendezvous and docking with the rest of the EV-4 'Longship'. 3) If constructing an EV-4 Block 2, prior to launching the NTR Type B, remove the HG-55 comms dish (near the top of the upper stage) in the VAB. Prior to launching the In-Line Tank, remove the top HG-55 comms dish (near the tip of the fairing) in the VAB. 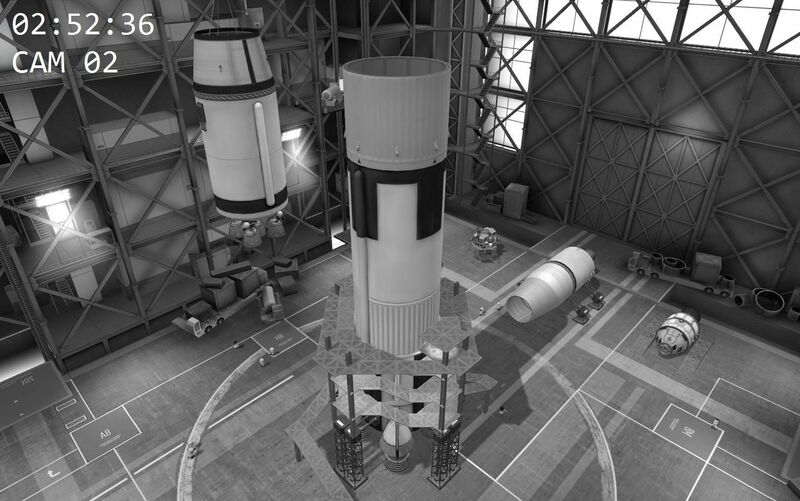 4) If constructing an EV-4 Block 3, prior to launching the In-Line Tank, remove the bottom HG-55 comms dish (near the top of the upper stage) in the VAB. 1) The LV-1U does not have the fuel to make a long, protracted hunt for high enough ore concentrations. 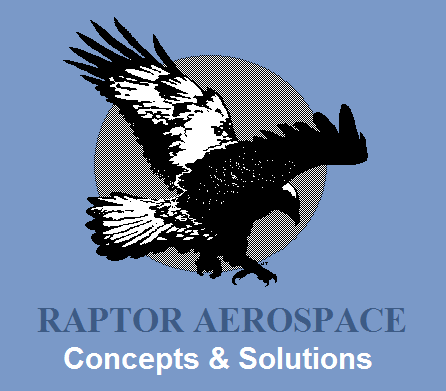 Ensure you have done orbital surveys prior to selecting a landing site for propellant generation. 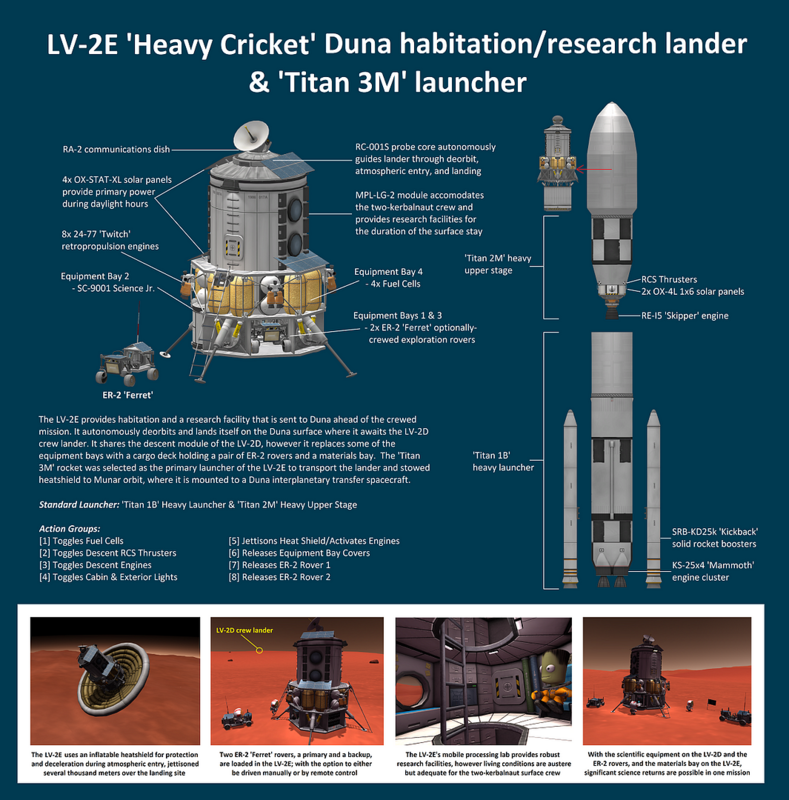 1) This lander is designed to be carried to Duna via the EV-5 SEPTV, which is designed to be staged from Munar orbit. 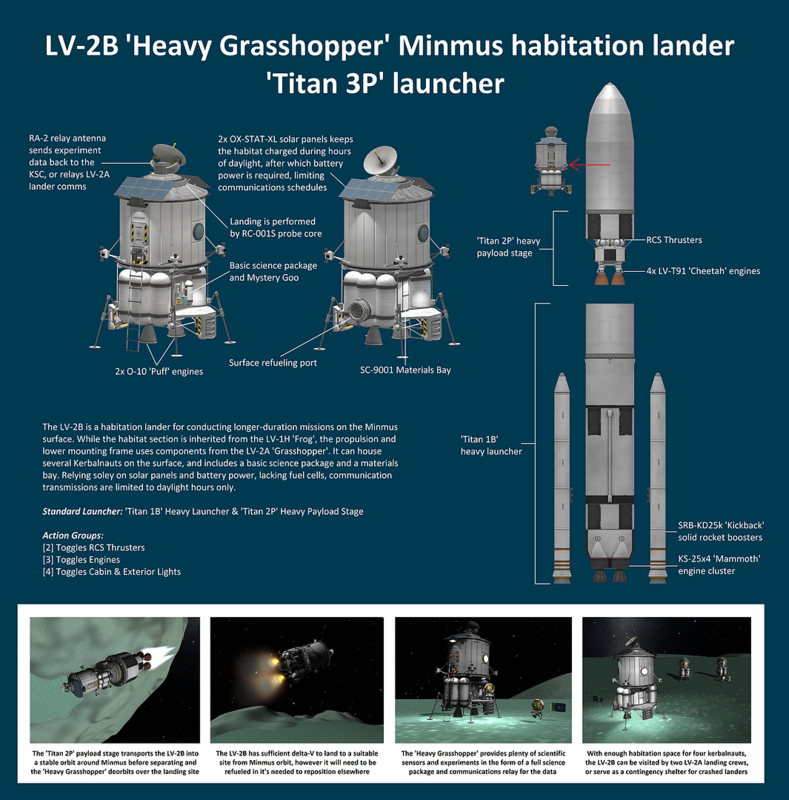 Therefore, the LV-2D is launched on top of the 'Titan 3M' to carry it to the staging orbit around the Mun. 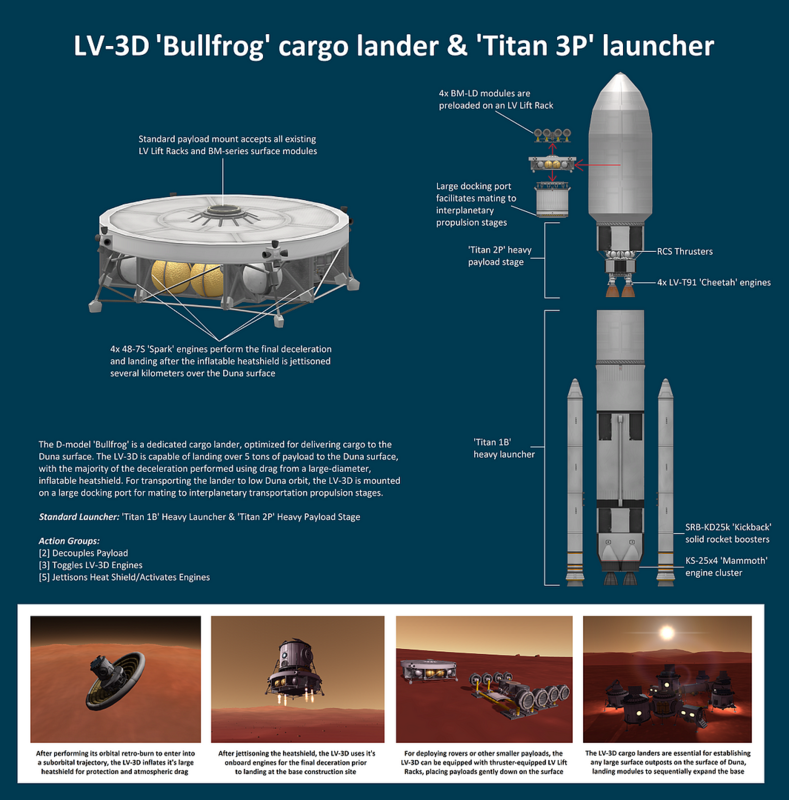 1) This lander is designed to be carried to Duna via the EV-5 SEPTV, which is designed to be staged from Munar orbit. 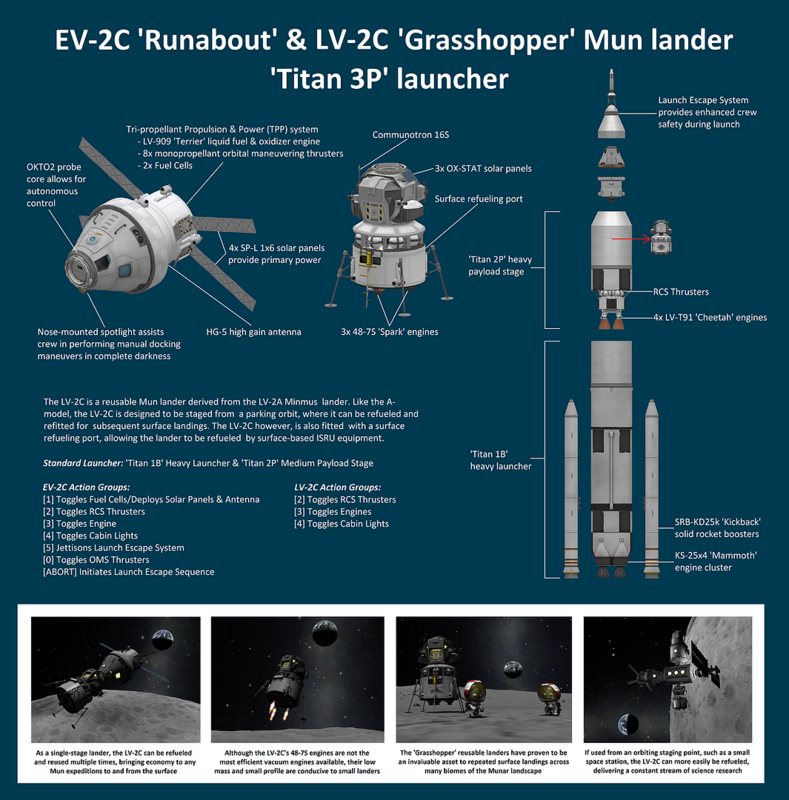 Therefore, the LV-2E is launched on top of the 'Titan 3M' to carry it to the staging orbit around the Mun. 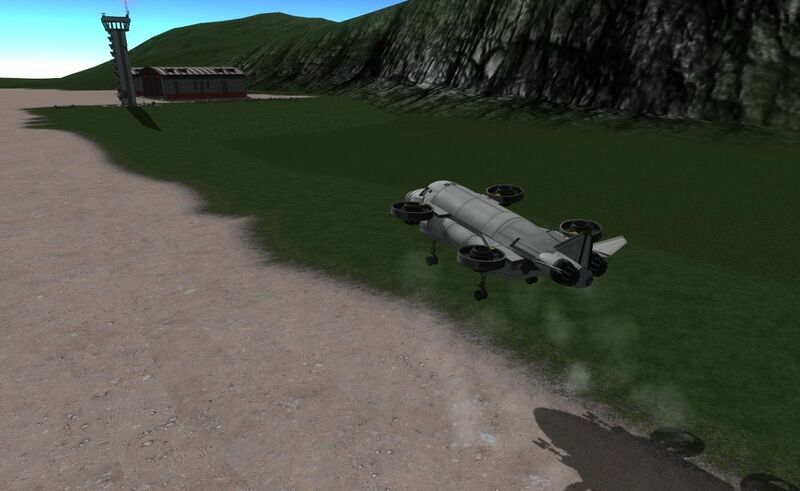 1) Be careful unloading the rover, the suspension behavior in KSP likes to make it bounce. 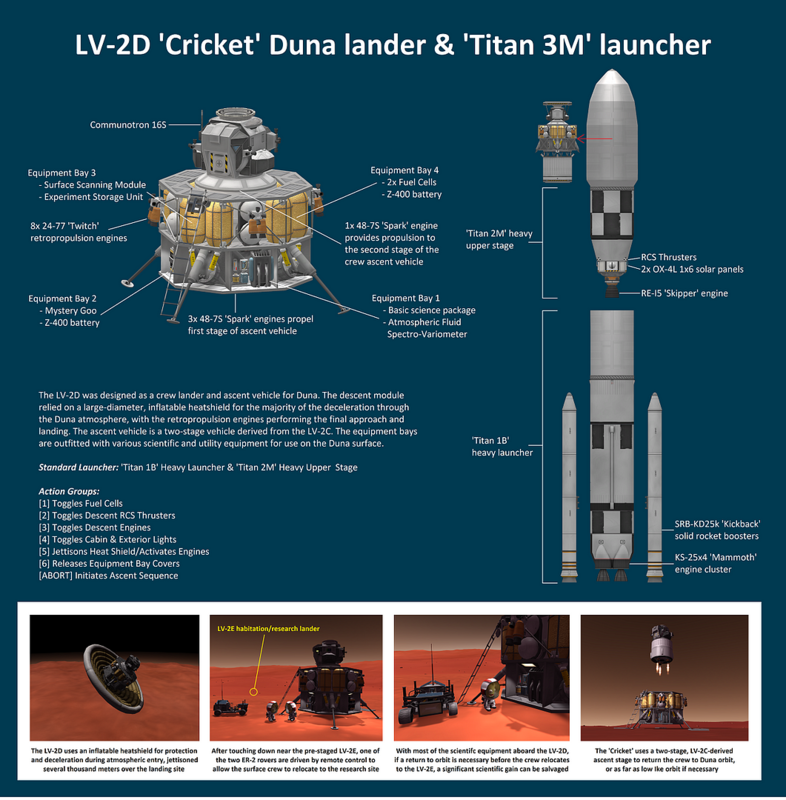 To load it back on the lander to refuel, or re-position the lander itself, the rover may need a bit of a good start (3 m/s or so) to get back on the ramp. 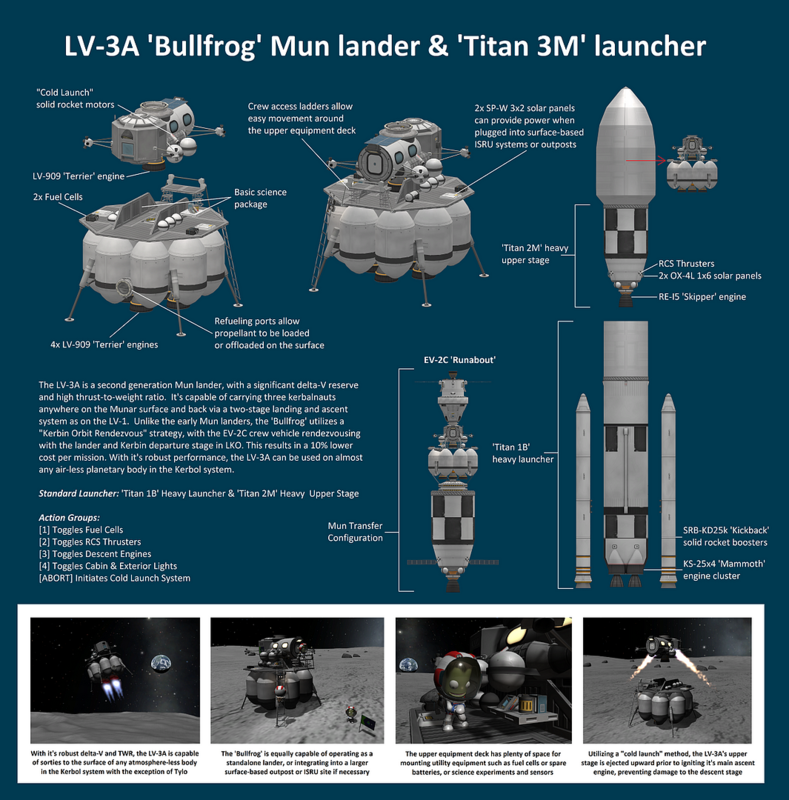 1) These landers are meant to be used in conjunction with PD-32/64 orbital propellant depots and surface ISRU equipment. 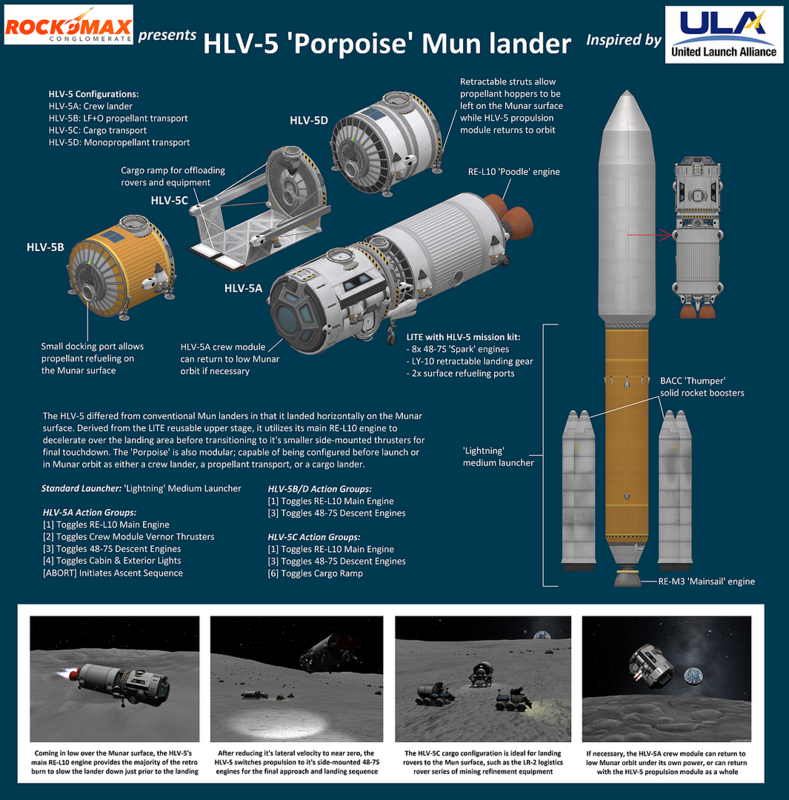 They utilize the same single-resource logistical chain as the 'Lightning'/LITE rocket stages, reusability, and flexibility to cover all Munar latitudes. 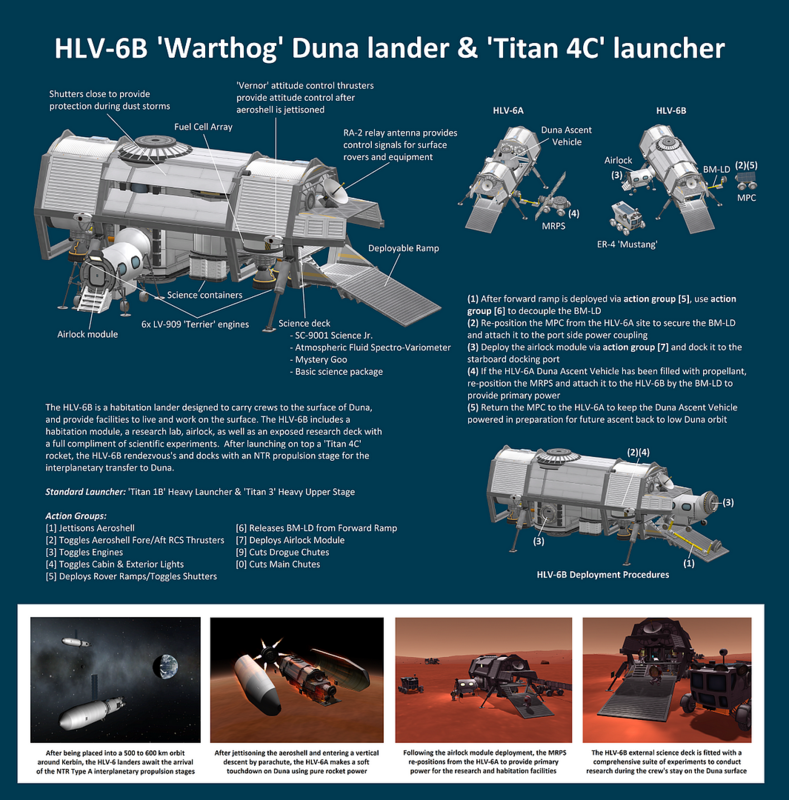 1) As stated in the graphic, depending on what payload you have loaded, you may need adjust the thrust limiter values on the Cargo Rack for proper balance during final descent with the HLV-5C lander. 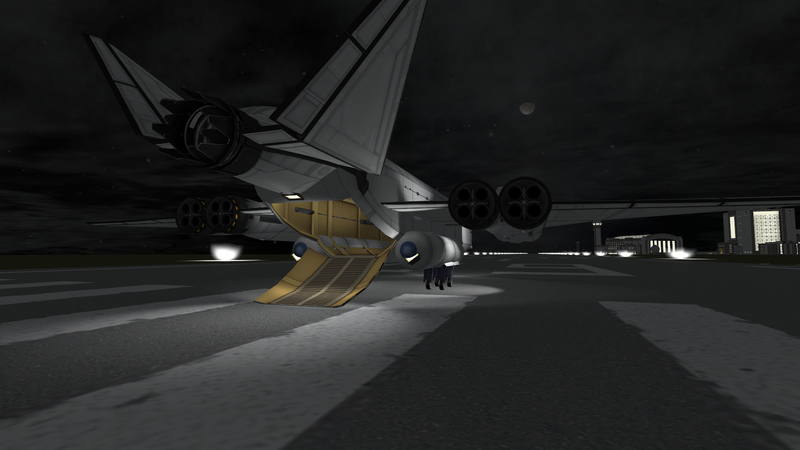 2) Before releasing any rovers from their ramps, lock brakes to ensure they don't roll away. 3) Before trying to deploy the MPC from the forward ramp, or dock the MPC to the BM-LD to pull it off the aft ramp, it's a good idea to quicksave. 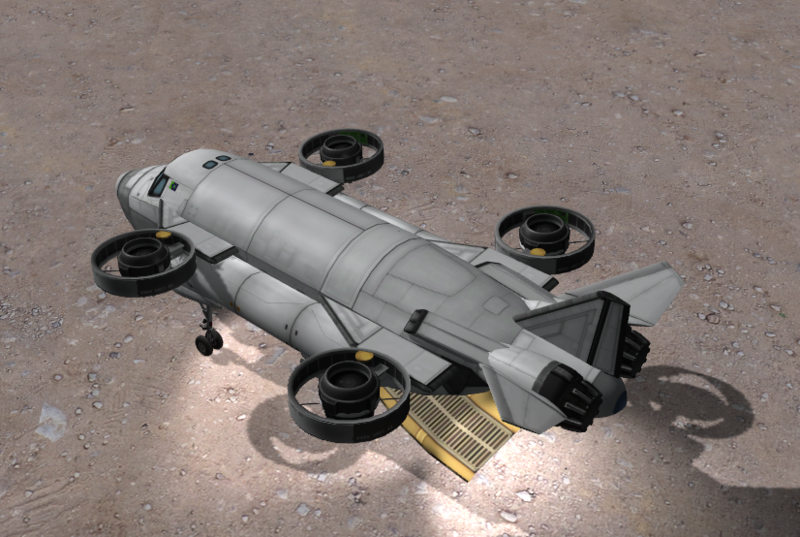 KSP suspension continues to be "wonky", and sometimes rovers like to flip during physics switch ups. 3) Before trying to dock the MPC to the BM-LD to pull it off the forward ramp, it's a good idea to quicksave. 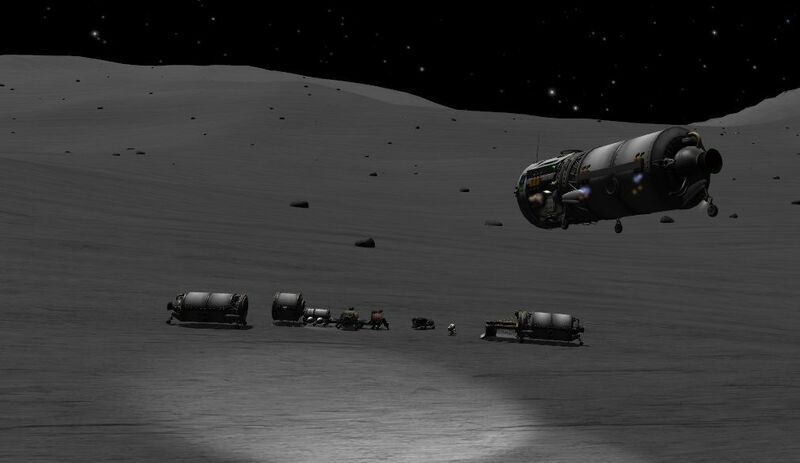 KSP suspension continues to be "wonky", and sometimes rovers like to flip during physics switch ups. 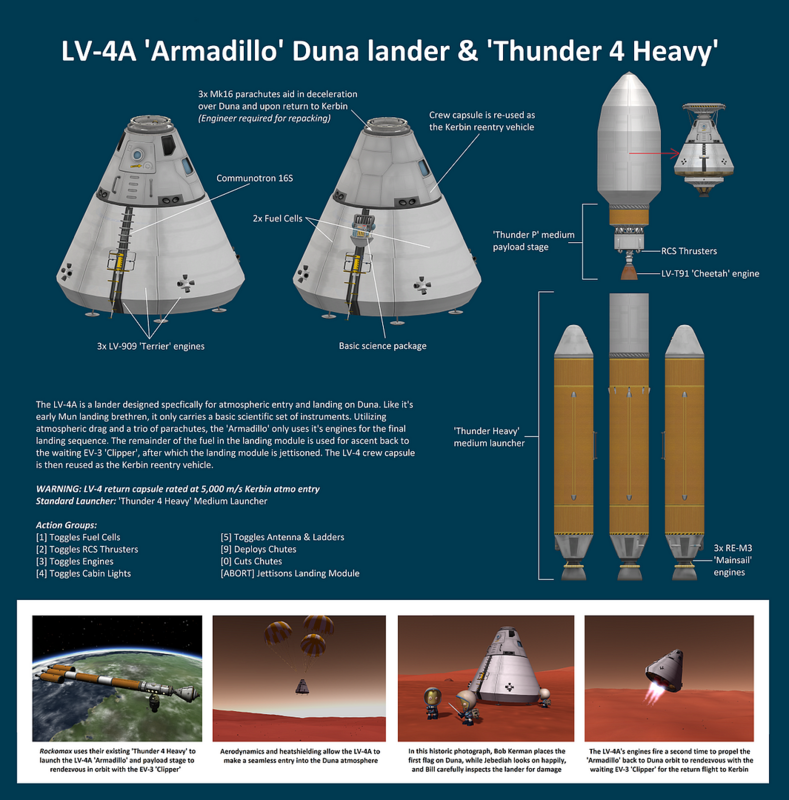 4) By the time the crew arrives in the next transfer window, the HLV-6A ISRU should have already made all the propellant for the Duna Ascent Vehicle. 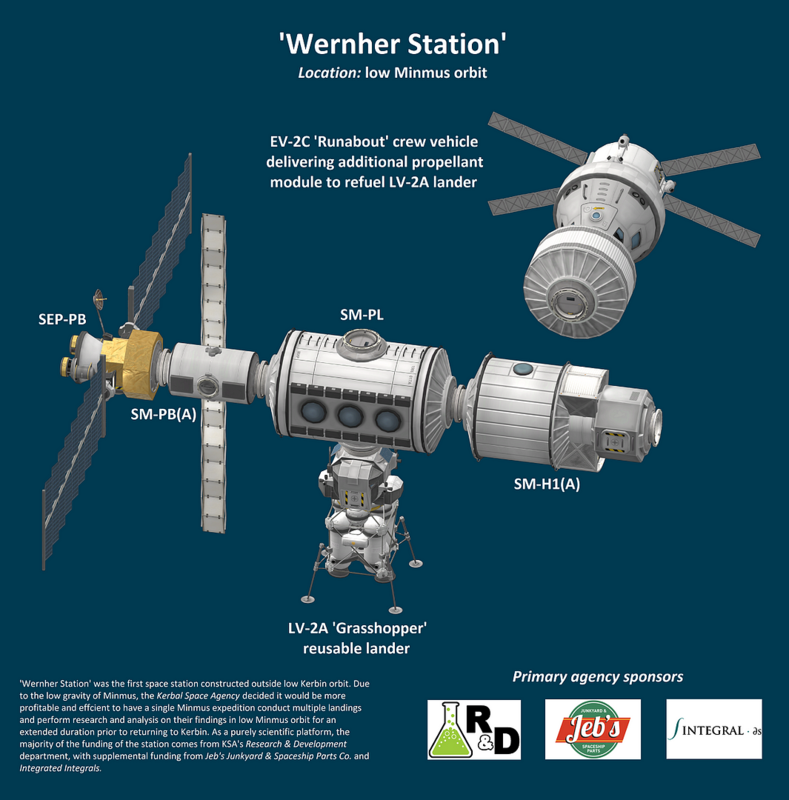 Upon the arrival of the HLV-6B, the MRPS becomes the primary power source for habitation/research, while the MPC returns to the HLV-6A to keep the DAV's batteries charged until it is time for the crew to return to the transfer vehicle in Duna orbit. 1) This craft is intended to be sent autonomously to Duna orbit, where it can be utilized as a reusable lander. 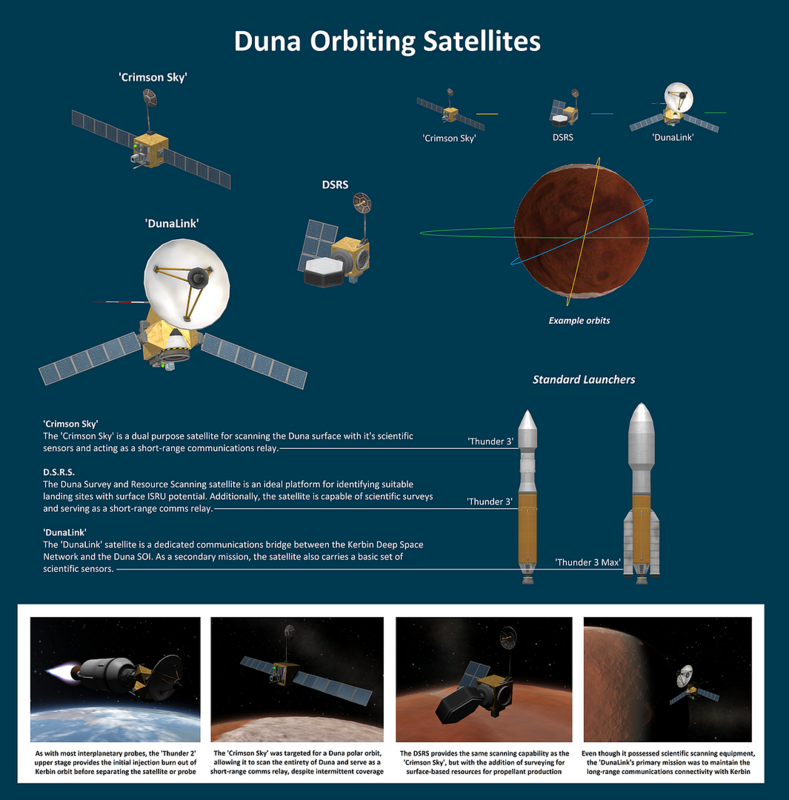 It is designed to remain in Duna orbit and be continuously refueled, unless the player decides to use it elsewhere for landings. 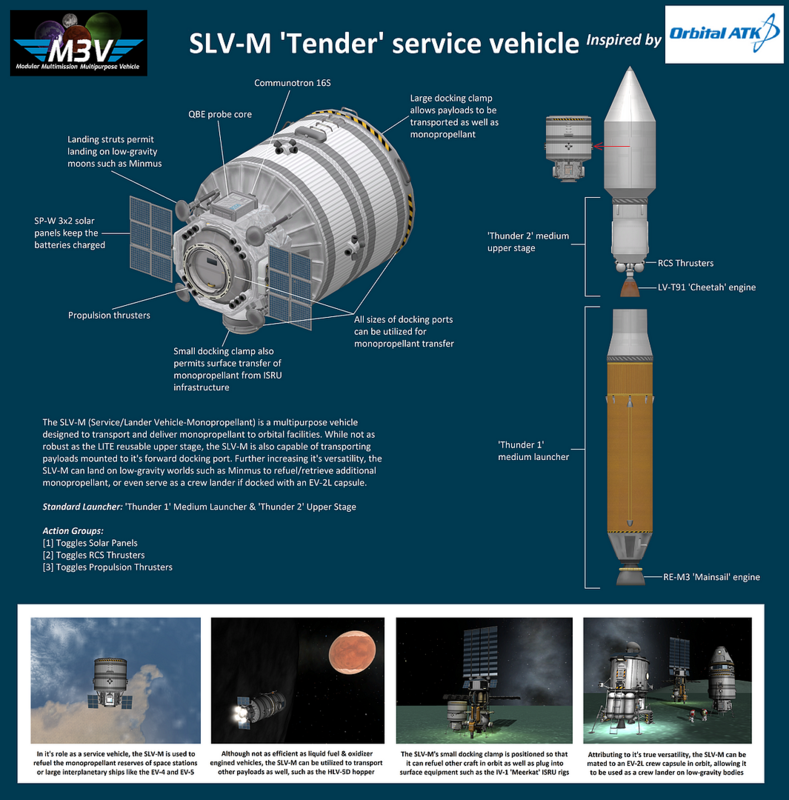 2) Although it has a small docking port for surface refueling if necessary, the LV-7A is intended to be refueled in orbit between sorties. 1) This craft is moderately difficult to launch, but not impossible; practice makes it easier. I make good use of the prograde function of the SAS throughout most of the ascent. At the very least, between 280 and 400 m/s, lock the SAS to the prograde vector (if available). This will keep the SVR-10 from flipping until it gets through the transonic range, where it’s the most unstable. 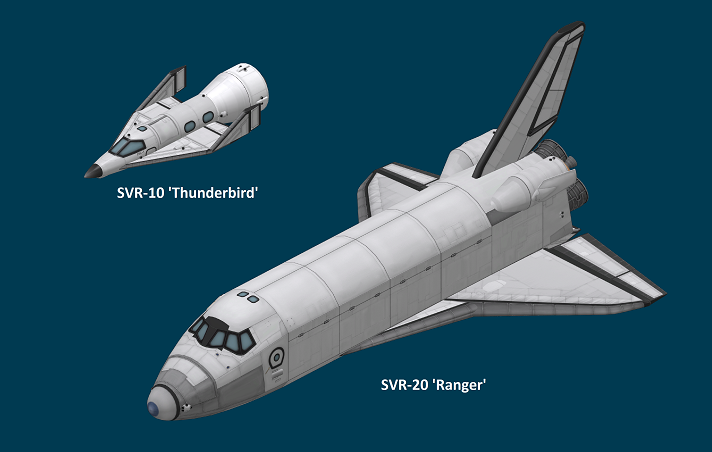 *While this craft doesn't have the glamour of a full-up space shuttle, or the ease-of use of the EV-2 series capsules, it's still a decent craft file to have in career mode. 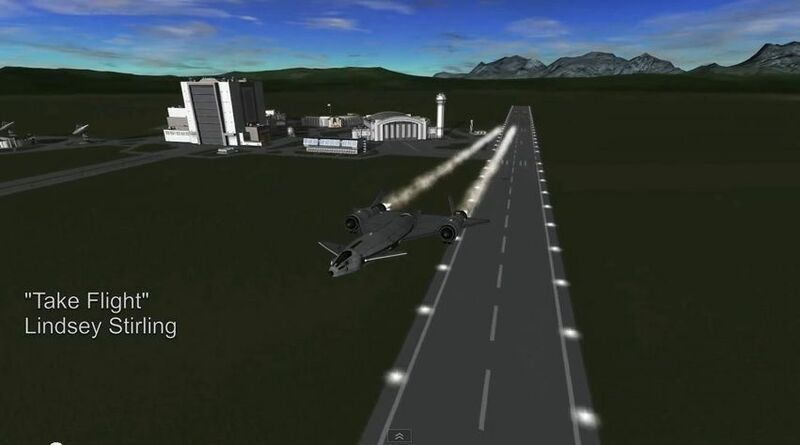 Assuming the SVR-10 safely lands back at the KSC runway, you will get a refund of 18,555 funds, not including any returns from extra fuel in the tanks. 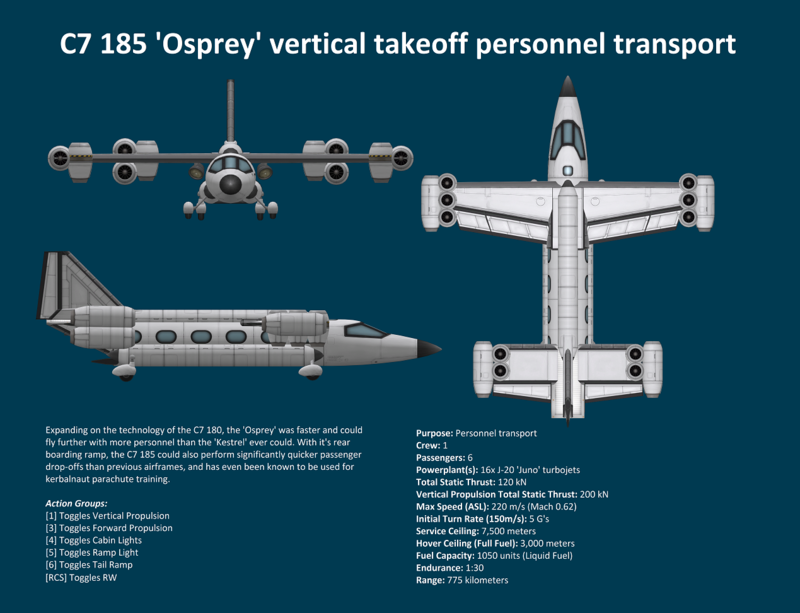 That brings the total expenditure to 29,472 funds; the cheapest (non-SSTO) means to transport 3 Kerbals to orbit and back...cheaper than the EV-2B even. 1) Keep in mind the payload limitations when loading the cargo bay. 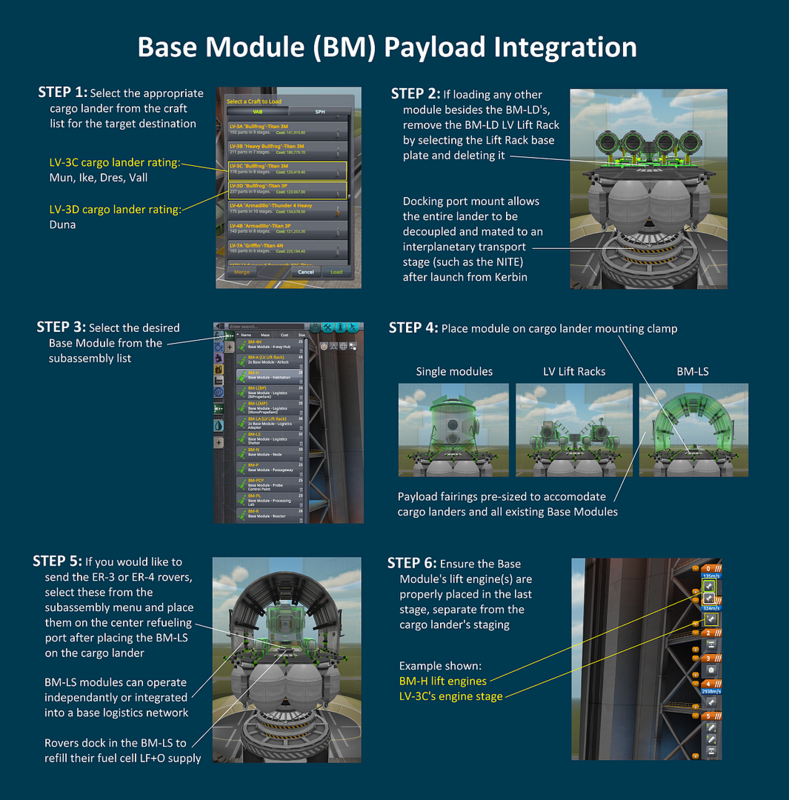 The Payload Capability chart assumes the mass is centered in the cargo bay. The further away from the green you get, the harder the craft will be to control during launch and ascent. The red areas are a no-go or you may experience significant difficulties during ascent. 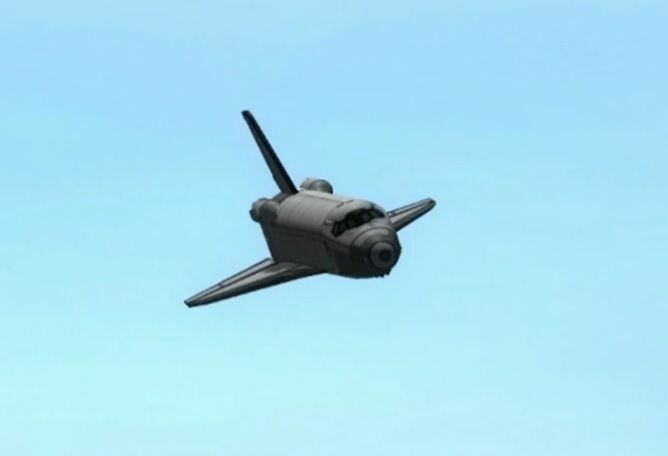 This is due to the nature of the asymmetric design of the shuttle system and the limitations of the KSP craft engineering. 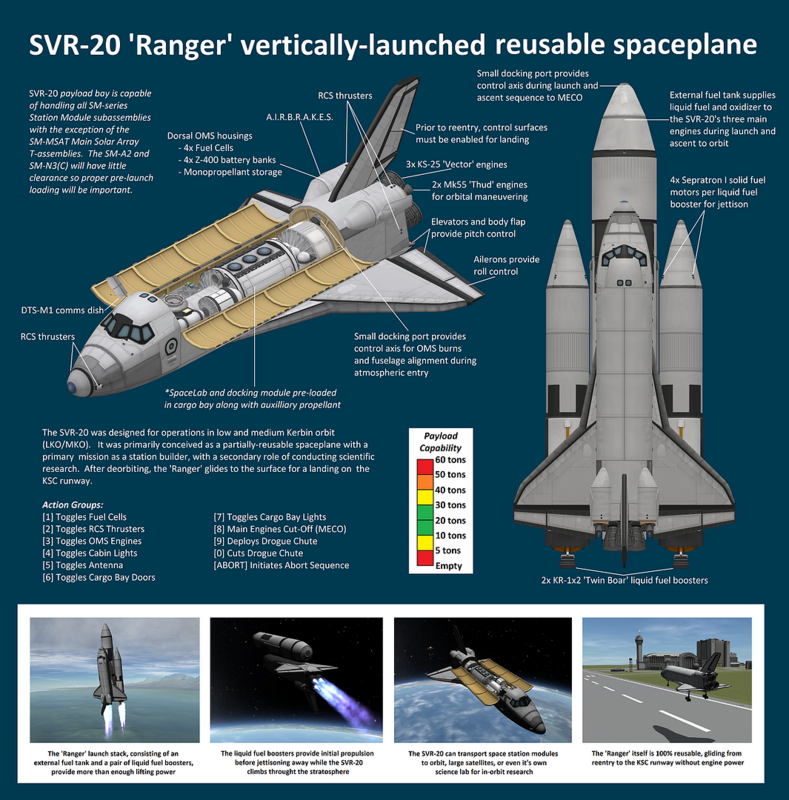 2) While the SVR-20 isn't optimized to bring anything down from orbit (only to carry things up), you can land with small masses if loaded properly. Also, be very careful to not turn to sharp in the atmosphere as you can cause the nose to flare up sharply and lose control. Again, this craft is based around a series of design compromises, it is not a dogfighter nor a one-stop lifter for any/all payloads. It's a novelty item really. 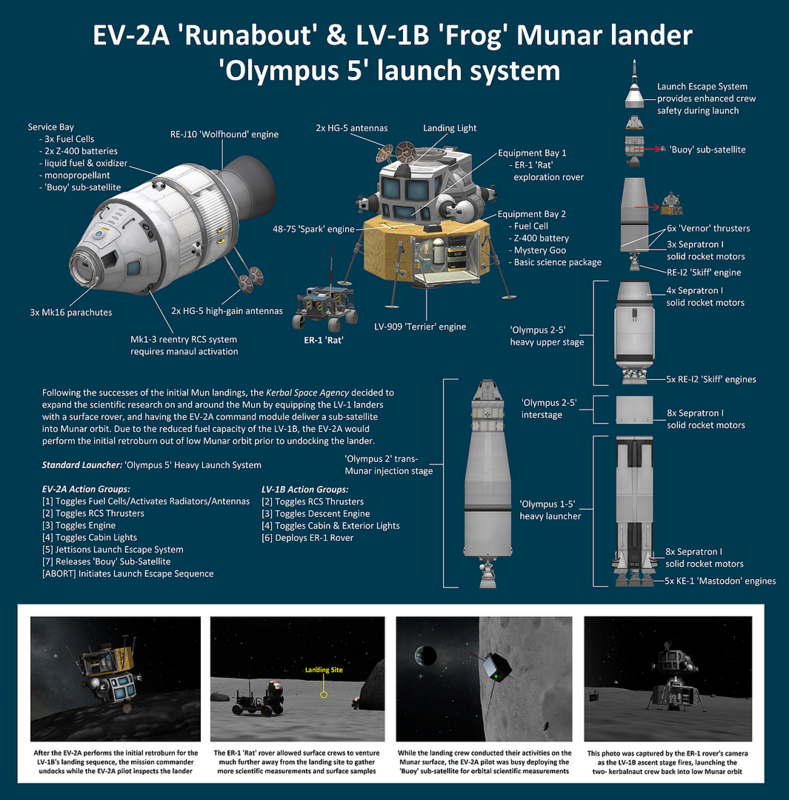 3) Depending on OMS fuel expenditures, the cost per launch is between 87,000 to 89,000 funds (assuming you recover the SVR-20 on the runway). 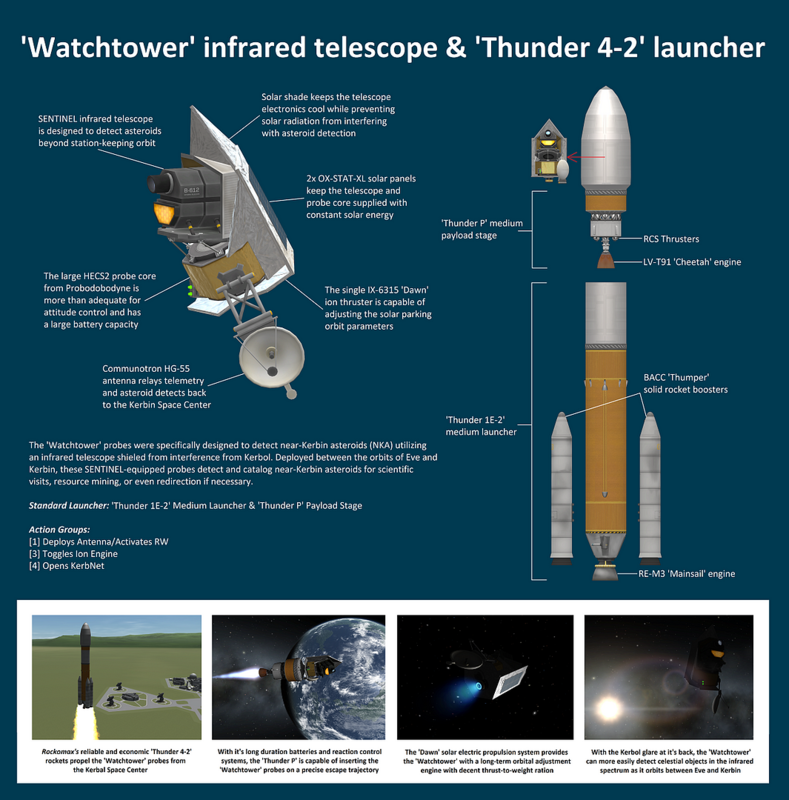 The main competitor for the 'Ranger' is the 'Thunder 4 Heavy', being slightly cheaper and easier to push heavy payloads to MKO. 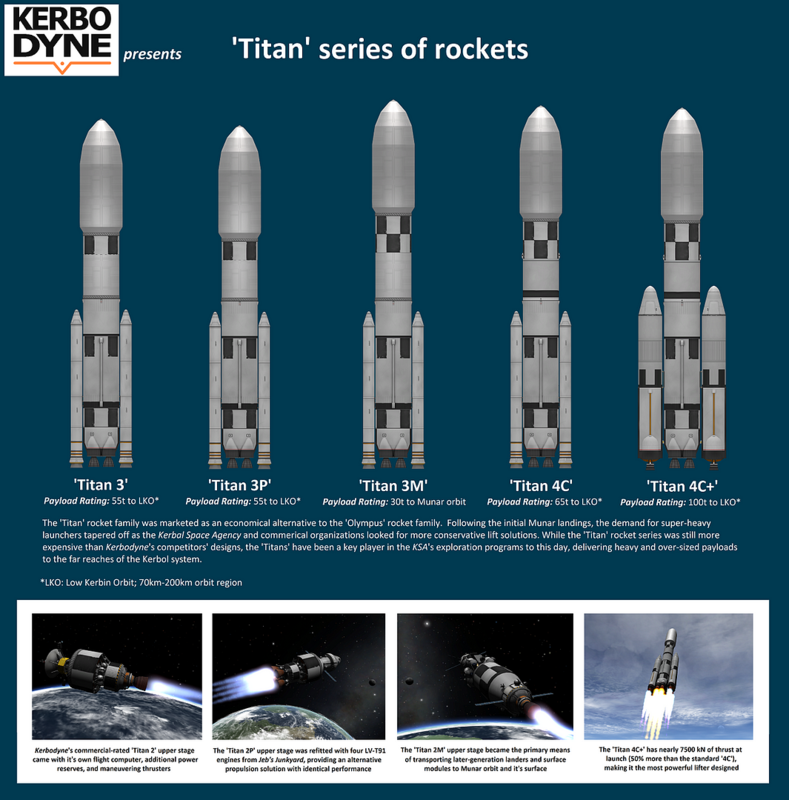 The 'Titan 3' family of heavy rockets can push heavier/larger payloads to LKO/MKO and are easier to operate, but are slightly more expensive in cost. 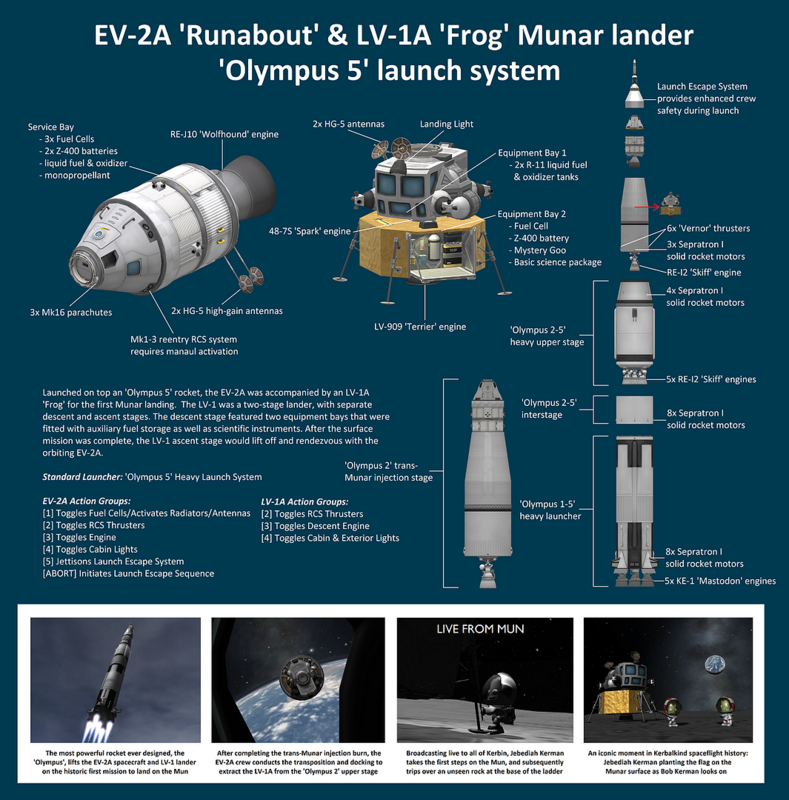 1) When utilized in conjunction with HLV-5B propellant lifters, only several of the IV-1B's are needed to keep a large refueling station in low Munar orbit supplied with liquid fuel and oxidizer. PD-32/64 orbital depots and LITE reusable upper stages are also easily incorporated into the logistics chain. 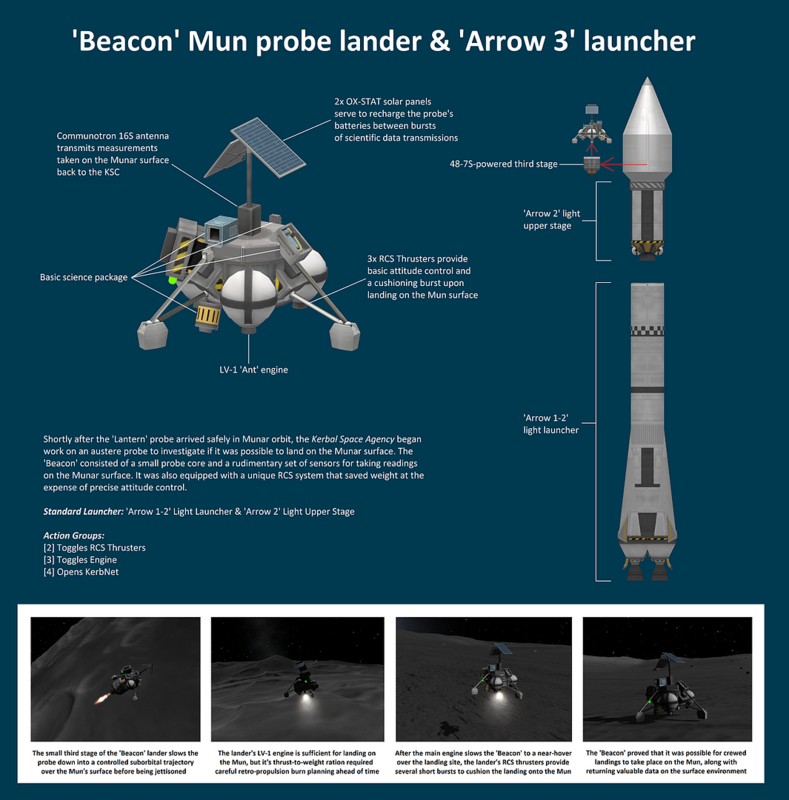 Real-life influence: NASA "Lunar Orbiter 1"
Real-life influence: NASA "Lunar Reconnaissance Orbiter"
1) The RCS system only allows a 2-axis attitude control in pitch and yaw. 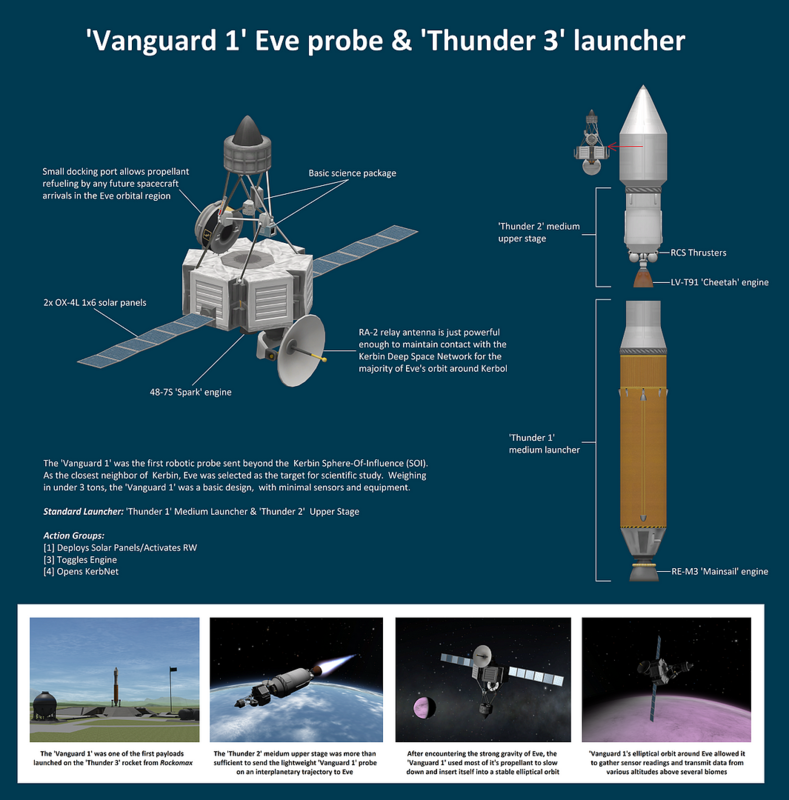 1) This probe is designed to be a good entry-level Eve probe, and as such has a large reserve of excess delta-V. This should encourage players that aren't experienced with interplanetary transfers, or propulsively capturing into a stable orbit following an interplanetary transfer, to take that jump and learning how. Further, with it's comm relay antenna, this probe also allows players to gain that vital communications foothold in the Eve SOI for follow-on missions, albeit only for certain parts of the Kerbin year. 2) The relative short distance between Eve and Kerbin allows the smaller RA-2 relay antenna to be a sufficient comm relay, but for the back/opposite 1/3rd of Eve's orbit relative to Kerbin's, the probe will be out of range. But by then the probe will have arrived and fulfilled it's first series of sensor readings and relayed them back to Kerbin. 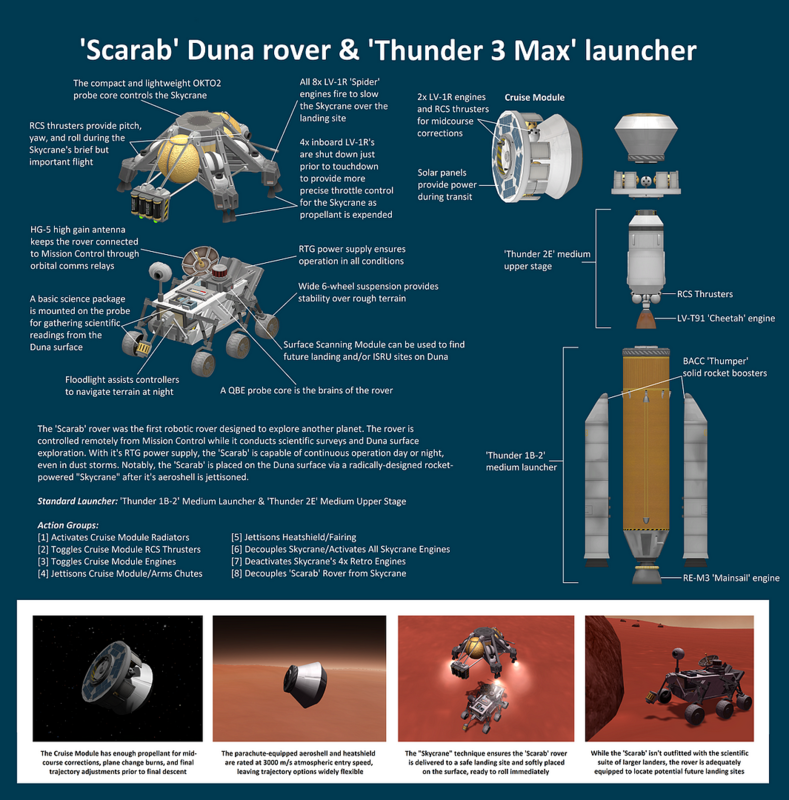 1) This probe is designed to be a good entry-level Duna probe, and as such has a large reserve of excess delta-V. This should encourage players that aren't experienced with interplanetary transfers, or propulsively capturing into a stable orbit following an interplanetary transfer, to take that jump and learning how. 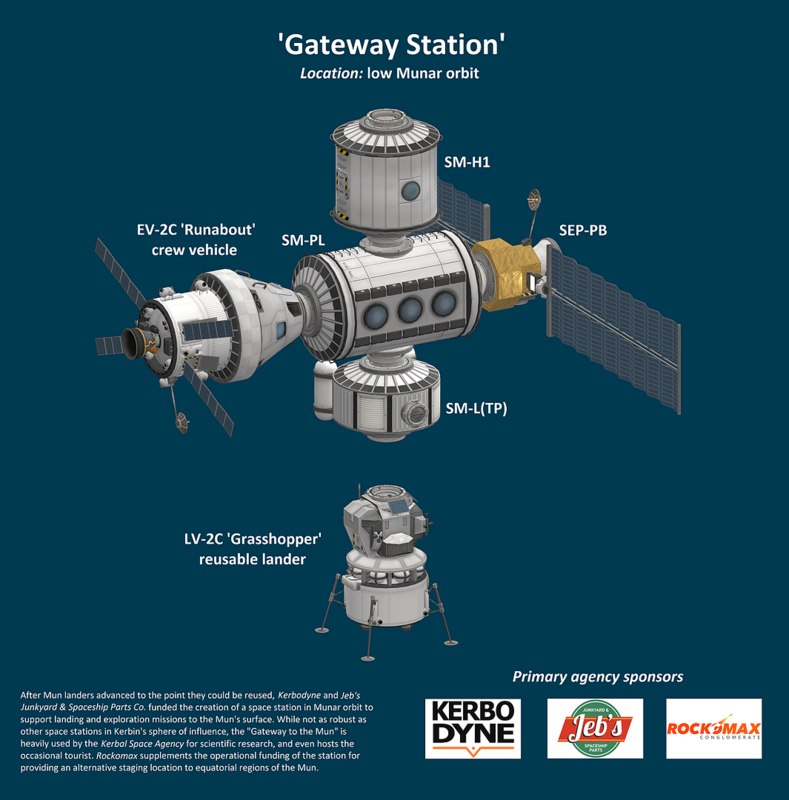 Further, with a large comm relay antenna, this probe also allows players to gain that vital communications foothold in the Duna SOI for follow-on missions. 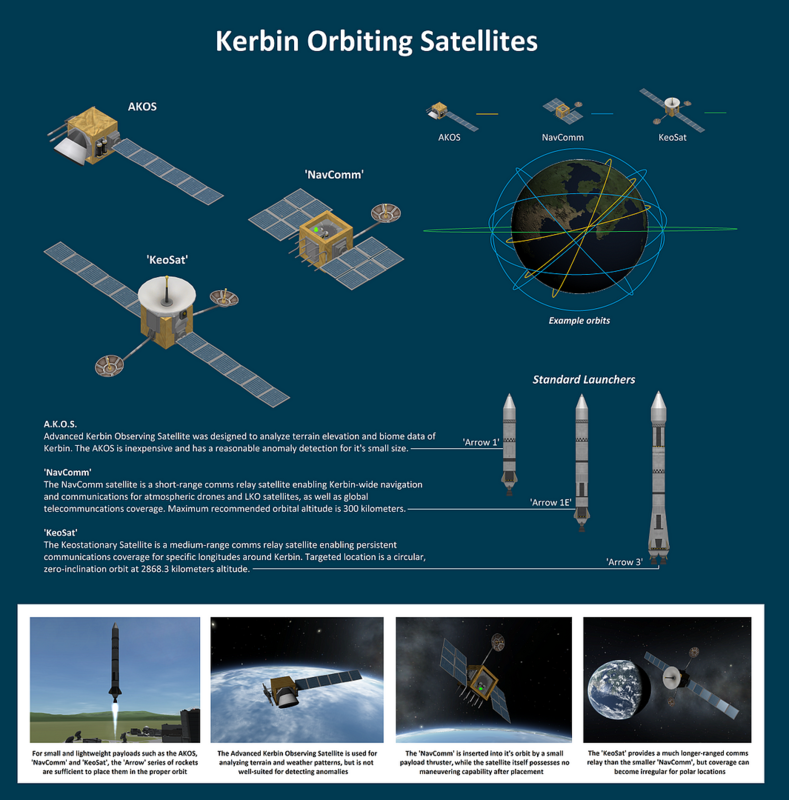 1) A high periapsis is recommended during the initial Eve SOI encounter (around 30,000 km), followed by a braking burn into an elliptical orbit. With the elliptical orbit's periapsis around 110-120 km altitude, go ahead and separate the lander. 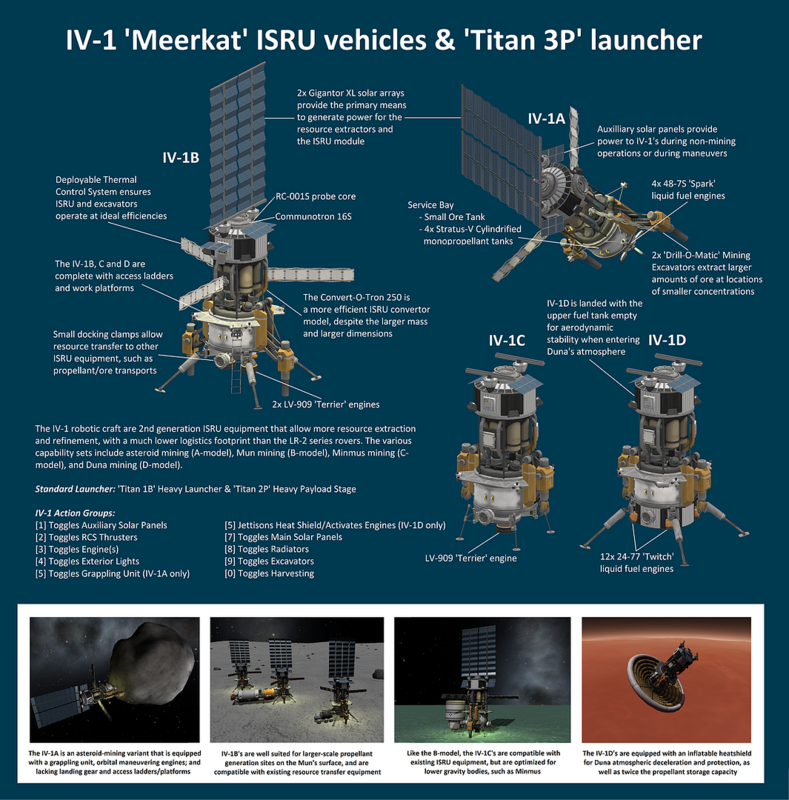 The lander will need to execute a series of incremental aerobraking maneuvers, dipping into the atmosphere to 80km. A lot of the ablator will be burned away and the craft will get hot, but it has been tested to be survivable multiple times. 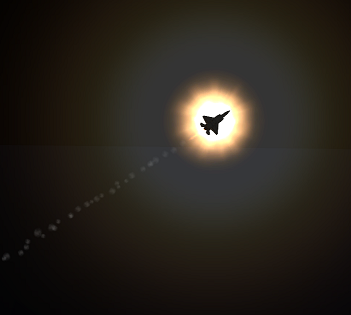 Not recommended for players inexperienced with aerobraking around Eve...unless you're trying to learn (F5!). 1) Please review the Action Groups in the graphic above or in the drop-down description box in the VAB editor screen in-game. 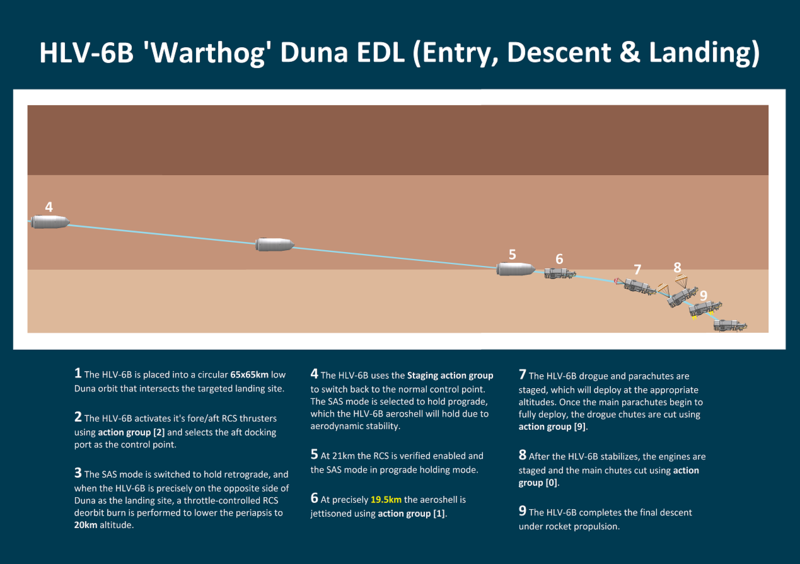 Starting with  each action group is pressed in sequence at the appropriate phase of the EDL (Entry, Descent & Landing) at Duna. 2) After separating the 'Thunder 2E' upper stage from the cruise module, double-tap  to ensure the proper control axis for the cruise module orbital engines. 3) When the rocket is initially launched by pressing the STAGE button, the appropriate Control Axis will automatically be selected, which will re-align the navball correctly. 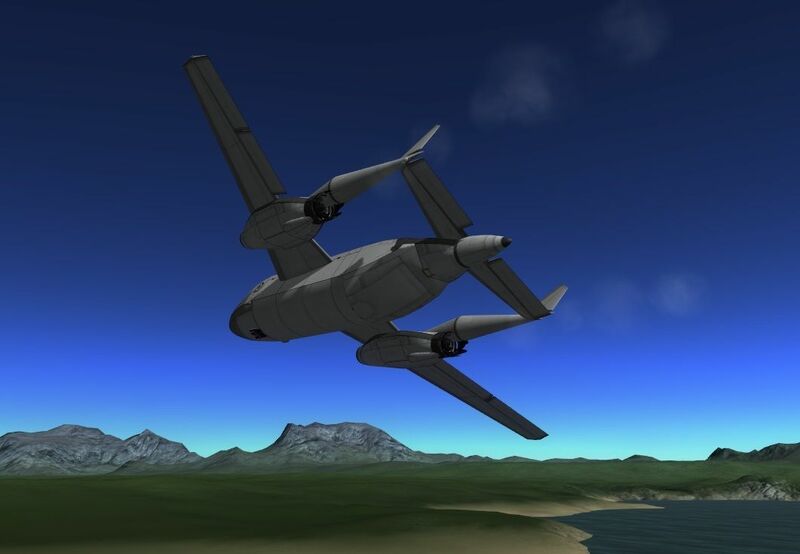 1) Using a Tylo "gravity brake" maneuver is required when entering the Jool SOI to preserve on-board delta-V for follow-on orbital adjustments. 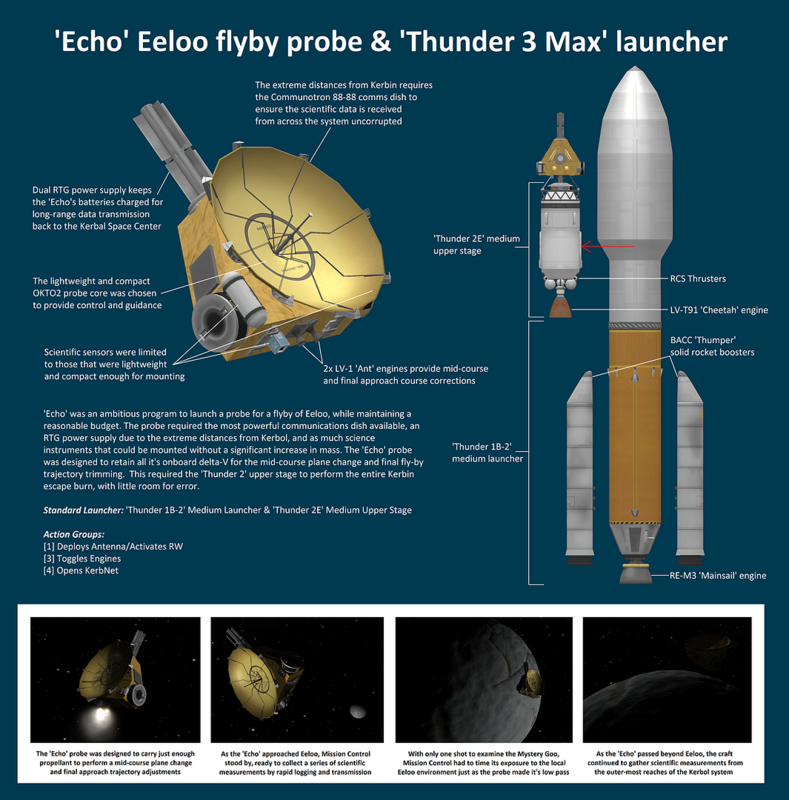 1) Neither of these satellites' onboard bipropellant engines have enough delta-V to capture into Moho orbit. 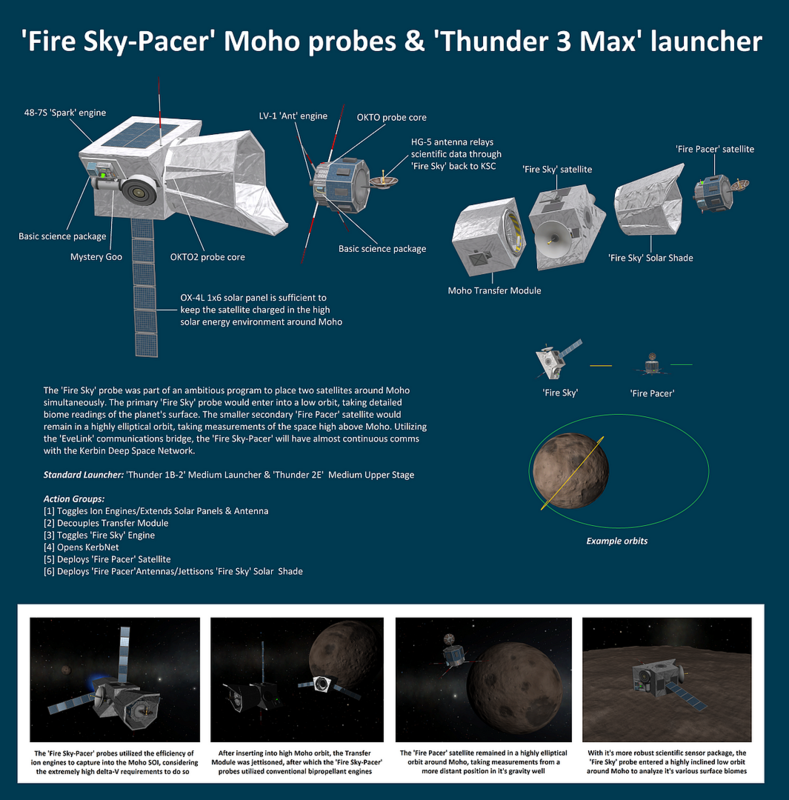 Use the ion engines to brake into a stable Moho orbit, and use the bipropellant engines to adjust the orbits of each satellite to the desired parameters. 1) When using the 'EveLink's RCS with it's booster pack still attached, it will appear the RCS system isn't working. This is due to the Center-of-Mass (CoM) being very close to the RCS mounting locations. The system will still work, but very slowly. 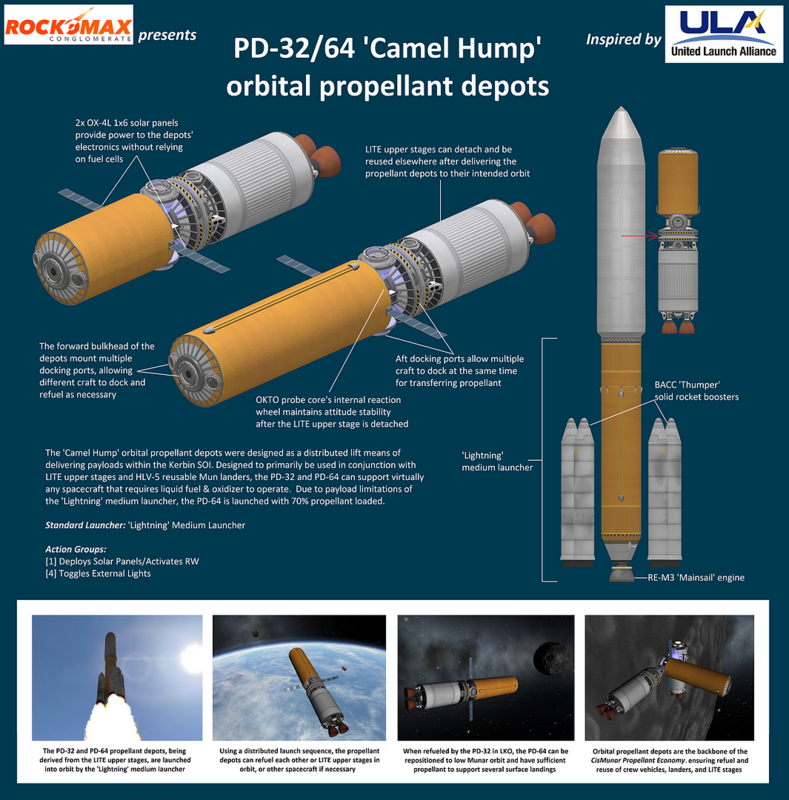 After the booster pack is jettisoned the RCS system will be more effective for attitude control. 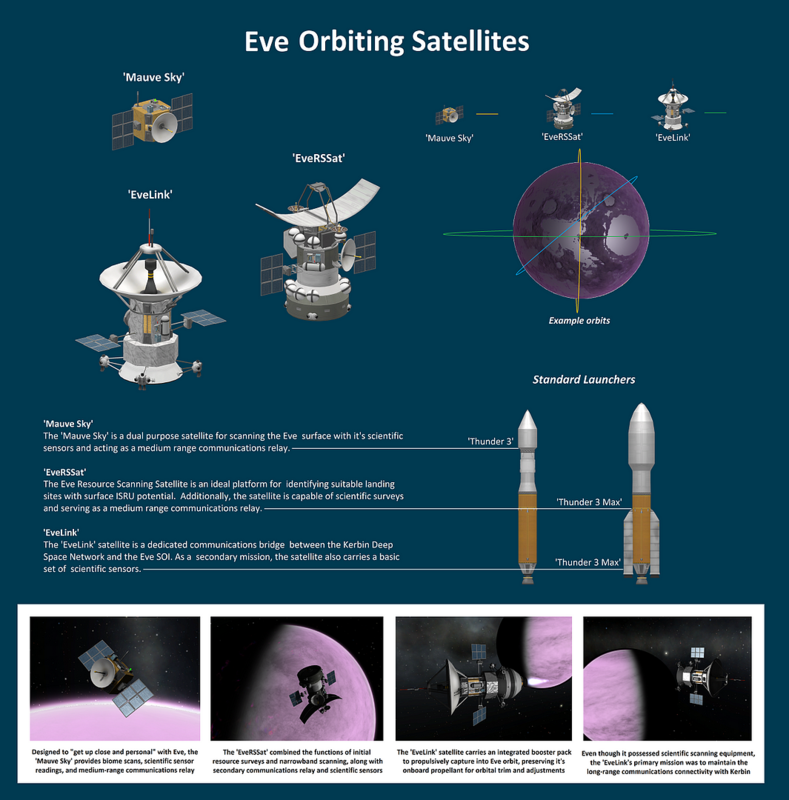 2) All three of these craft have small docking ports mounted to permit propellant refueling by any future assets you may send to the Eve SOI. 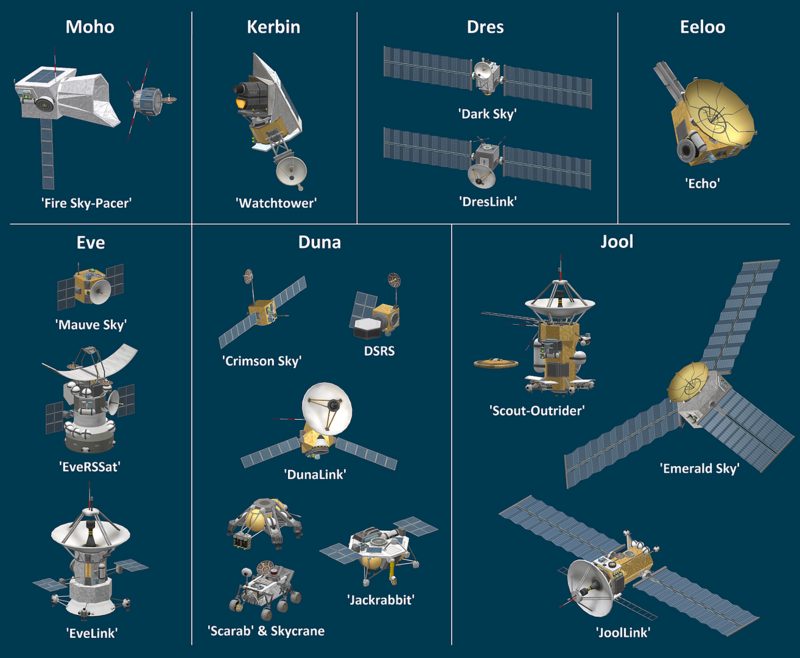 Real-life influence: ESA "Venus Express"
Real-life influence: Soviet "Venera 15"
1) All three of these craft have small docking ports mounted to permit propellant refueling by any future assets you may send to the Duna SOI. 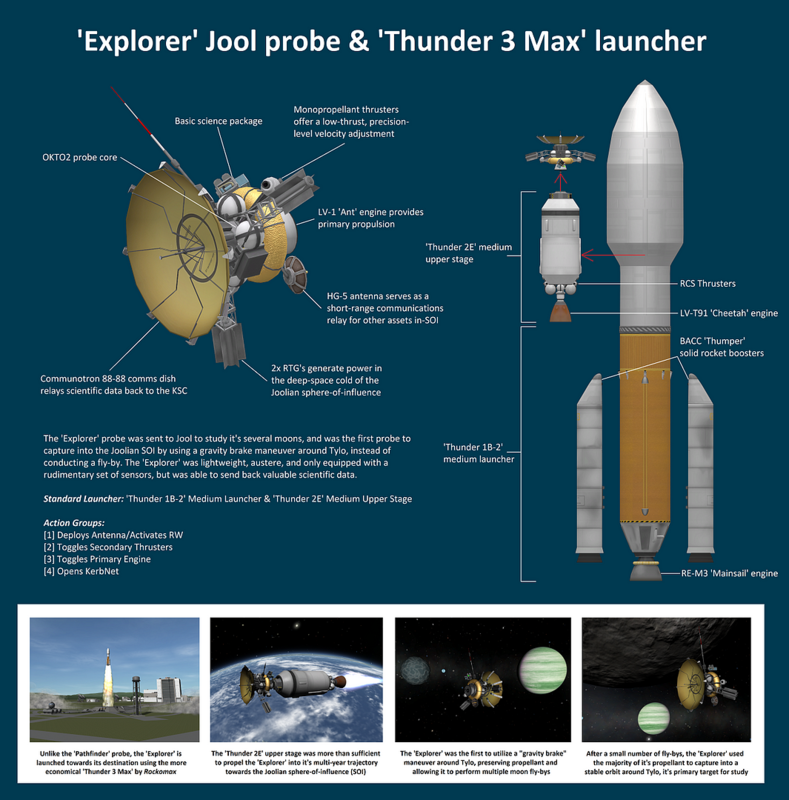 Real-life influence: NASA "Mars Global Surveyor"
Real-life influence: NASA "2001 Mars Odyssey"
Real-life influence: NASA "Mars Reconnaissance Orbiter"
1) Using a Tylo "gravity brake" maneuver is recommended when entering the Jool SOI to preserve on-board delta-V for follow-on orbital adjustments. 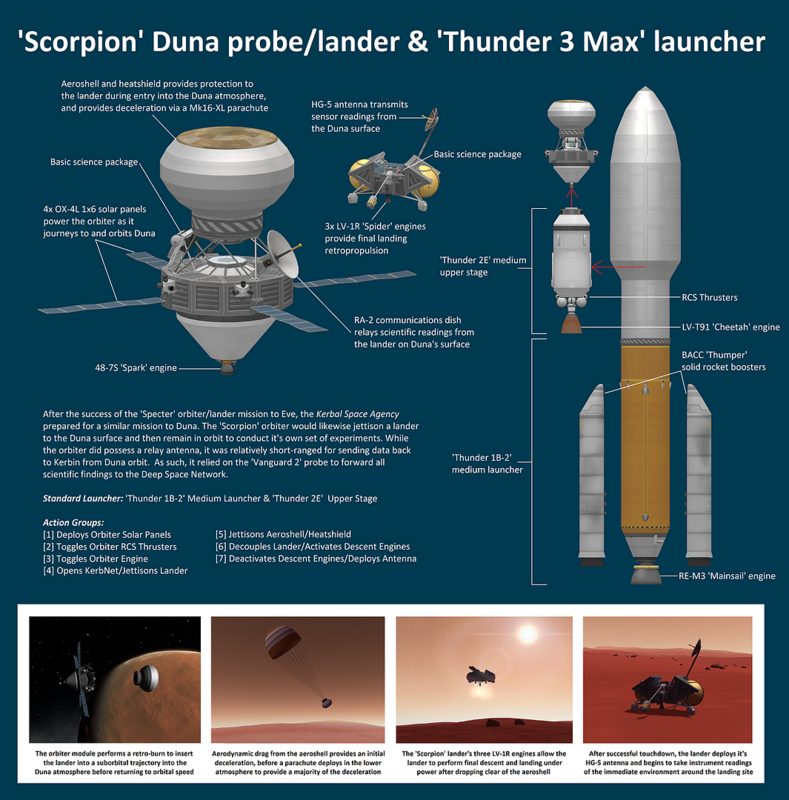 2) The primary engine on the 'Scout' is aligned with the average Center-of-Mass (COM) while the lander is still attached. 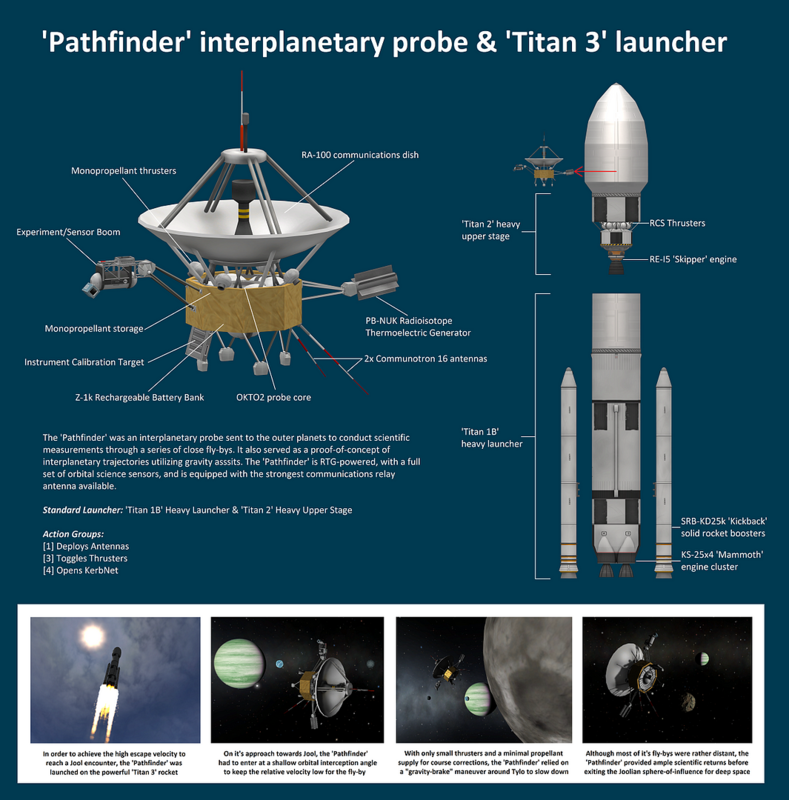 After jettisoning the lander into Laythe's atmosphere, the secondary engine should be used, since it's aligned with the probe's average CoM without the lander and lower propellant levels. However, since these engines are perfectly aligned with the probe core's control axis, you may need to make small adjustments following each maneuver node execution. 3) The primary sensor group can be logged and transmitted using action groups, however the sencondary sensor group requires manual operation via the respective Part Action Windows (PAW). The two Mystery Goo's can only be used once so decide when and where prior to the mission of when you want to leverage these science points. 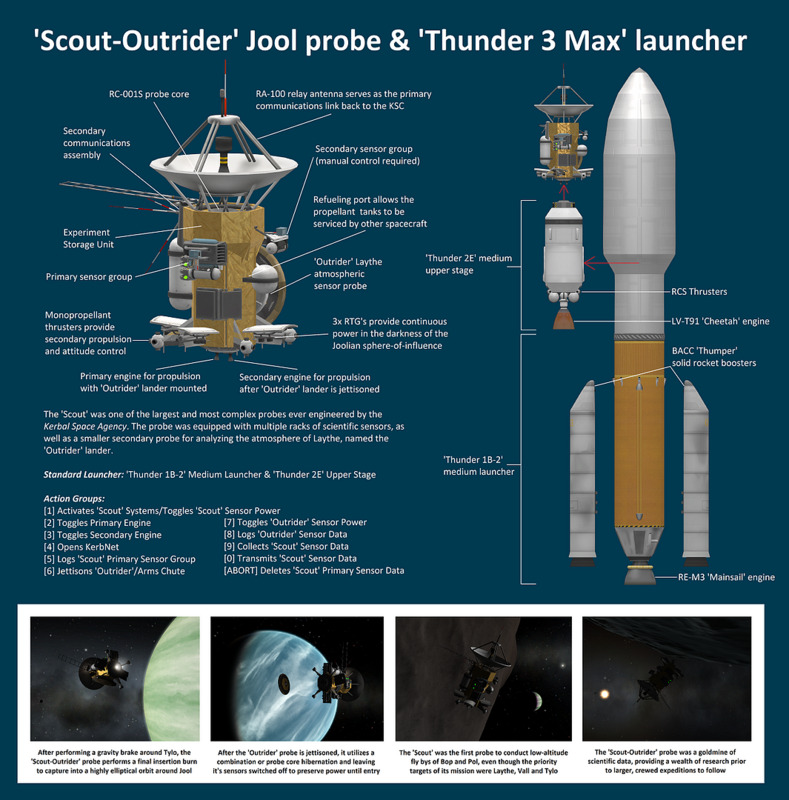 4) The 'Outrider' probe is intended to make a single measurement of the Laythe lower atmosphere as it is falling, and then transmit that data to the 'Scout' before it passes over the horizon. 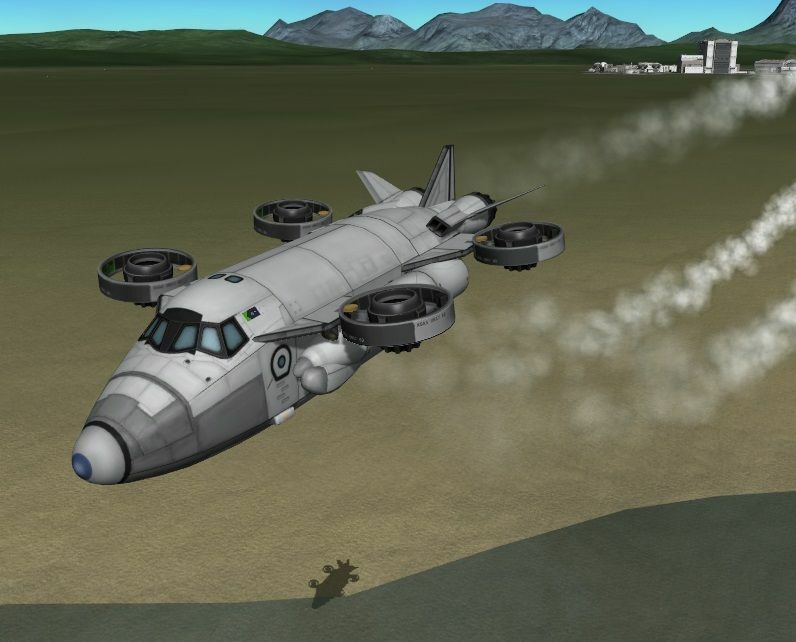 The 'Outrider' requires 120 units of electric charge to do this, therefore the lander must be jettisoned on a suborbital trajectory far enough away from Laythe the 'Scout' can adjust it's course to remain in space, but not to far away from Laythe that the 'Outrider's batteries run down before transmission. The chart below lists the duration the 'Outrider' can remain charged enough to make a single transmission of each experiment. 1) This craft has very tight performance margins throughout it's mission. 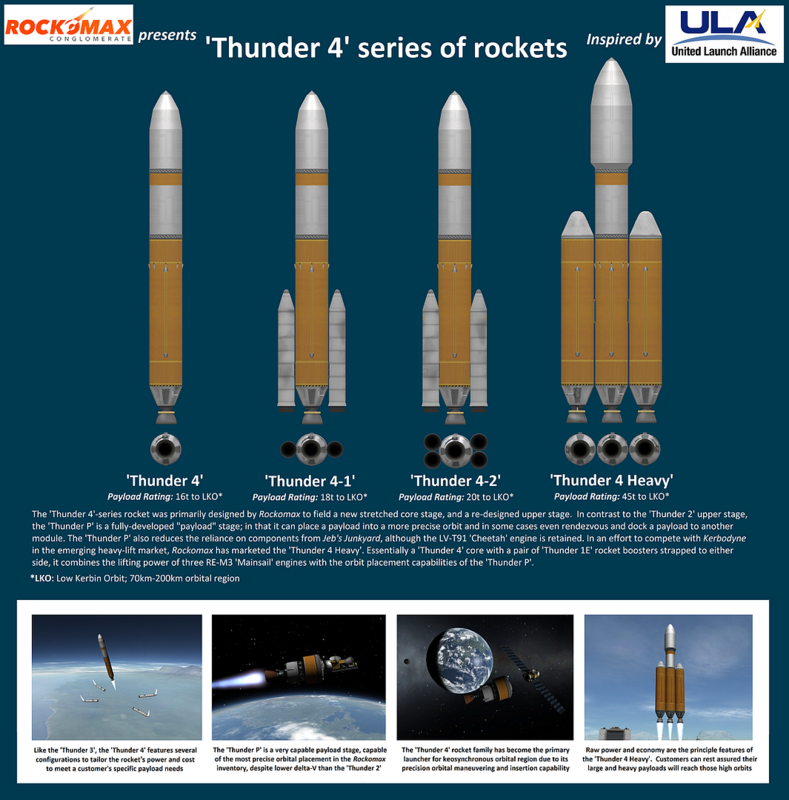 Almost all the onboard propellant is designed for use during the mid-course plane change burn. 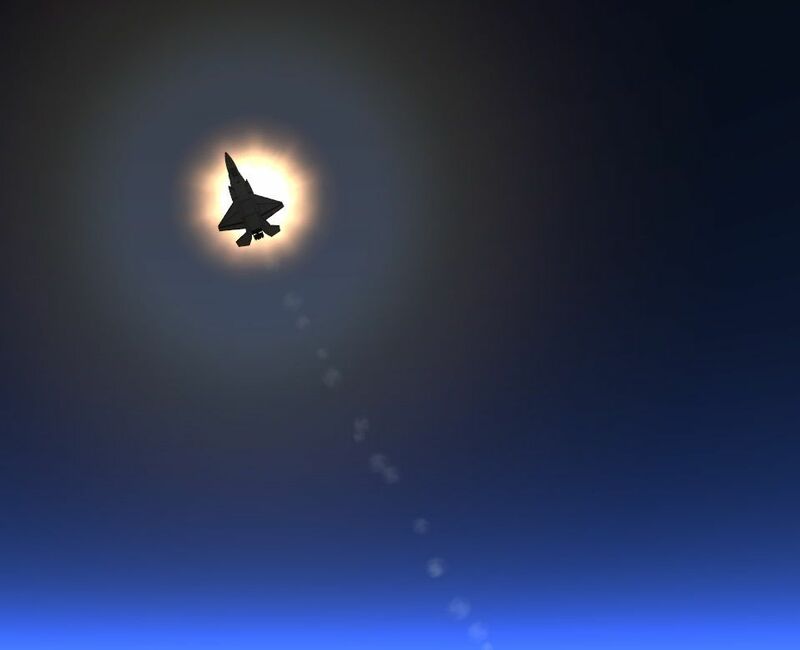 If executed properly, the upper stage has more than enough to send the probe on it's way out of the Kerbin system, followed by the probe using it's own engines to perform the plane change. 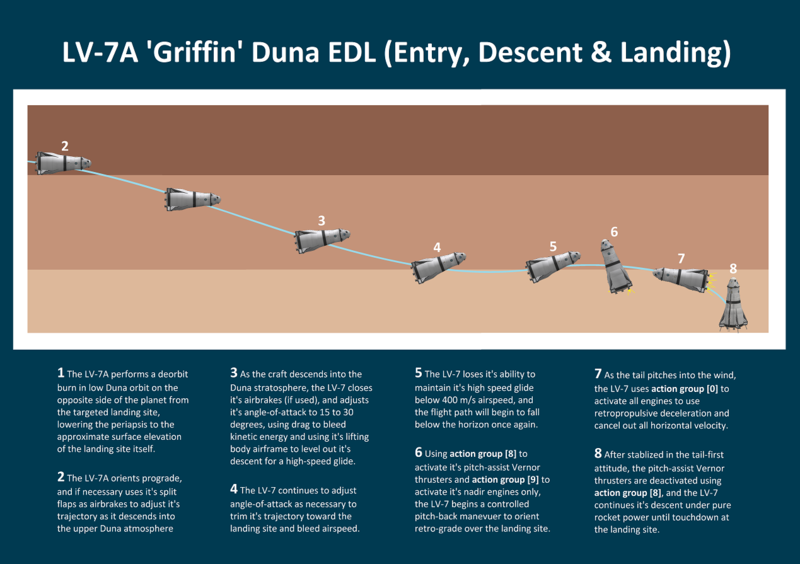 There should be 90-100 m/s delta-V remaining for final approach adjustments prior to the fly-by. Good luck. 2) When the rocket is initially launched by pressing the STAGE button, the appropriate Control Axis will automatically be selected, which will re-align the navball correctly. 3) Every time the probes engines are toggles with Action Group , the small docking clamp at the base of the RTG's will be selected as the appropriate control axis for burns using the 'Echo's onboard engines. 1) Even with the wide, fixed/rigid landing struts, setting down on Gilly still requires patience and finding a very flat spot. 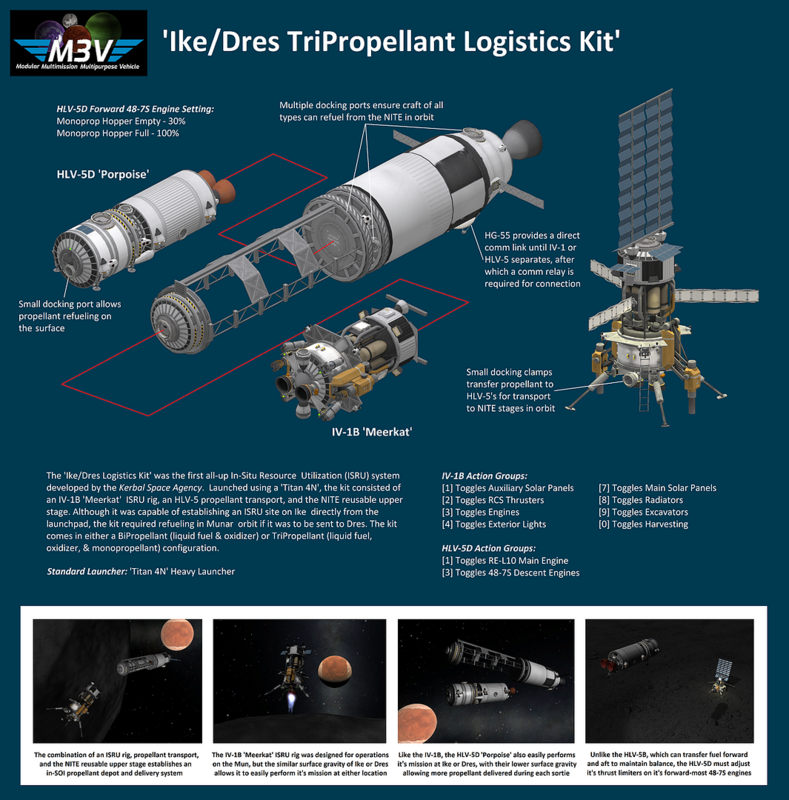 1) To make it to Dres orbit, re-position this kit to Munar orbit and top off on propellant before departing. 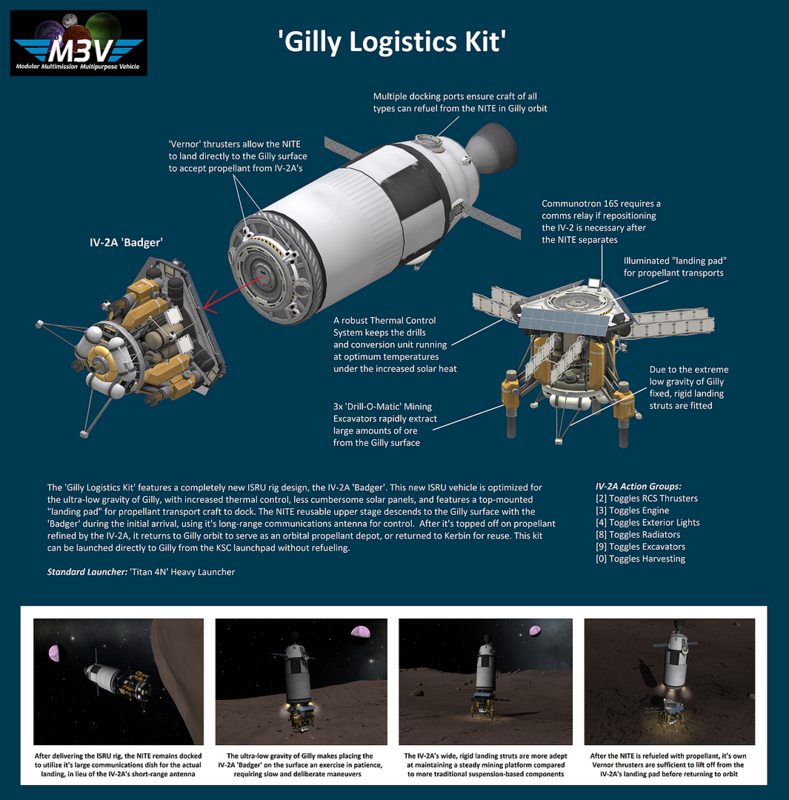 1) This kit has the capability to travel from launchpad to Pol surface without refueling, however a Tylo "gravity brake" maneuver will be required. 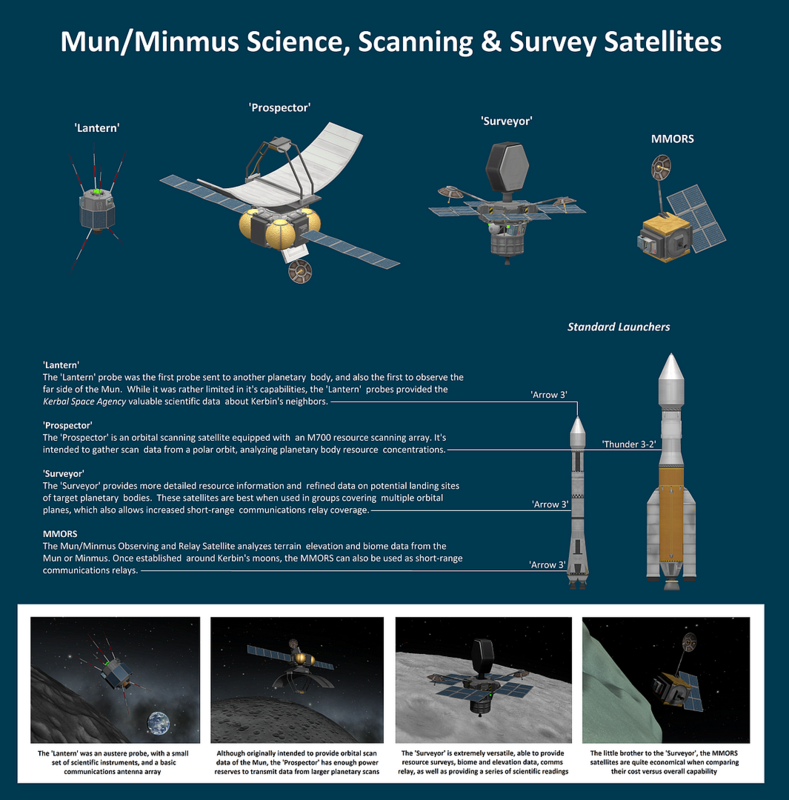 If unsure of your propellant margins, it may be wise to proceed to low Munar orbit, top off on propellant, and then depart. 2) Even with the wide, fixed/rigid landing struts, setting down on Pol still requires patience and finding a very flat spot. 3) Care should be taken when landing the NITE to the IV-2B's upper docking pad. 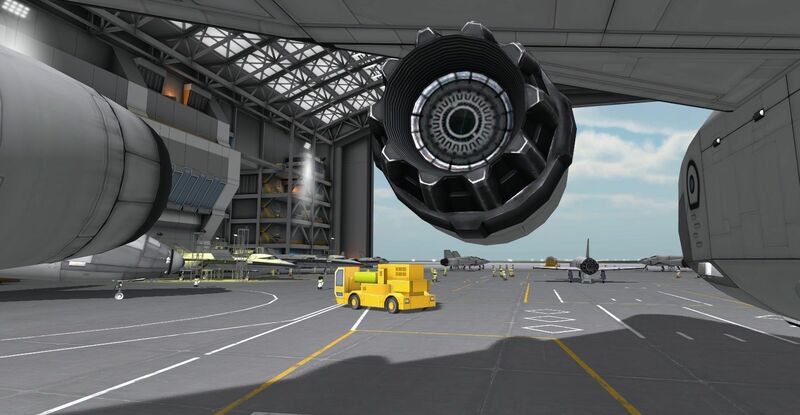 Use the NITE Thrust Assist Pack's searchlights to align with the landing pad as seen in the graphic above. This will ensure the thrust plumes from the Assist Pack do not damage or tip over the IV-2B prior to landing. Additionally, it is wise to cease mining operations and retract the radiators prior to initiating NITE landing/departure maneuvers. 1) The Vernor thrusters on the M3V-PL are there to provide proper balance during docking and translation maneuvers. Otherwise, you can leave them off when precision isn't needed. 2) It's worth noting that the 'Exploration Kit' isn't the only kit that could be used to directly control probes and rovers without an established comm link back to the KSC. 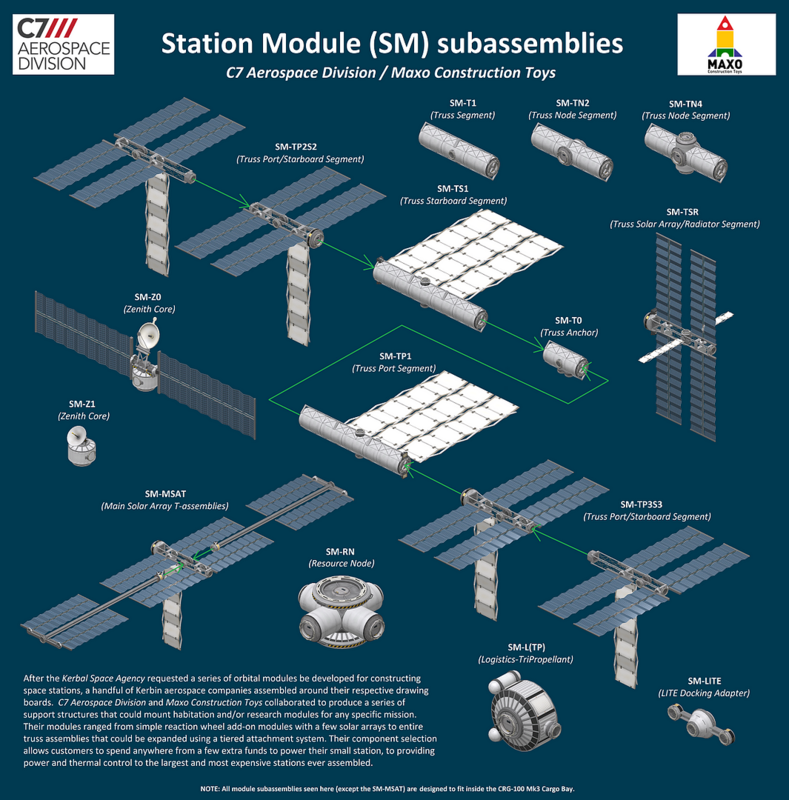 Depending on what other spacecraft are docked, the sum of all modules could allow for setting up a separate network in-SOI. 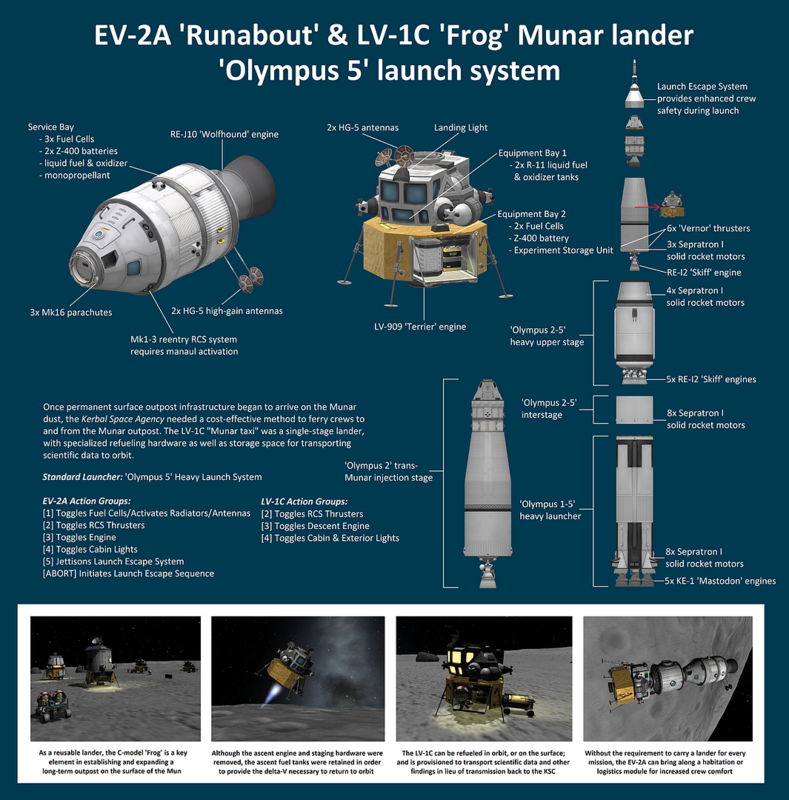 For example, an M3V-PL that is docked to any other module with a communications antenna, and with a pilot on board, can also control a probe; but can only do so through one hop. 1) The Vernor thrusters on the M3V-H are there to provide proper balance during docking and translation maneuvers. Otherwise, you can leave them off when precision isn't needed. 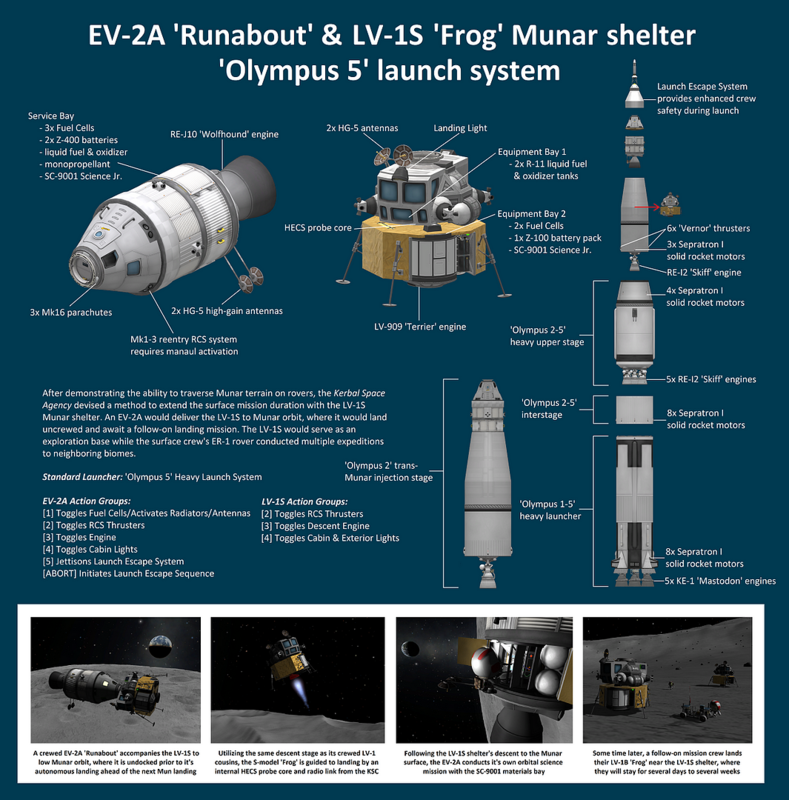 2) All interplanetary transfers were tested using a departure orbit of 30,000 meters over the Mun. 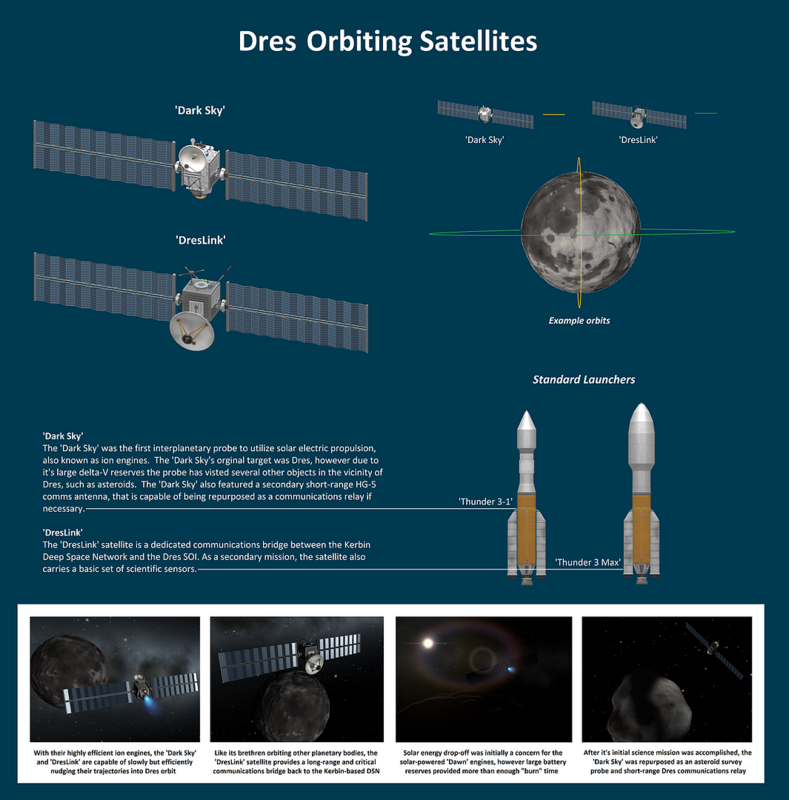 This preserves delta-V, but requires more timing in the Mun's orbit around Kerbin. 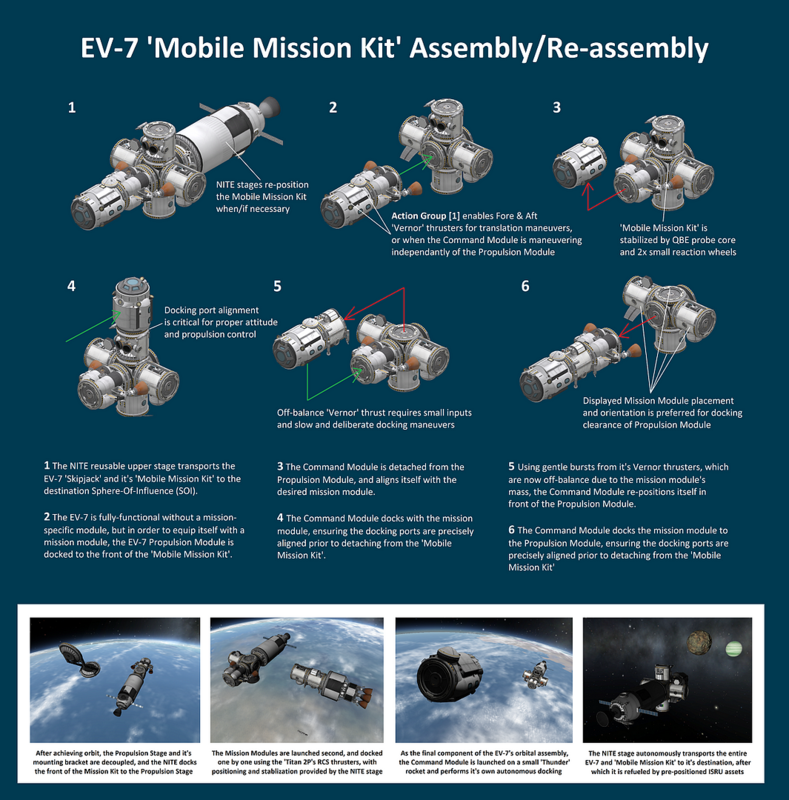 1) When re-configuring the EV-7 for with a different mission module, precision is required during docking port alignment between the Command Module, Mission Module, and Propulsion Modules. This ensures proper propulsion and attitude control orientation during maneuvers. 2) The Fore/Aft Vernors on the Command Module are also used for pitch/yaw when the Command Module is maneuvering independently on it's own. 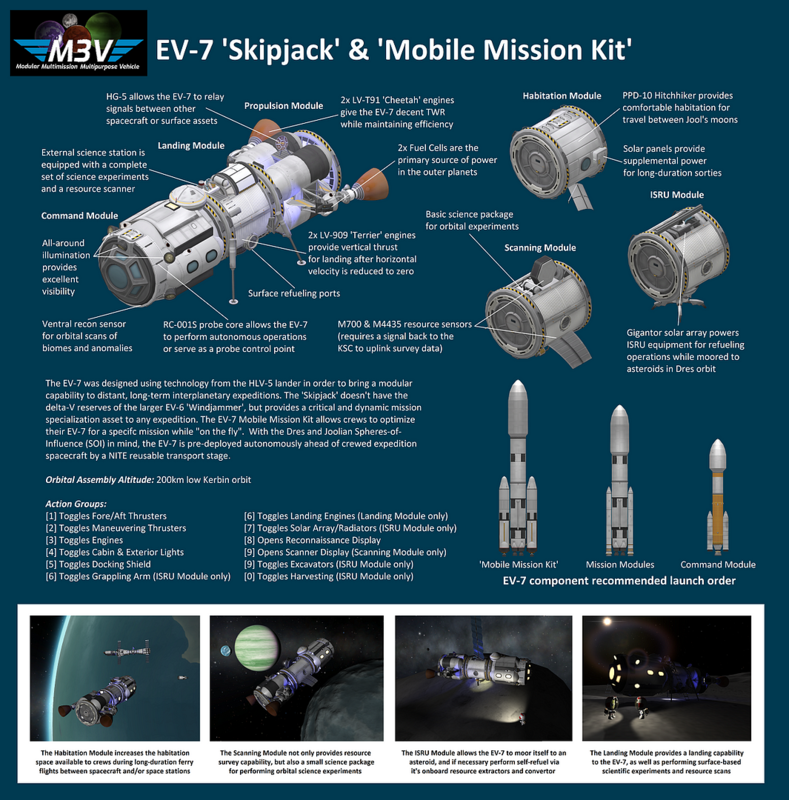 If the EV-7 is maneuvering as a whole, these thrusters should only be enabled when fore/aft translation is required (docking, precision adjustments of velocity). 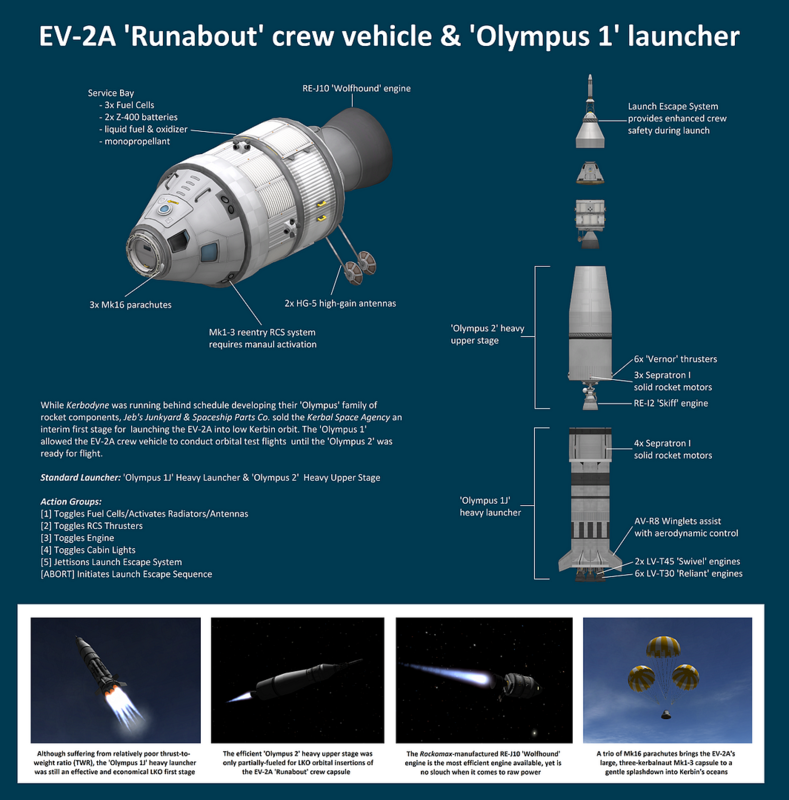 3) When the EV-7 is configured with the Landing Module, it is rated for landing up to and including Vall levels of gravity. 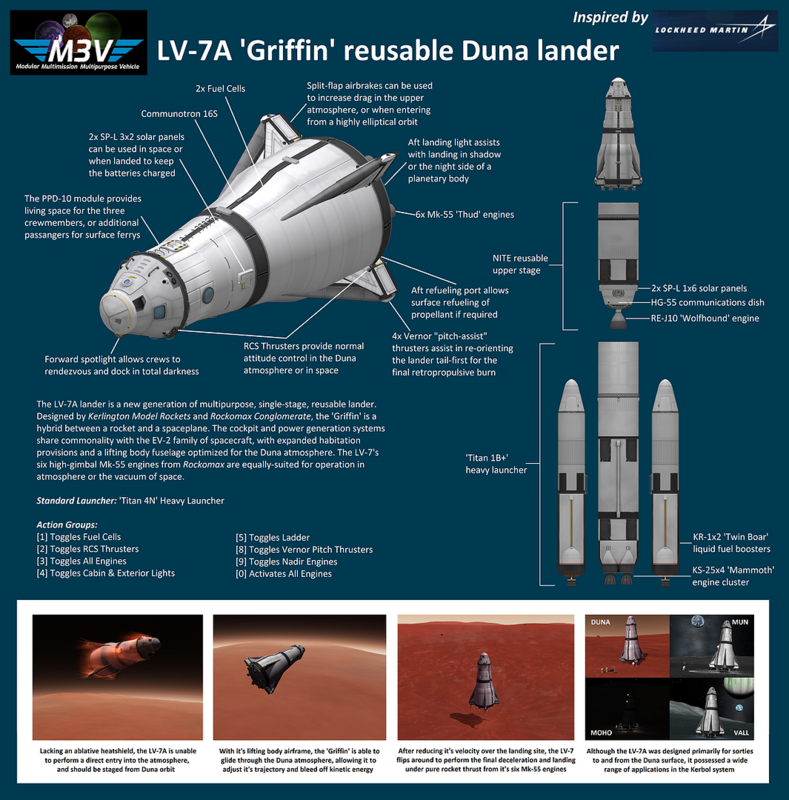 However, landing on Vall should only be attempted from low orbit and full propellant tanks. 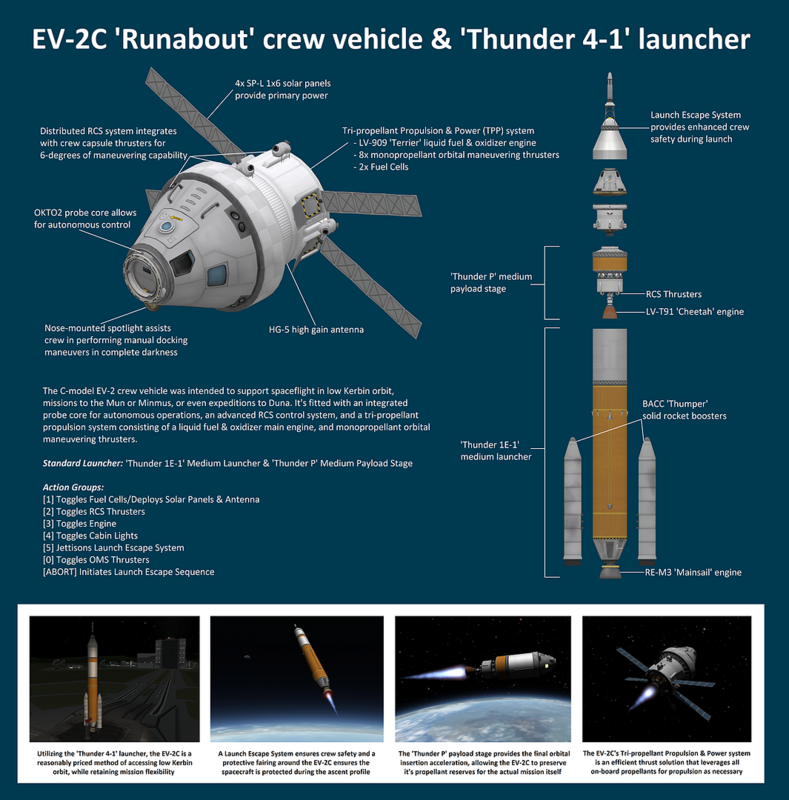 The margins are fairly narrow and is not recommended if unfamiliar with the EV-7's flight characteristics. But for everything else at Eeloo or below, it performs quite well with wide performance margins. 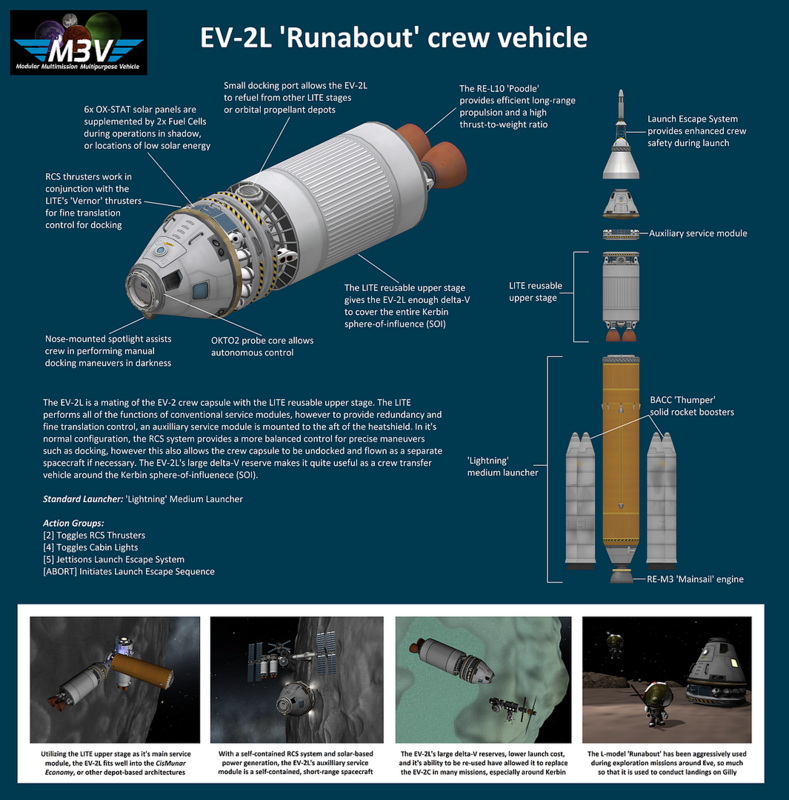 4) The Habitation, ISRU, and Scanning Modules are compatible with the EV-2L 'Runabout'. This area is still under development and revision. Please excuse my mess...or emptiness. 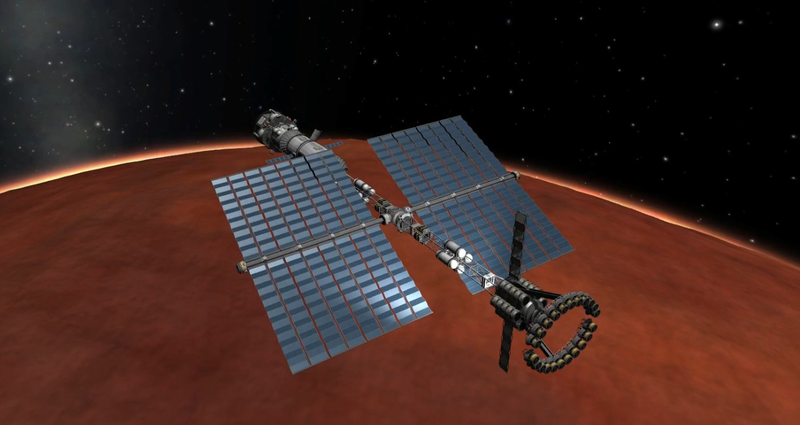 Jebediah's Junkyard & Spaceship Parts Co.
1) Use the crew vehicle to dock to the materials bay/solar array assembly and re-position it to the zenith mount. Retrieve the docking adapter from the ventral docking mount, and use it to then dock to the solar array arms from below, and move each arm to the side mounts. 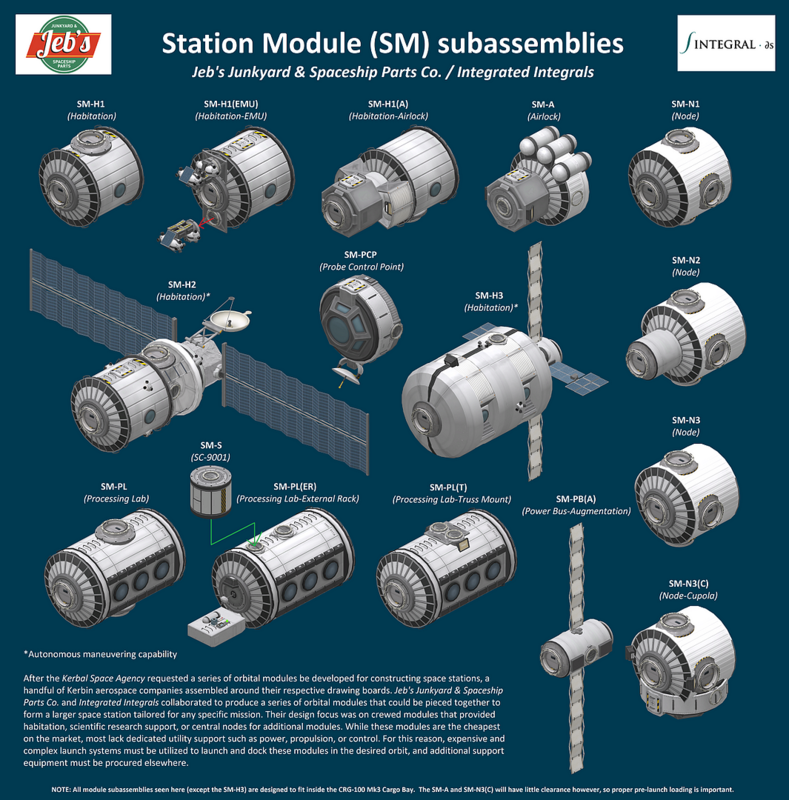 1) To download the station module subassemblies seen in this image, reference the KerbalX link in the Station Modules (SM-series) drop-down link in the Subassemblies section. 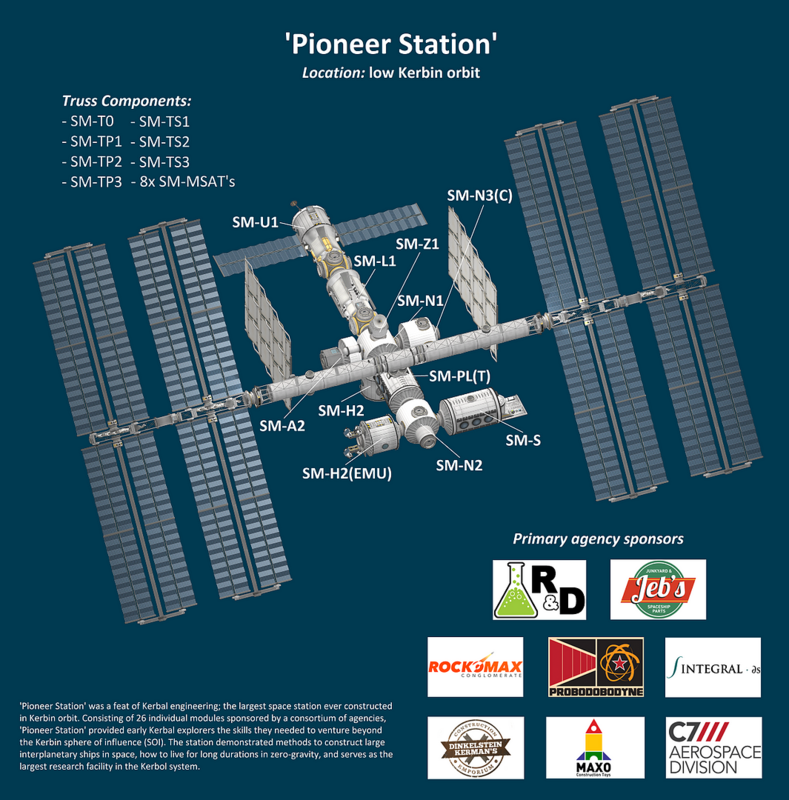 To fully construct an ISS-style station with the above modules, the total part count will be well over 500, not including the delivery launcher/Shuttle in the same area during assembly. I would recommend not building something of that scale unless your computer can handle the part count. 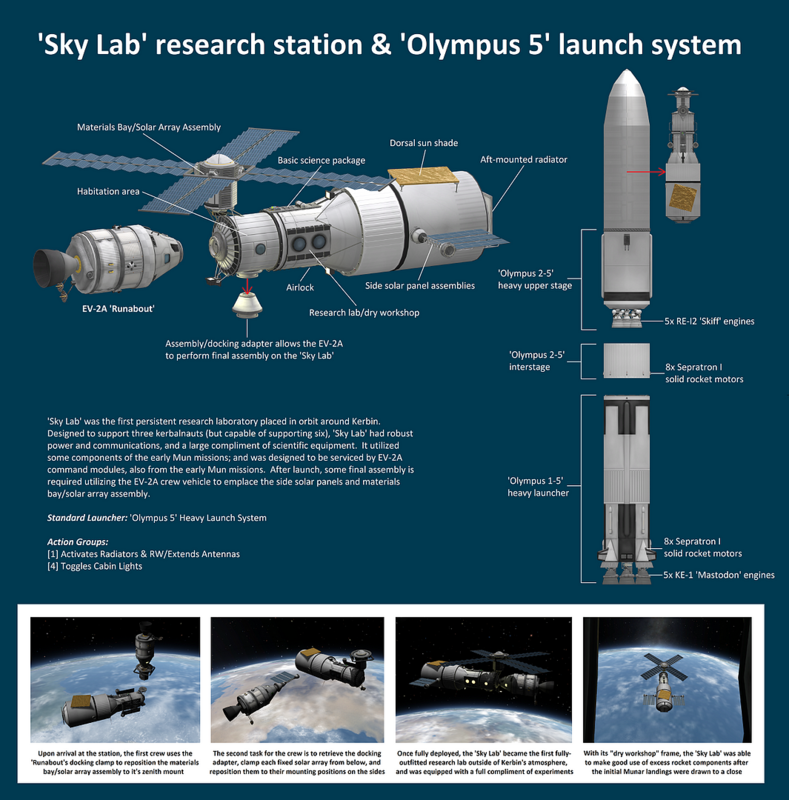 1) These station modules are intended to be launched by simple/inexpensive launchers. 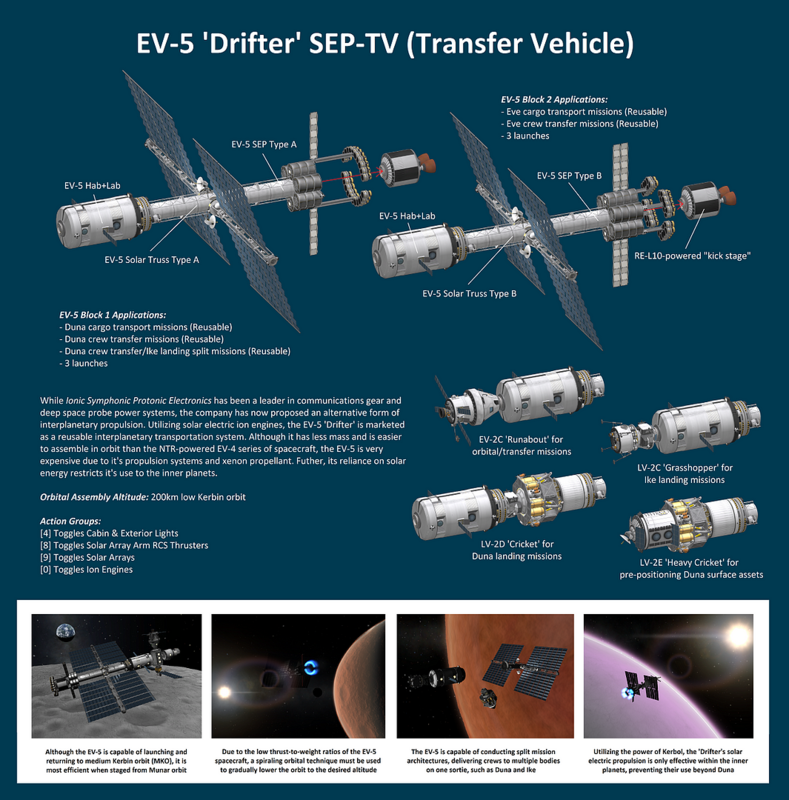 Once in orbit, these modules can autonomously rendezvous and dock themselves together. 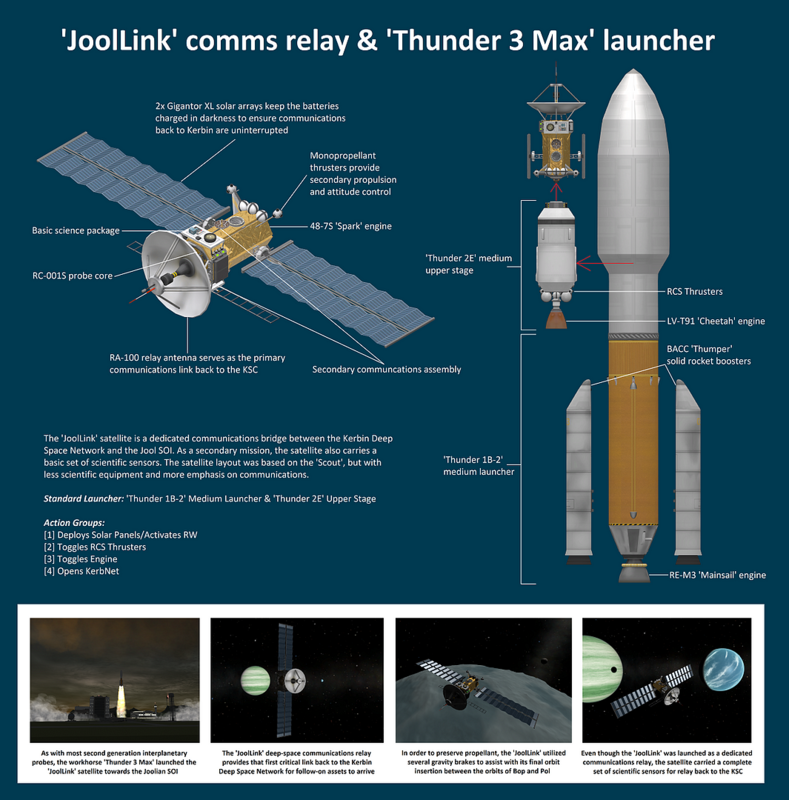 The cost savings is on the launcher system, but the modules themselves are rather expensive. 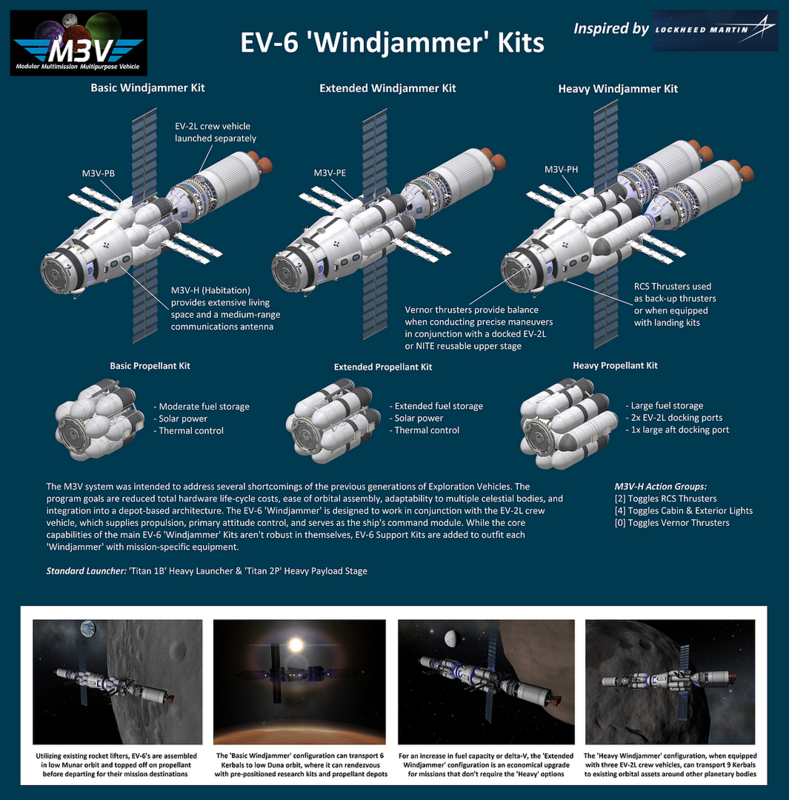 1) It should be noted that most of these station modules were intended to be assembled in orbit by E.M.U.'s. 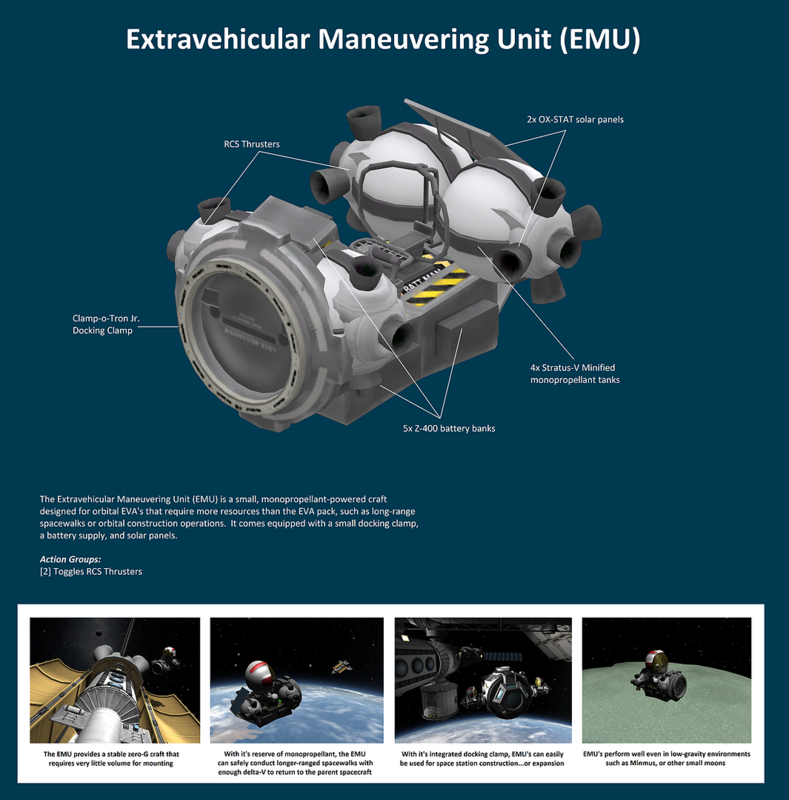 Many of the modules have small docking clamps mounted on them to facilitate EMU attachment. This is my workaround to not having a stock RMS arm available. Most of the modules require a pair of EMU's, each clamping on to opposing sides for RCS balance. 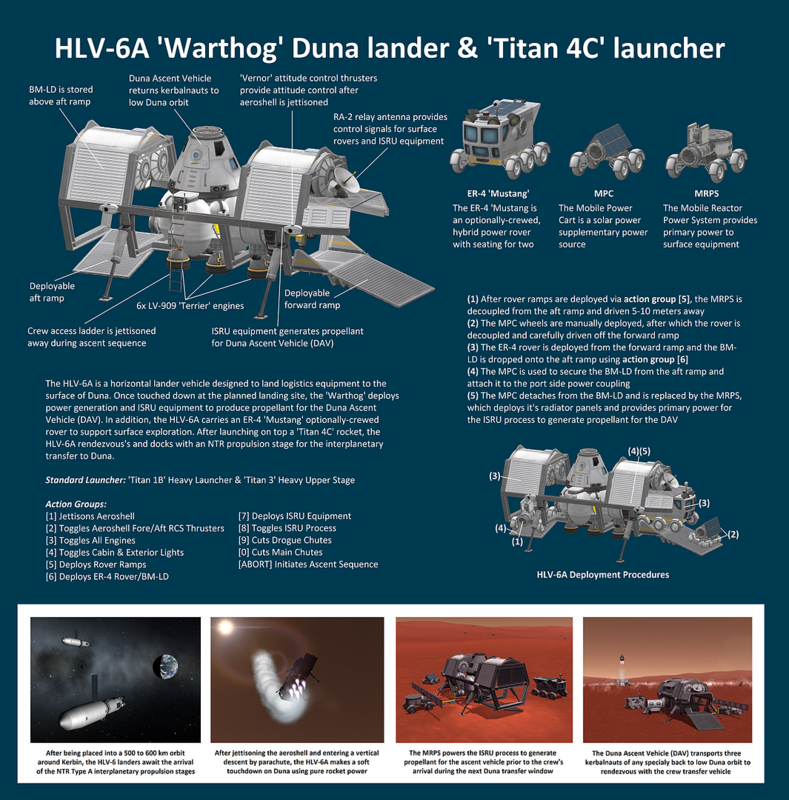 2) The SM-H2 and SM-H3 have probe cores and RCS thrusters, allowing them to maneuver themselves as necessary. 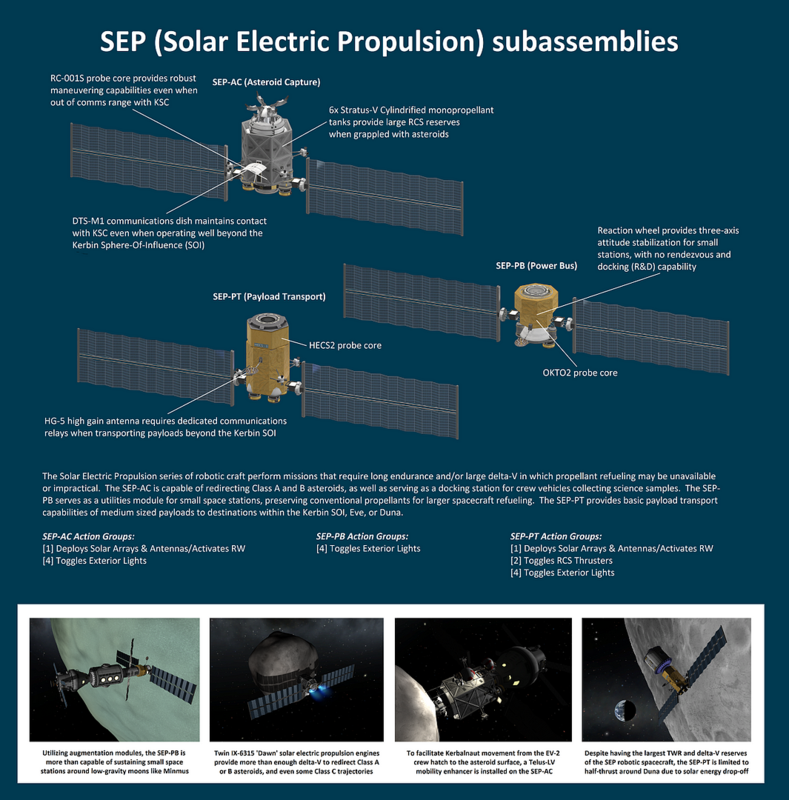 2) The SM-MSAT (Main Solar Array T-assemblies) can be attached to the truss by a single EMU. The base of the T-assembly has a small mono tank and some RCS thrusters, which will provide the opposite and balancing force when maneuvering the MSAT's into position. 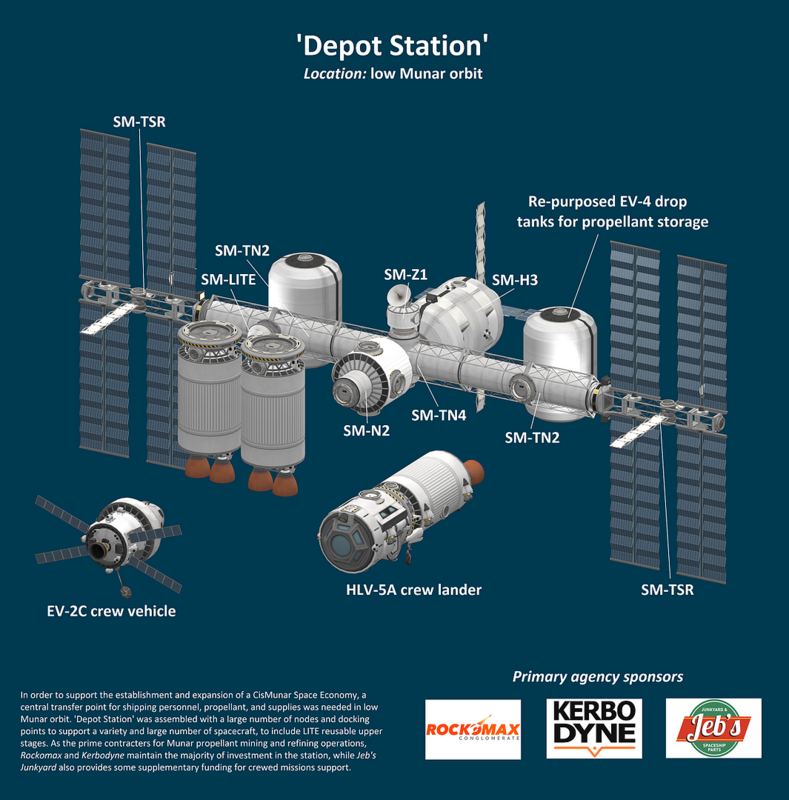 To fully construct an ISS-style station with the above modules, the total part count will be around 500, not including the delivery launcher/Shuttle in the same area during assembly. I would recommend not building something of that scale unless your computer can handle the part count. 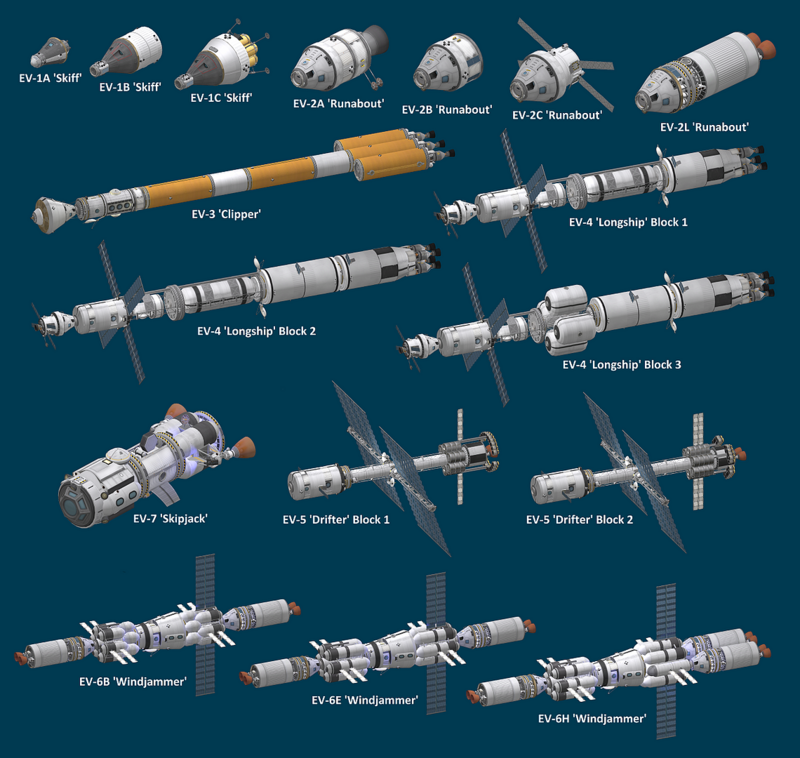 Aside from that, if anyone has screenshots of stations they've built using any of these modules, or simply added on to their own, I'd enjoy any screenshots. Happy building. 1) These modules do not have any maneuvering thrusters. 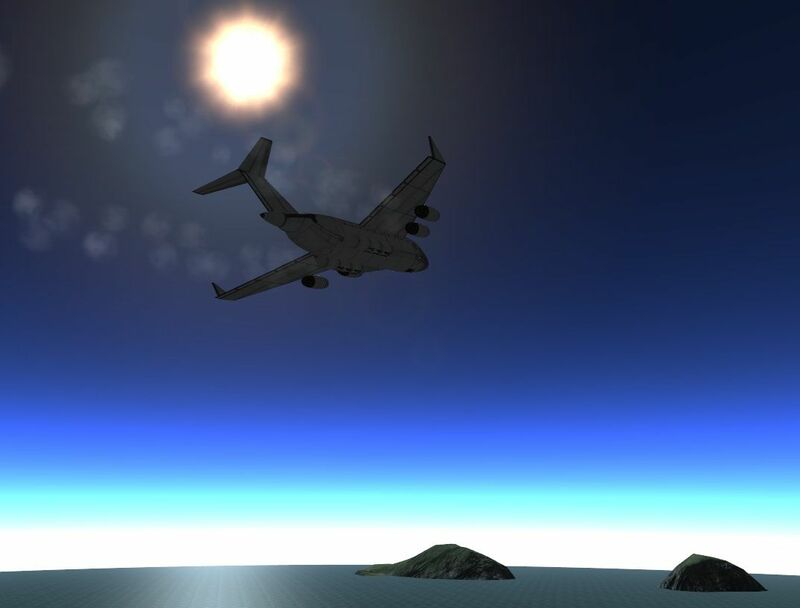 Prior to "jumping" from the cargo lander to the ground, ensure SAS is engaged. The gimbaling of the 48-7S 'Spark' engines are what maintains the attitude control of the modules during the "jump". Manage the throttle and let the module drift off the platform before easing it down to the surface. 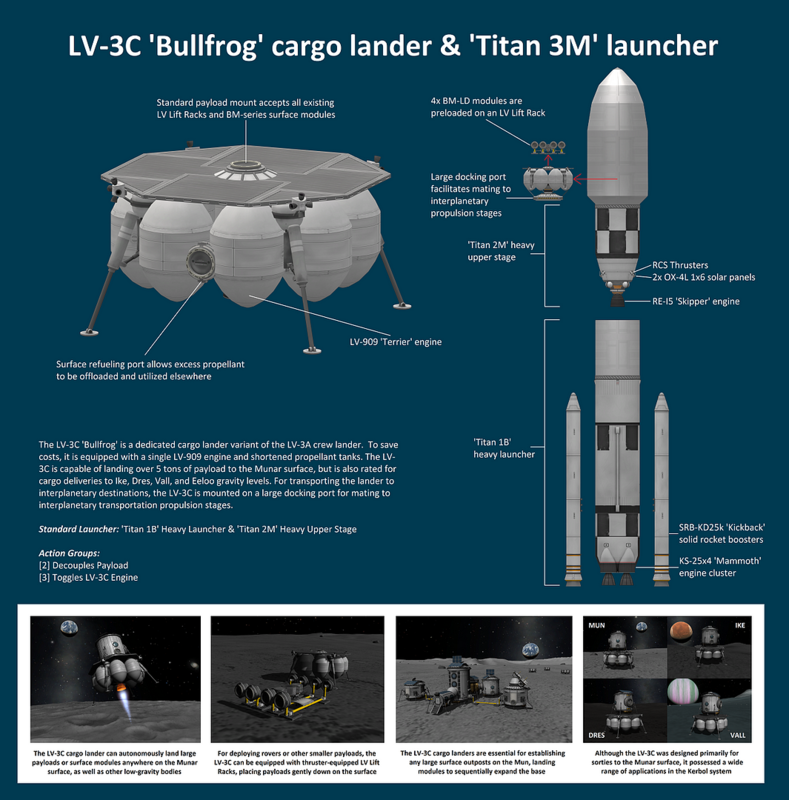 If the cargo lander has touched down on a completely level surface, a gentle nudge in pitch or yaw will initiate a lateral drift of the module away from the lander's cargo platform. 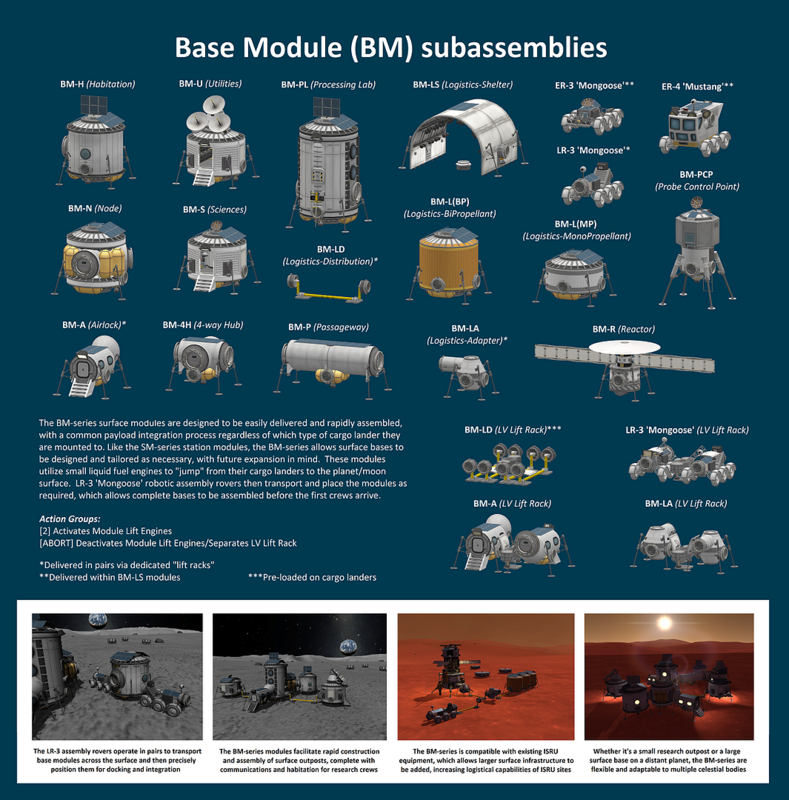 2) The BM-S, BM-U, BM-L(BP), and BM-L(MP) don't need to utilize the BM-LD or BM-LA to be functional, since these modules have more than two side docking clamps, a pair of LR-3 assembly rovers can directly attach these modules to another Base Module through the side docking clamps. 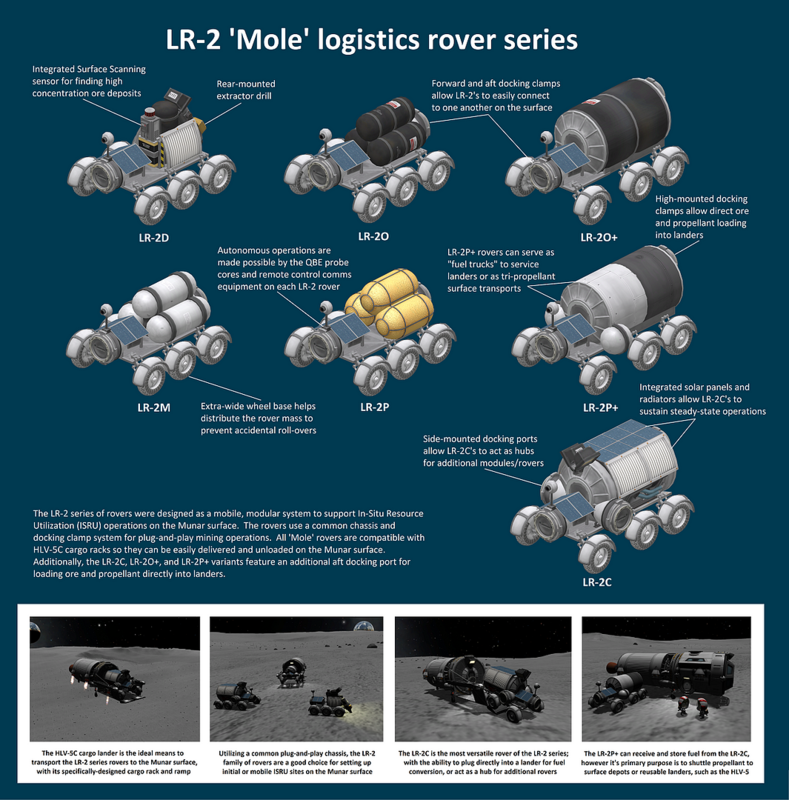 3) The ER-3 and ER-4 rovers are intended to be delivered within the BM-LS. 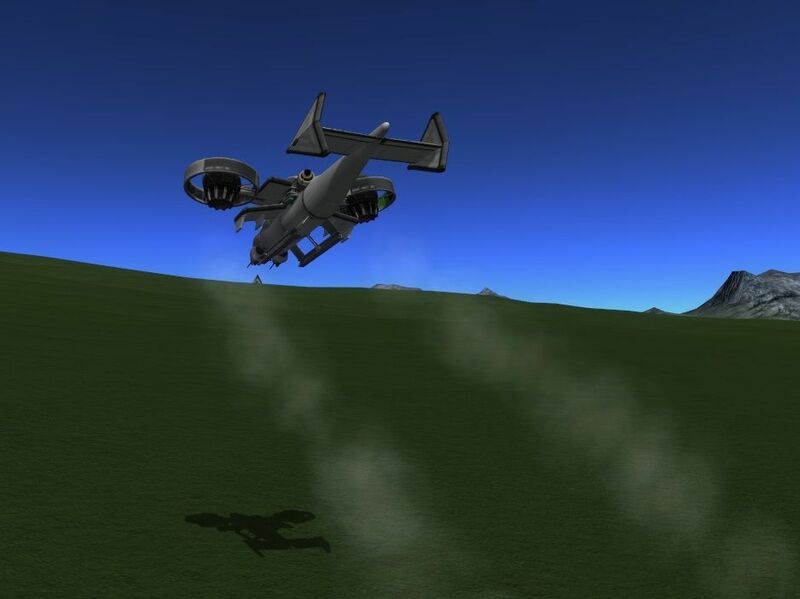 While this is the intended method, it's not entirely necessary, if you can stick the landing after driving the rover off the cargo lander "Dukes of Hazzard"-style. 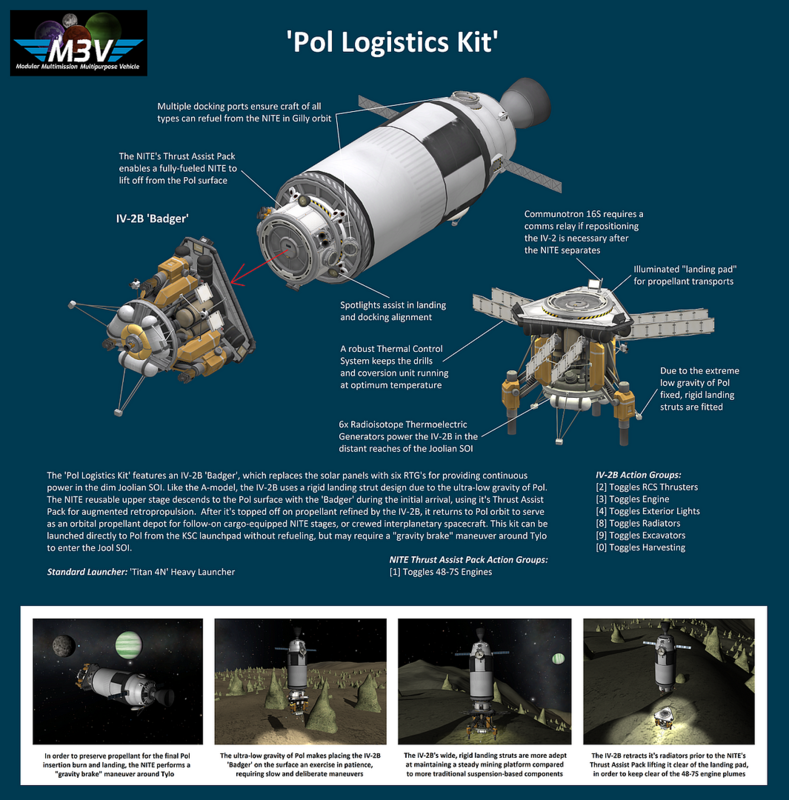 4) The BM-PCP is primarily intended for a pilot to remotely pilot cargo landers down to the landing site if no communications relay satellites are available/in range. However, it can also be integrated into an ISRU site via the BM-LA. This allows an engineer to add an efficiency boost to the ISRU equipment if desired. 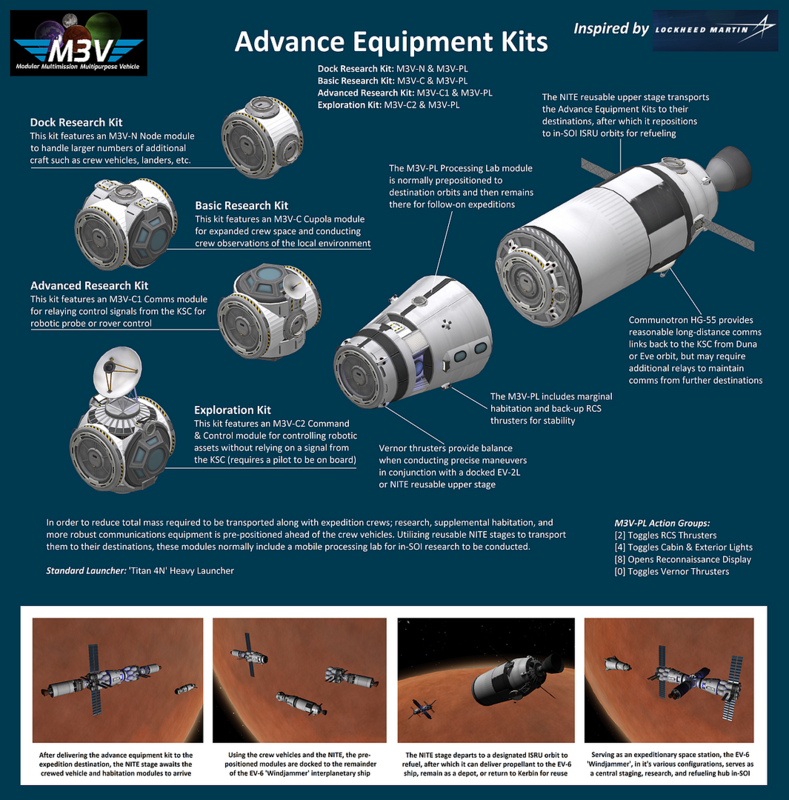 *The following craft/subassemblies will not be included in the any of the download zips. They will need to be downloaded manually. 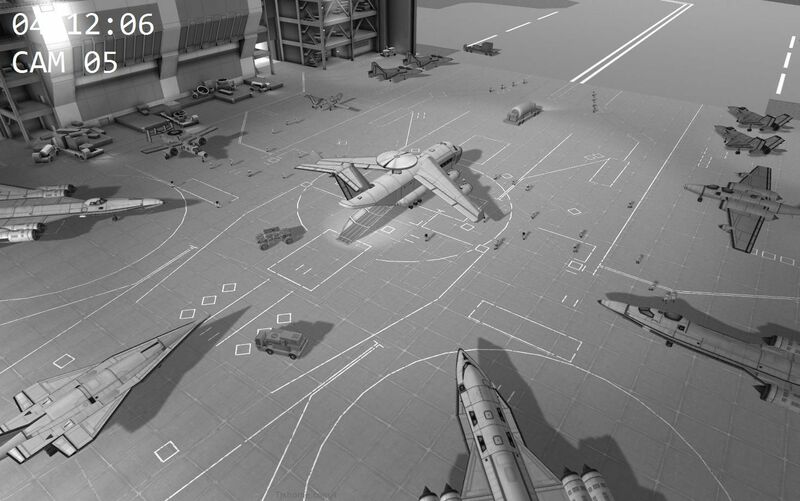 Note: If you are the first person to download a zip for a hangar since it was last updated then there will be a 10-20 second wait while the zip is created. All subsequent requests for that zip will happen almost instantly. Q: Will you make craft X or modify craft Y to have feature Z? 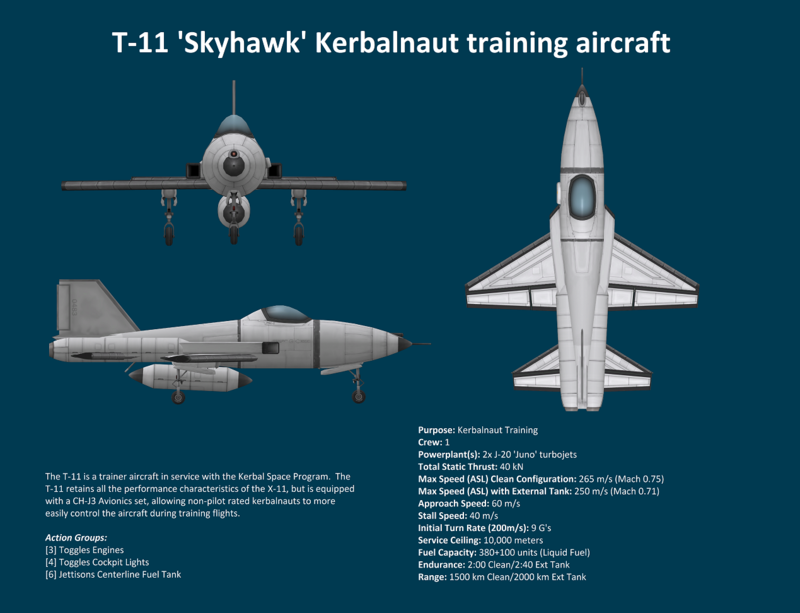 A: Craft that are shared here are made for my use in KSP, but of course everyone has different building and play styles. 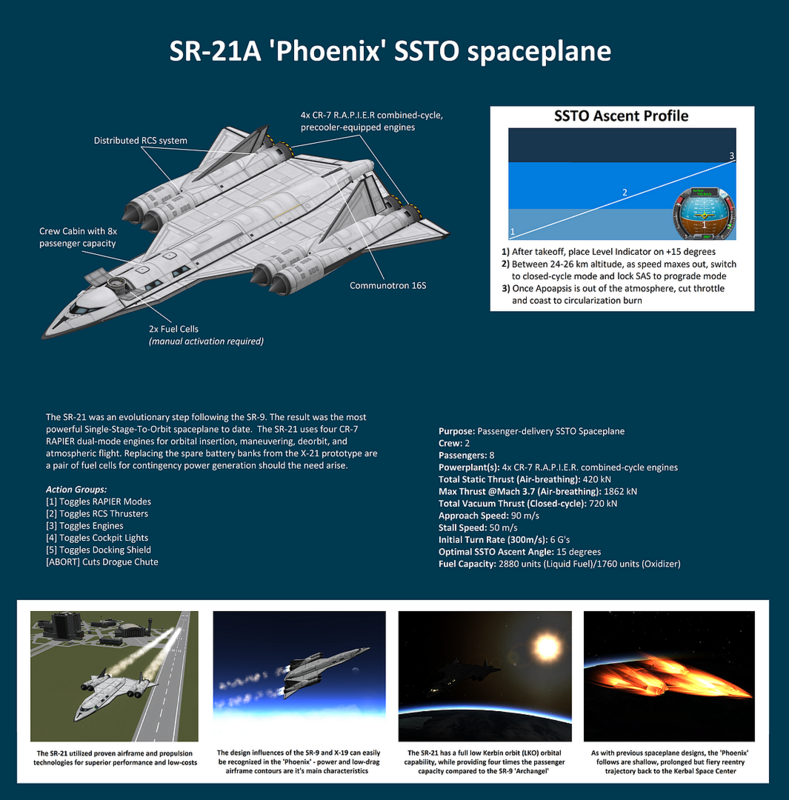 If you want an SSTO spaceplane with an LV-N engine on it, it's too easy to throw one on there yourself. I don't take craft requests. 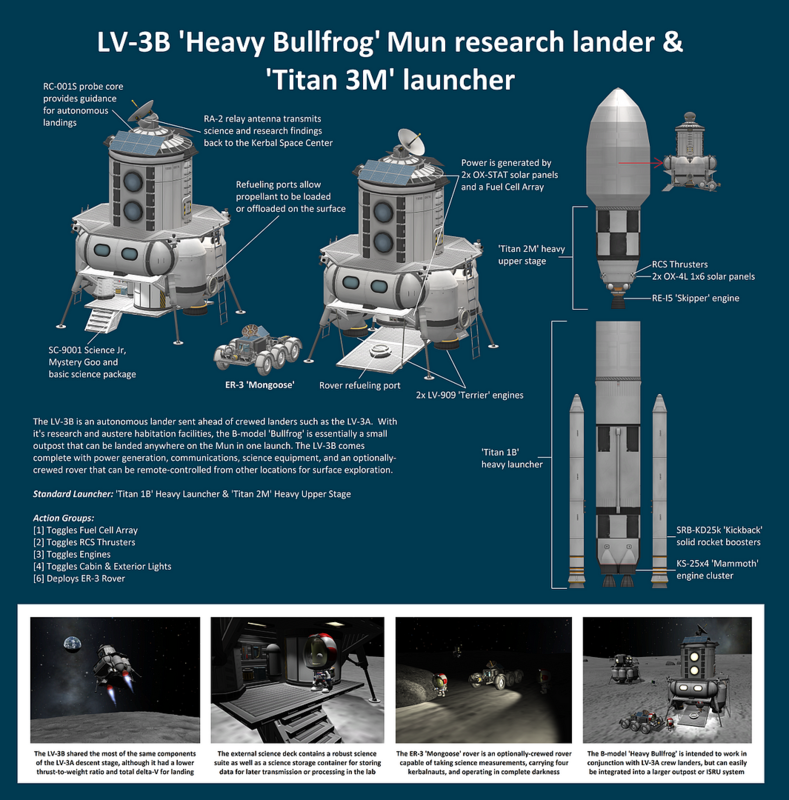 If you have a craft request, there are already a number of experienced KSP builders on the forums that do take requests. However, I don't have the time or motivation to be out-sourced. 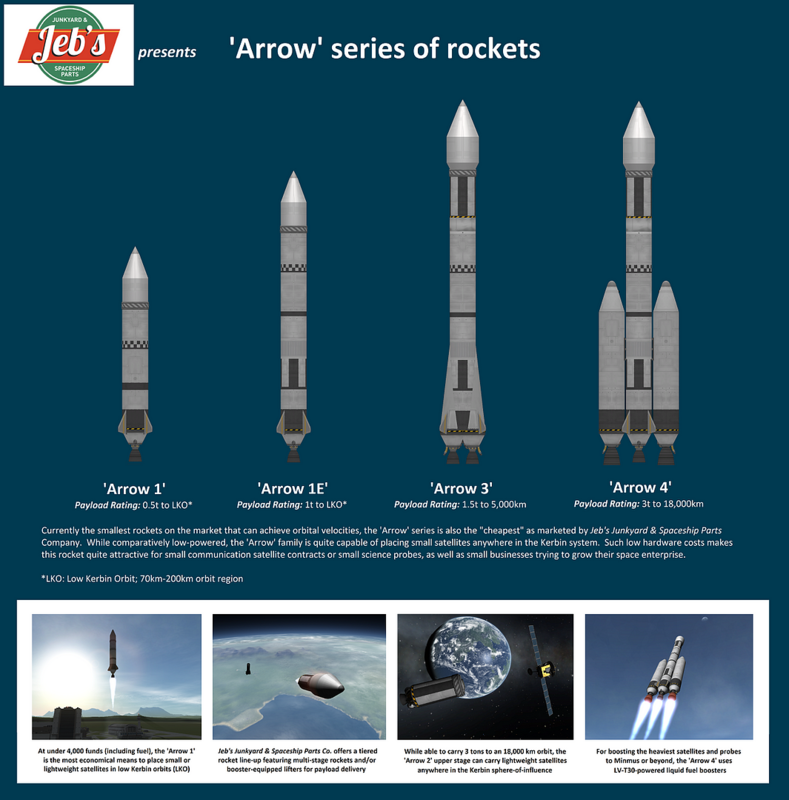 Q: How do you make the brochure-style graphics for each craft download? A: I start by taking screenshots using Kronal Vessel Viewer, then do all the rest manually using Microsoft Paint. Simple and easy. 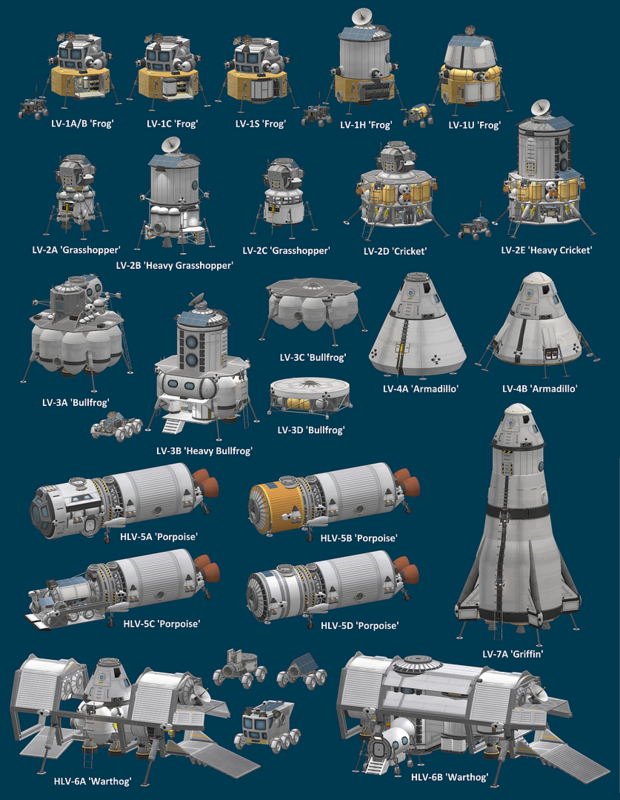 Q: You have too many craft to download, how can I get all of them without dedicating an absurd amount of time clicking away on KerbalX? A: You're in luck! 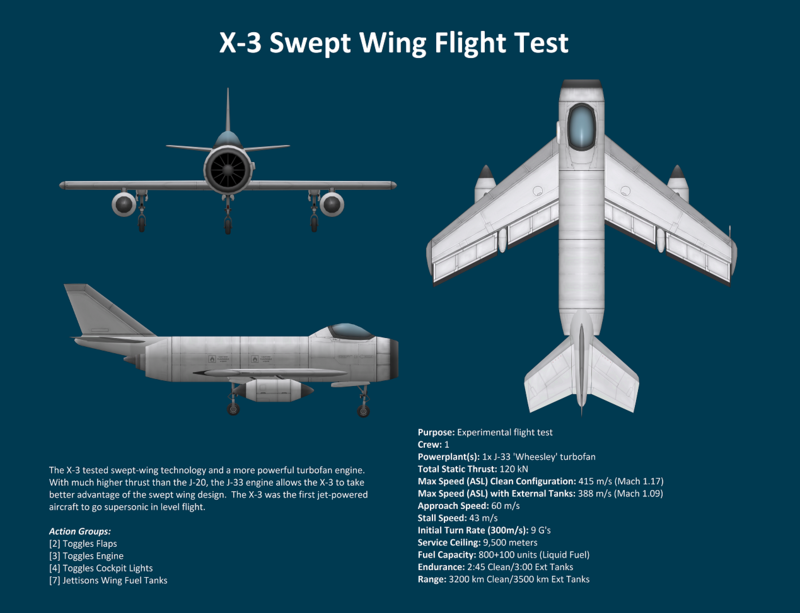 @katateochi (who runs the KerbalX website), was kind enough to implement a feature to enable downloading an entire hanger of craft files. You can find links to groups of craft in the Categorized Bulk Downloads Section just above. Q: I don't understand how to use one of your craft. 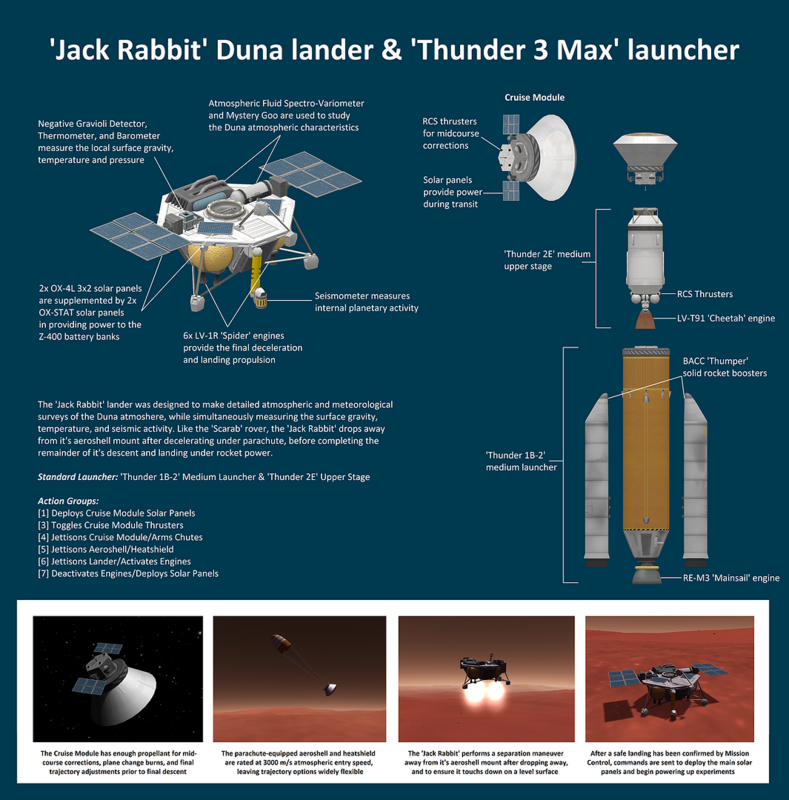 A: I try to be very informative and concise when making the brochure-style graphics that accompany each craft. They're intended to provide other users with basic information to the craft's purpose, action group settings, and other miscellaneous tidbits that hopefully clarify what went into the design. However, after reviewing the craft graphic there are still unanswered questions, feel free to post your question in this thread and I'll try to answer as soon as I am able. Q: One of your craft appears to not be working as intended. A: This is a common comment I see on KerbalX. 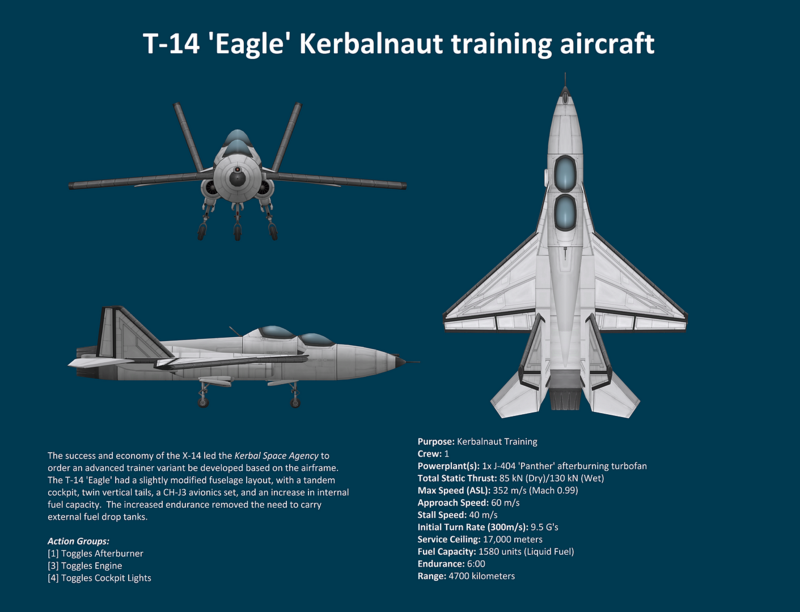 First thing I'm going to ask you to do is try the craft out in a vanilla (stock only) install of KSP. 9/10 times a mod is altering the behavior of the craft or interfering with a designed feature. 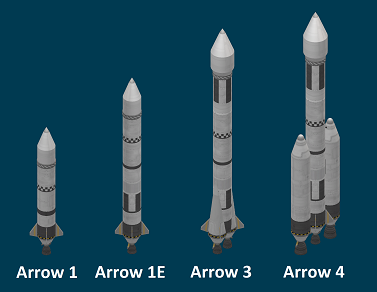 I am not without my mistakes, but I thoroughly test these craft in stock KSP before publishing them on KerbalX. 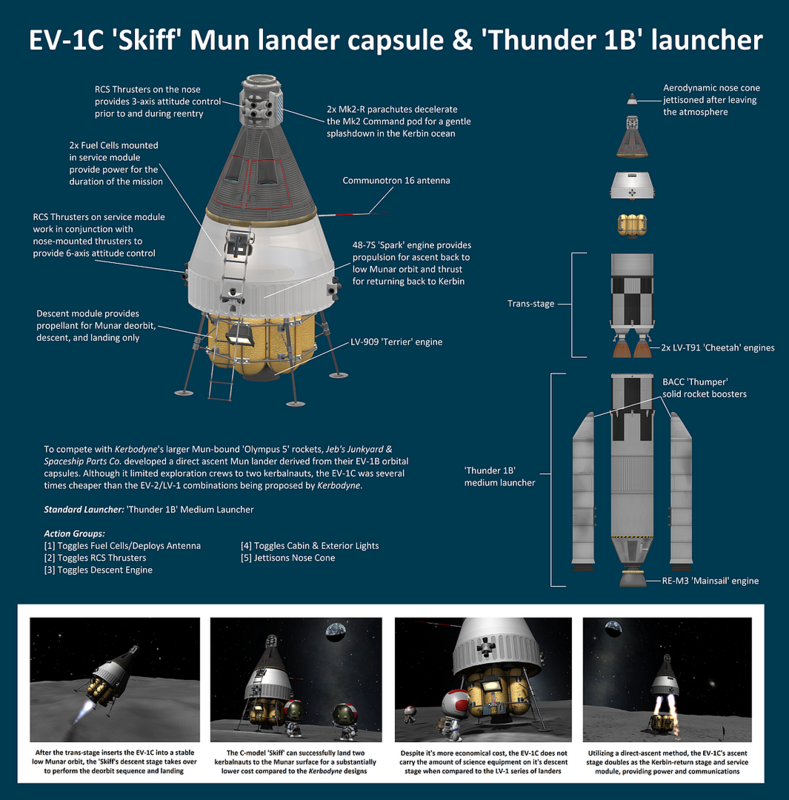 Another reason may be using the craft in a different version of KSP than it was intended. I'm always happy to troubleshoot issues, but the first two questions I will ask are "Do you have any mods installed?" 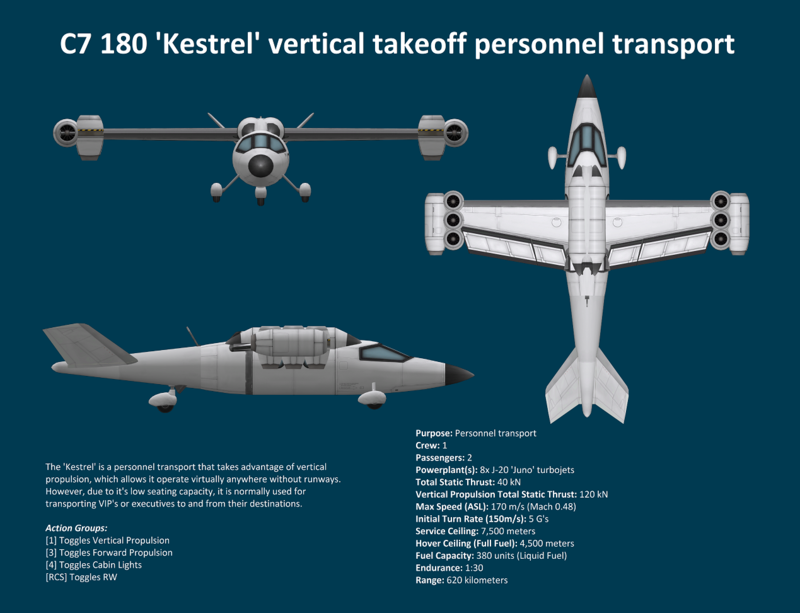 and "Which version of KSP are you running?" 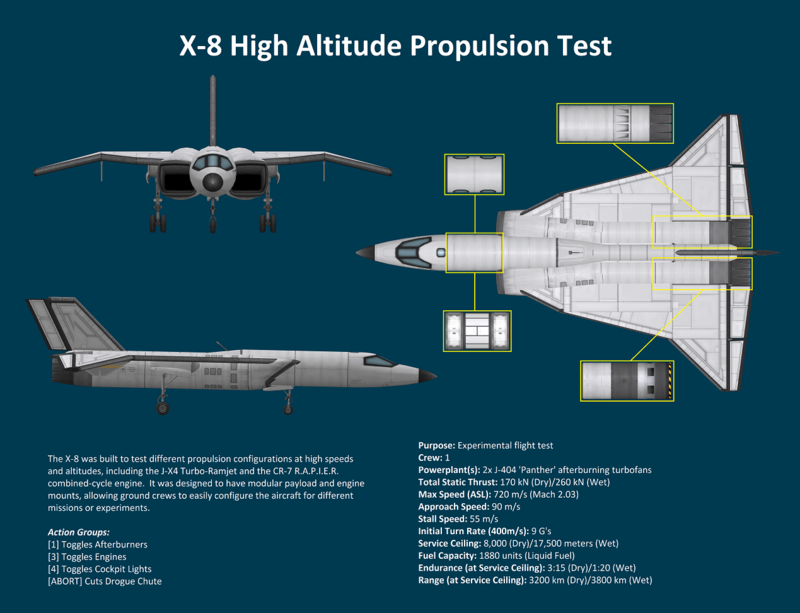 The link to his release thread for the MkIV is below the photos of the 'X-19'. Thanks Raptor9... I've just skimmed through most of that thread. Just trying to make some room to install it now, so many cool mods to try and squeeze into the 3.5Gb (stable) memory limit! That X19 is a thing of absolute beauty! All of the planes are great, but that one is just too awesome! 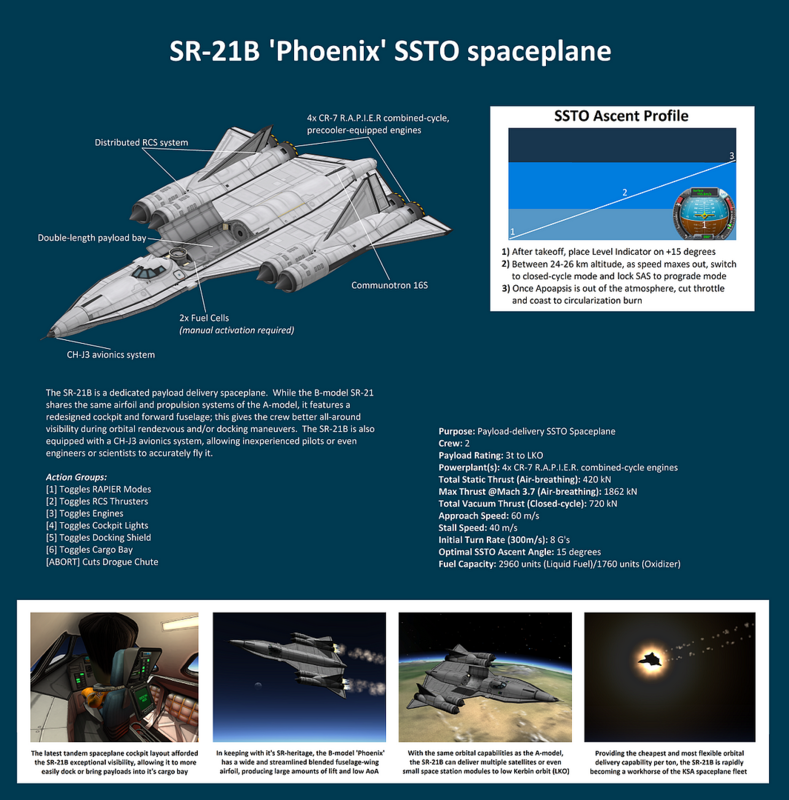 I might have to grab that part pack for a tank-carrying SSTO... It looks really good! Edit. Actually, after finding the thread, it might be a bit small still for the kind of stuff I am going to put there. The X-19 ends up with a bay about the same size as my Quinjet, and I want something that can fit very wide eight-wheelers. But you know, still worth a look so thanks. Yeah, I tried wheeling my mobile surface lab in there, you have to design a 2.5M-based rover with the bay-width in mind. It might be doable, but you have to really consider your wheel selection and placement. You ever see a Humvee inside a CH-47 Chinook? You're talking inches on all sides, and driving it up/down the cargo bay ramp like an inch-worm. 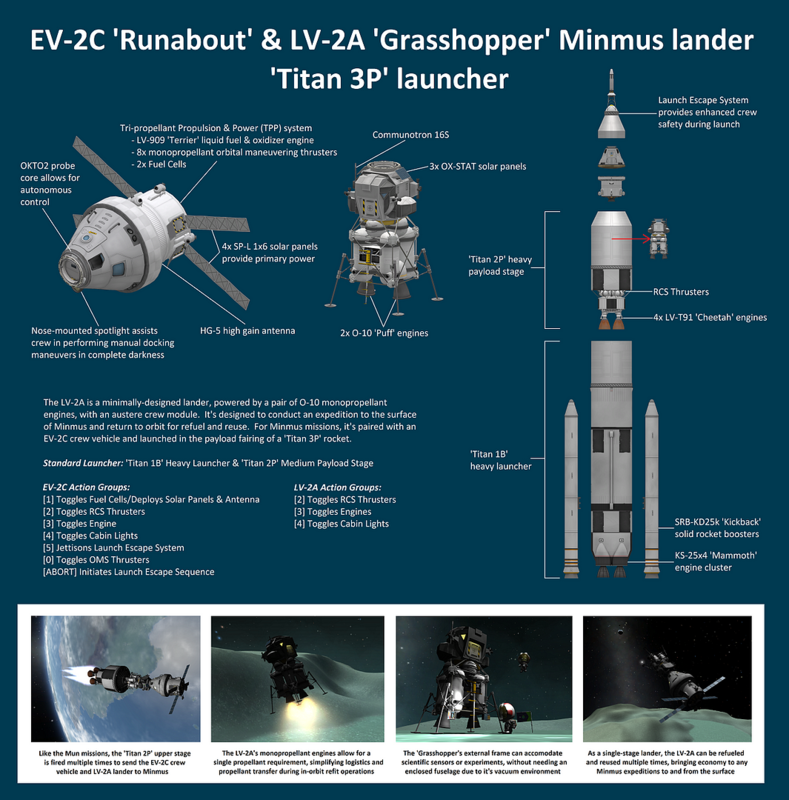 EDIT: @Rune, you might be interested to know that Nertea is considering making lift-fans for a possible atmospheric propulsion pack in his Near Future Tech thread. They might be a good addition to your QuinJet. I'm gonna make a QuinJet with those myself if he decides to do them. Good looking craft there. You should try them in FAR, some of them would actually do quite well. EDIT: Current prototype designations referenced in this post are depreciated after 1.0 redesign of all craft files. 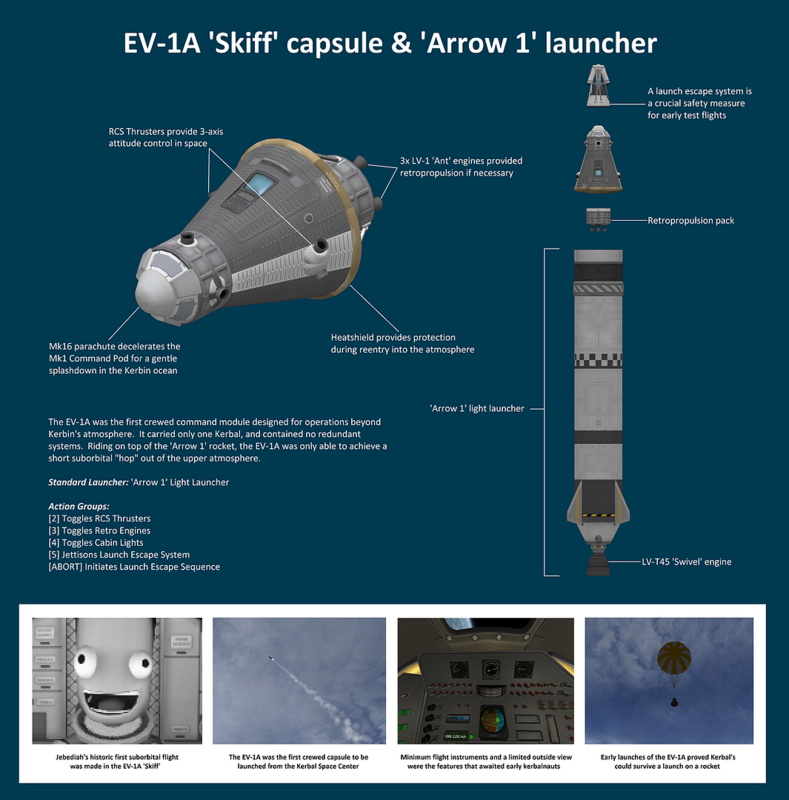 Updated my OP with the re-optimized craft designs after the release of 0.90. Most of the existing designs weren't edited too much, but some were, to take advantage of more precise airfoil orientation and angles using the editor gizmos. 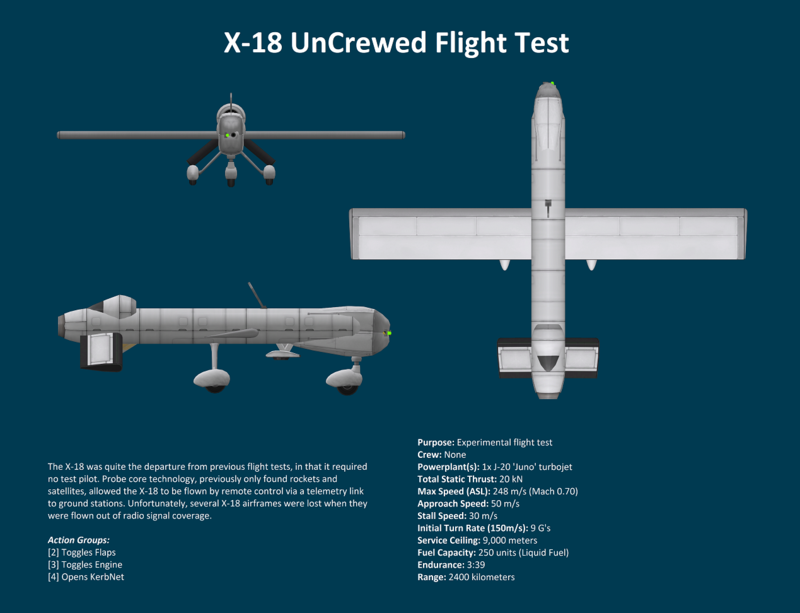 The X-19 was redesignated as the HV-X, and a lightweight drone was inserted. 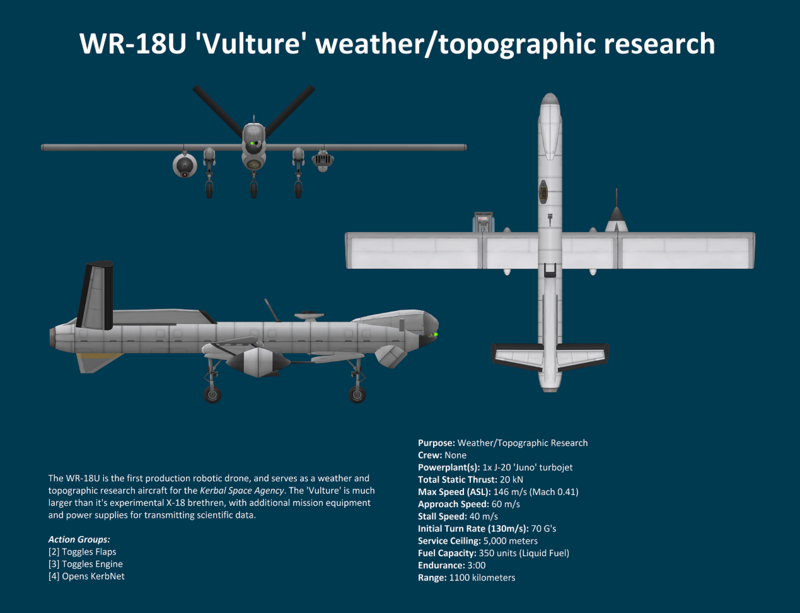 Additionally, three more designs (not including the X-19 drone) were introduced. 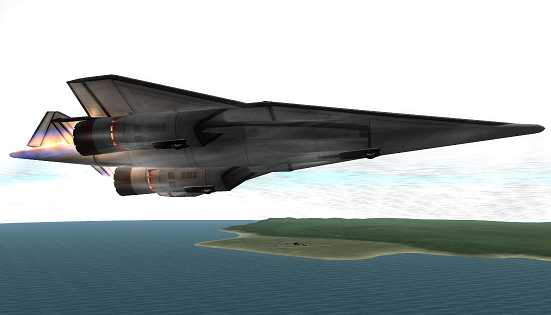 A modern X-17 with the remade Mk3 parts, and two advanced spaceplanes with VTOL capability using stock parts. 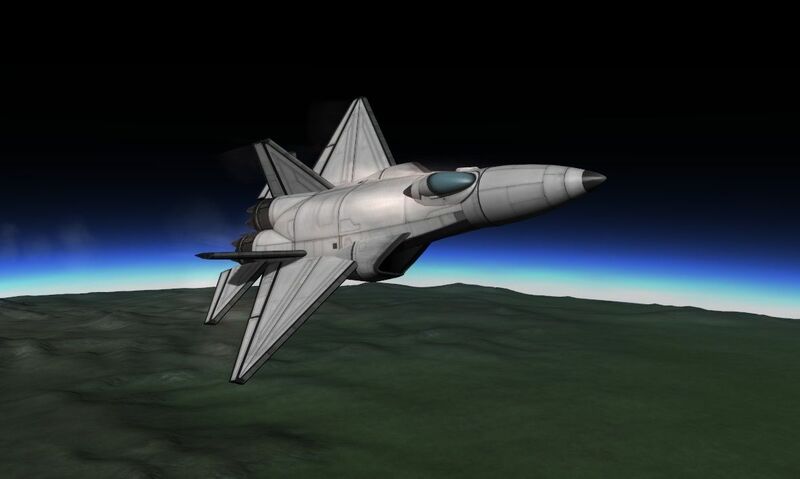 Here's a publicity screenshot of the X-21 using Lack's Mk3 tail ramp from his STock eXtension mod. I threw it on there for this photo since Squad hasn't released any tail ramps for the Mk3 parts (yet?). 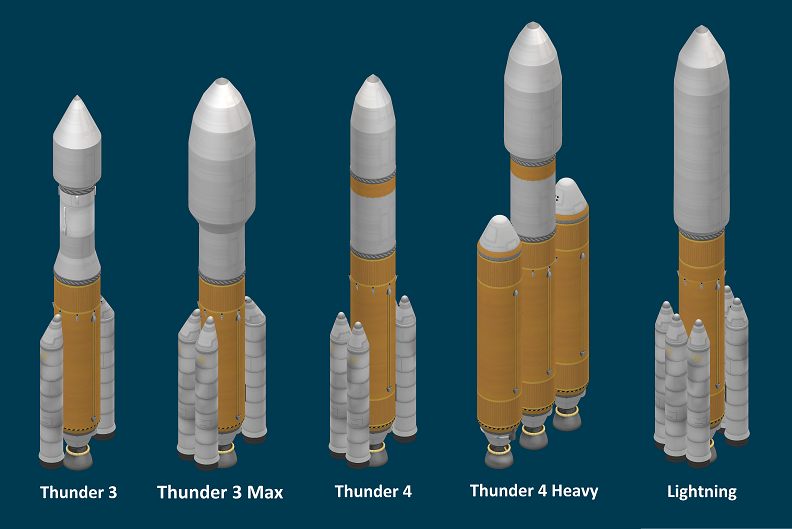 A try to keep away from mods with these designs, and I'll probably use an X-21 with an inverted cargo bay to drop 2.5m modules to the surface since they won't fit through this anyway. But it still looks cool. 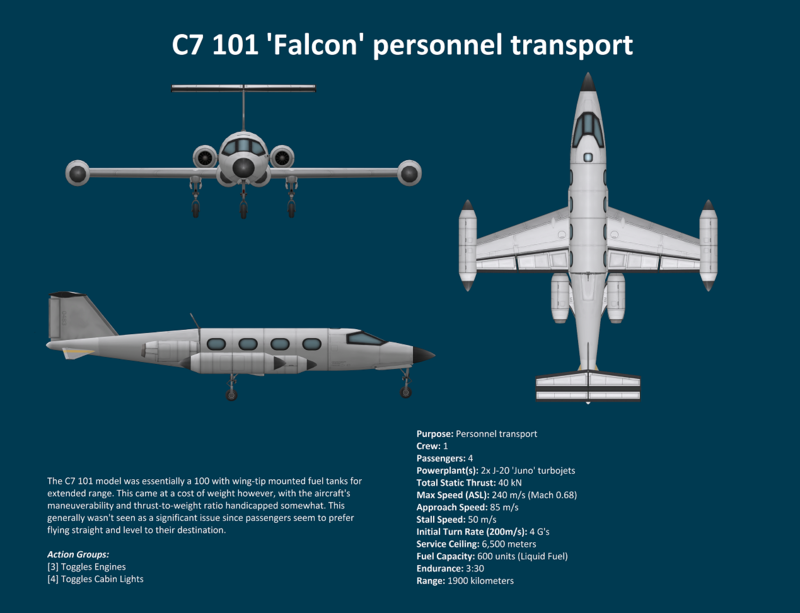 Those crafts look awesome, and I like the idea of putting multiple aircraft in the SPH like that! I wish they make that mk3 ramp door a stock thing. Nice! 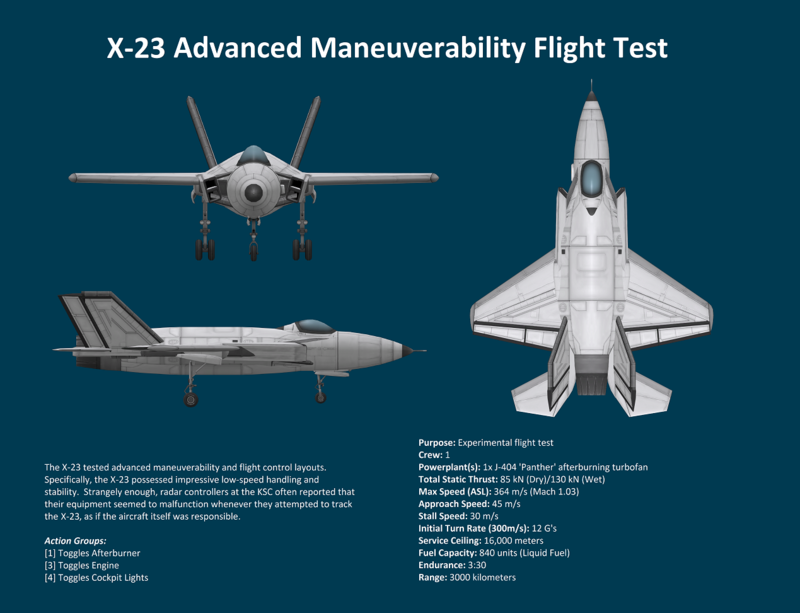 Can you get good maneuverability on the X-12 without all-moving pitch surfaces though? I would have thought that the fixed parts of the tail would make it too stable. 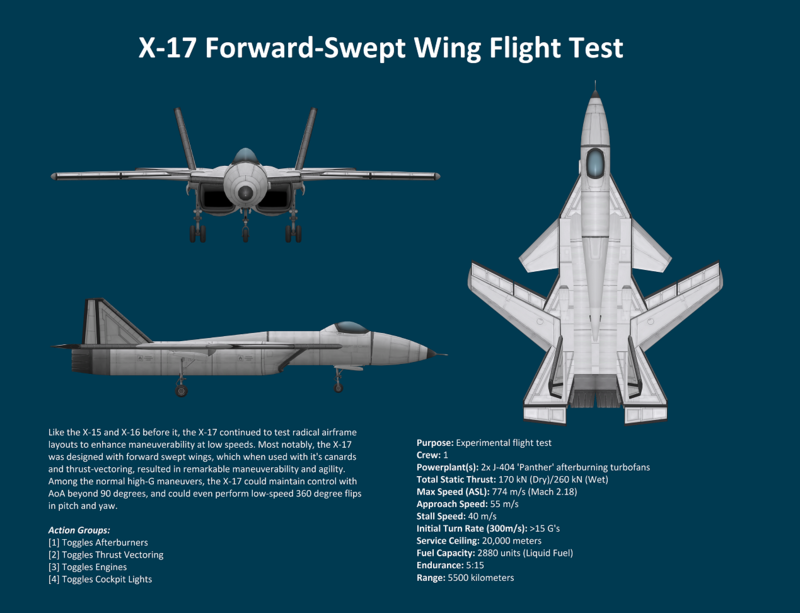 The X-12 isn't nearly as maneuverable as the X-13 since, like you said, it lacks all moving tail surfaces. However, it's still able to pull off 6-12G's, depending on what speed you initiate the pitch back between 200-350 m/s. In real-world terms, that's really good. The X-13 can max out in the red portion of G-meter easily during the first several seconds of the turn, and that's without thrust-vectoring (gimbal is locked, the X-12's aren't). 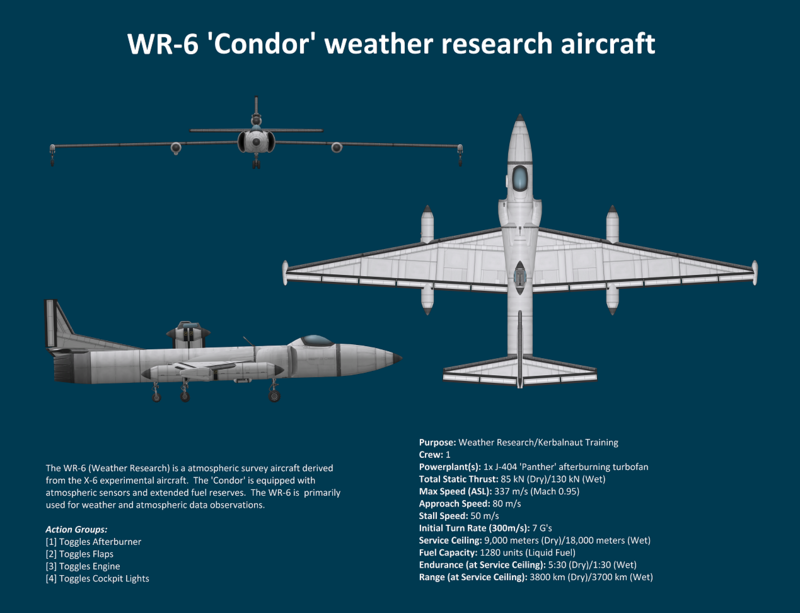 It should also be noted that the forward most sections of both aircraft, the long adapter and even the nose cone, can hold fuel, but normally don't for most flights. 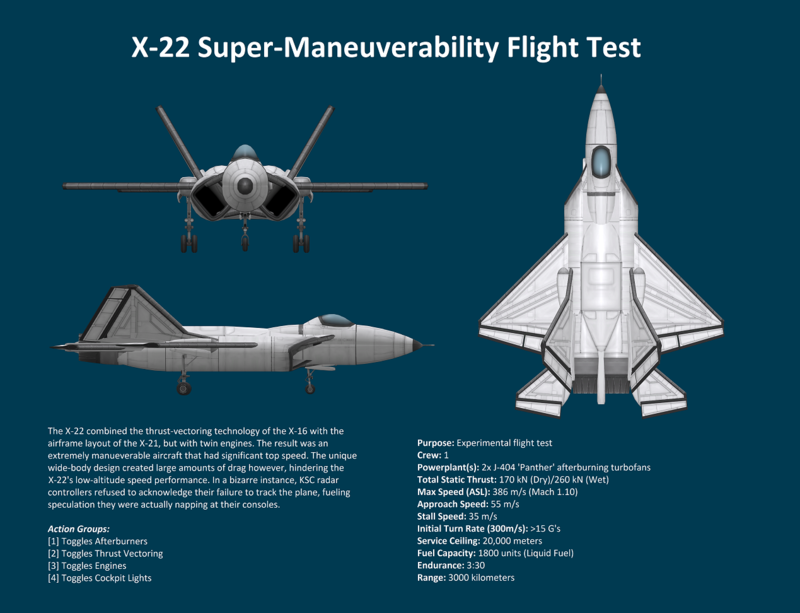 They can be fueled for longer flights while maneuverability takes a penalty, however. At least until you burn off some fuel. 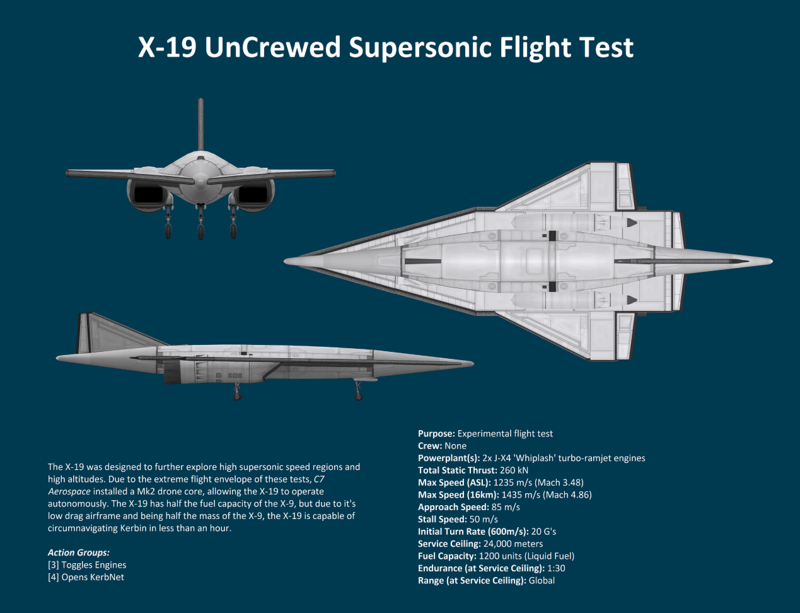 For fictional immersion, I justify these setups in that the X-12 was built for speed and stealth, whereas the X-13 was more in focused on maneuverability and cheaper costs. Not to mention that real-world fighter planes are restricted in their maneuverability when carrying external fuel tanks or heavy ordinance (however that is due to structural limits, not CG issues). 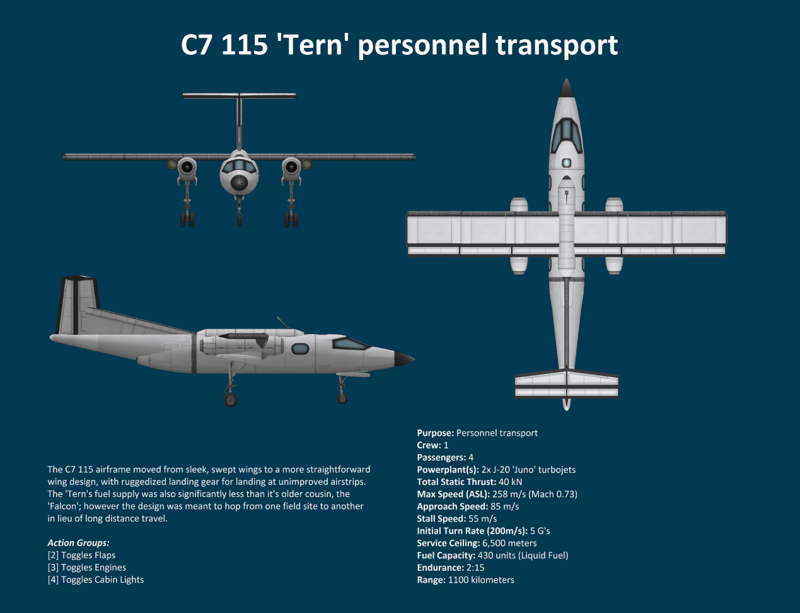 While the CV-15 revolutionized the air logistics mission by providing long-range transport without the need of a runway, there was limits on what it could do. 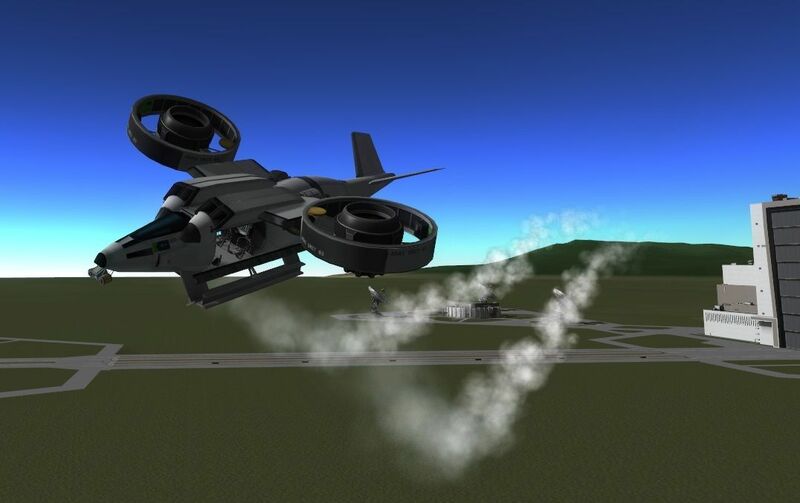 It's VTOL capabilities gave it flexibility, however it suffered from a poor power-to-weight ratio when landing vertically with a heavy payload. The XV-M (Mobility) was to be the baseline behind the concept of vertical propulsion. 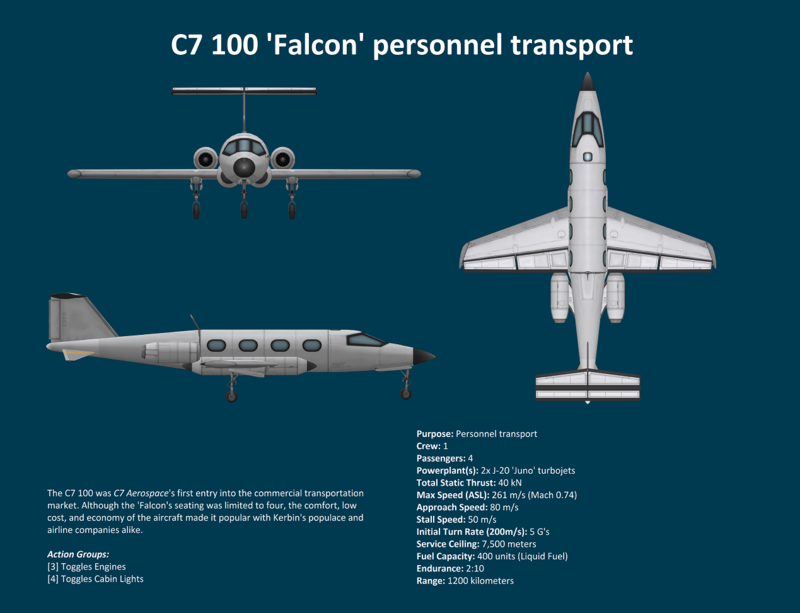 It's purpose was to provide the ability to carry personnel or cargo and deliver them safely and reliably anywhere big enough to land the aircraft. The XV-A (Attack) was a design aimed for purchase by the KDF. 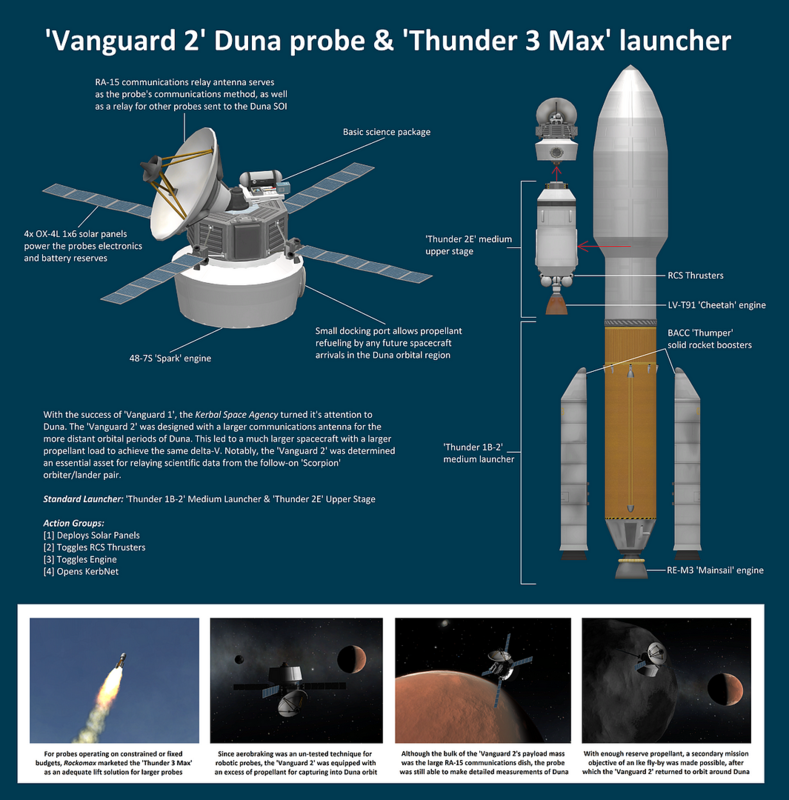 While it was heavier than it's unarmed counterpart, the XV-M, it had a 60% increase in fuel capacity. 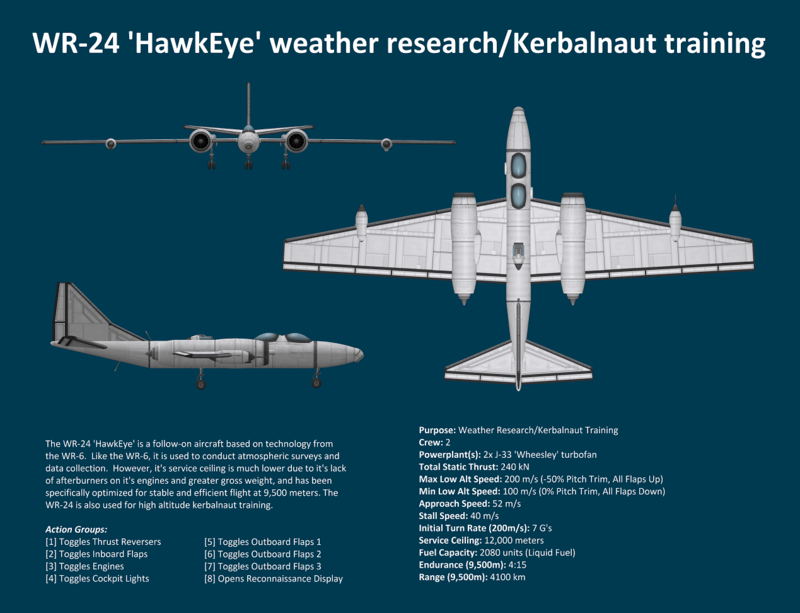 Further, due to many commonalities in design with the XV-M, namely the propulsion and portions of the fuselage, this aircraft became an attractive prospect for the KDF from a logistical and pilot training perspective. ...and subscribed! These are amazing. 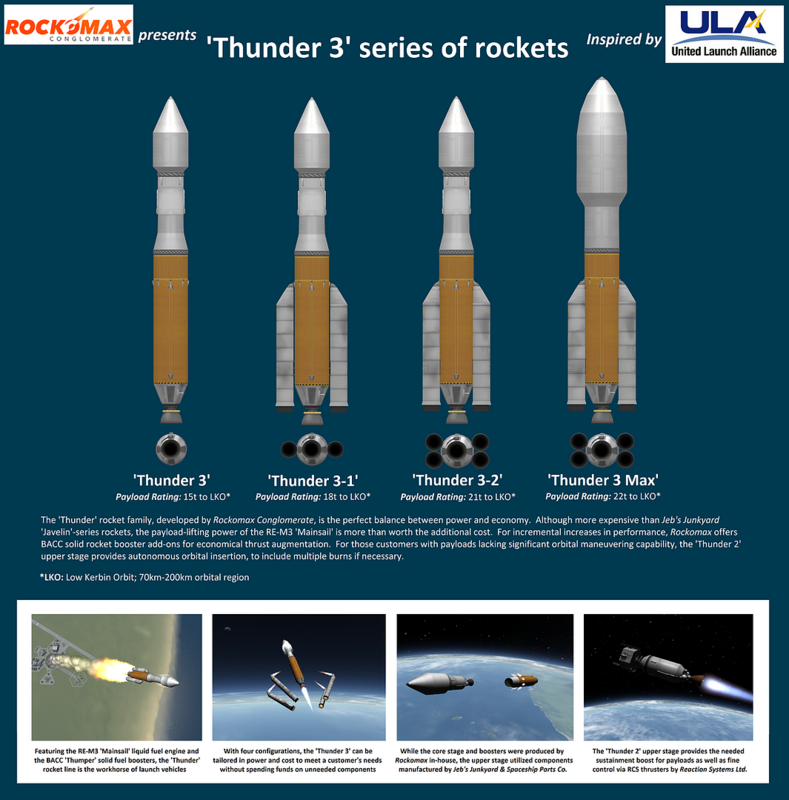 After the successful flight tests of the XV-M and XV-A concept demonstrators, the engineering team at the SPH RAC cell began designing a larger, more powerful version of the XV concept, the XV-H (Heavy). 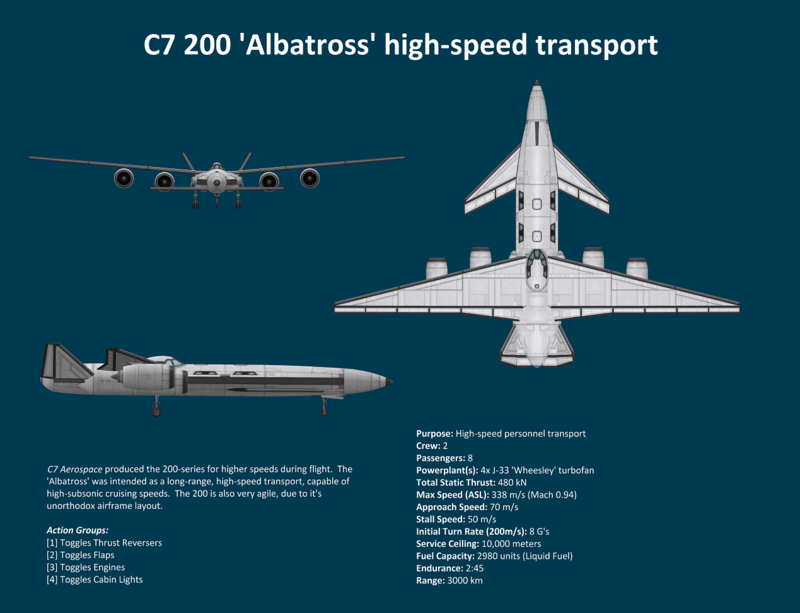 This airframe would have twice the power of the previous designs, and have a pair of augmentation engines for horizontal propulsion, giving it dash speeds far exceeding the top speeds of the M or A variants. 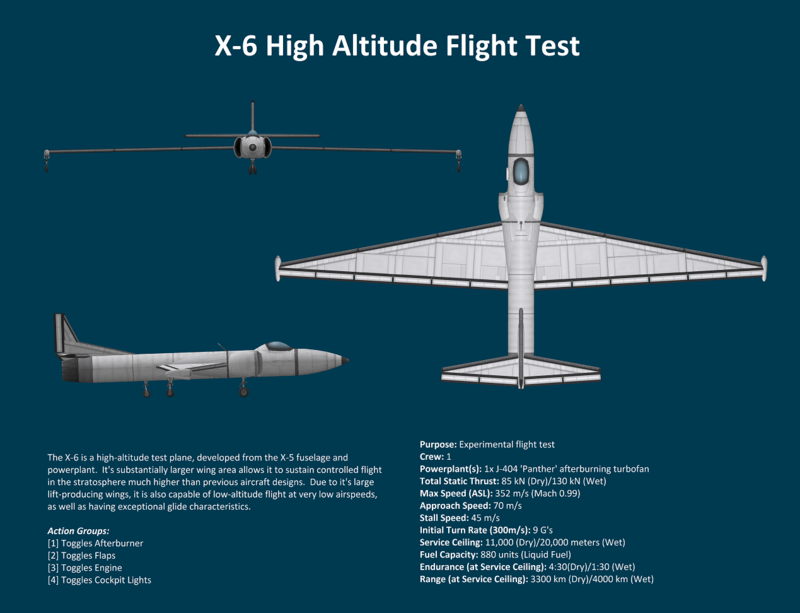 The XV-H, after construction, was tested to have a max takeoff weight (MTOW) of 40 tons, which equated to 10 tons of payload available at sea level if fully-fueled. Are these not available for download?